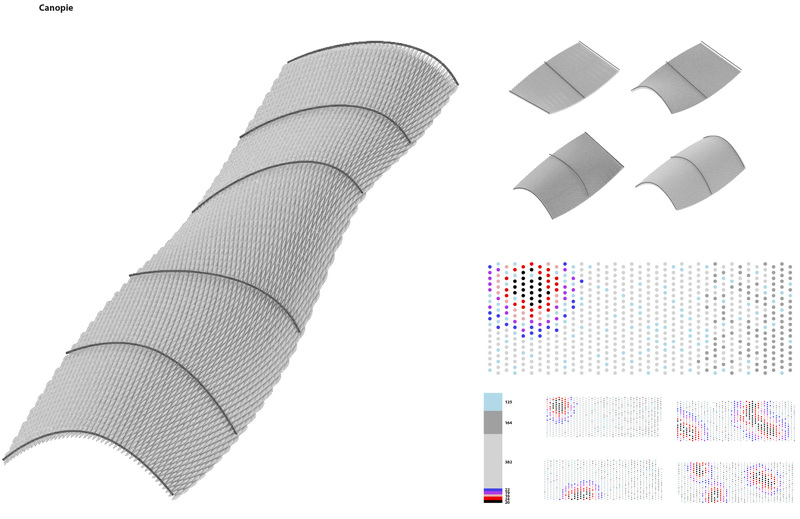 Parametric Design and Computation with Grasshopper in Portuguese. 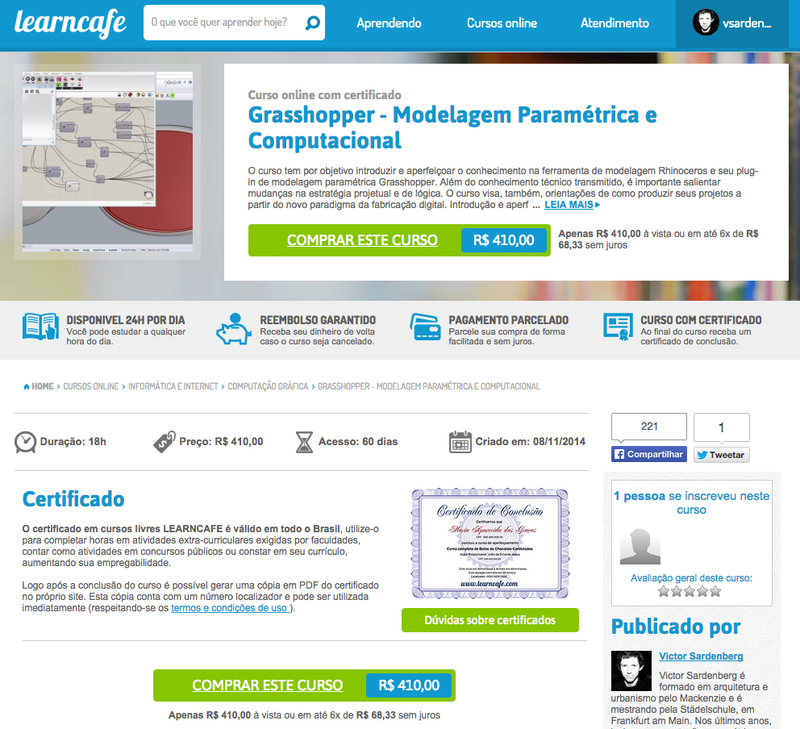 Available at this link. 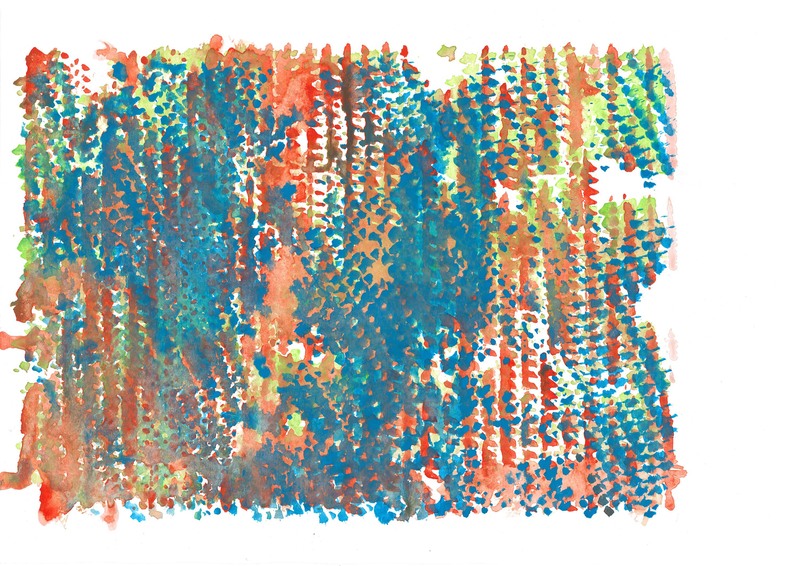 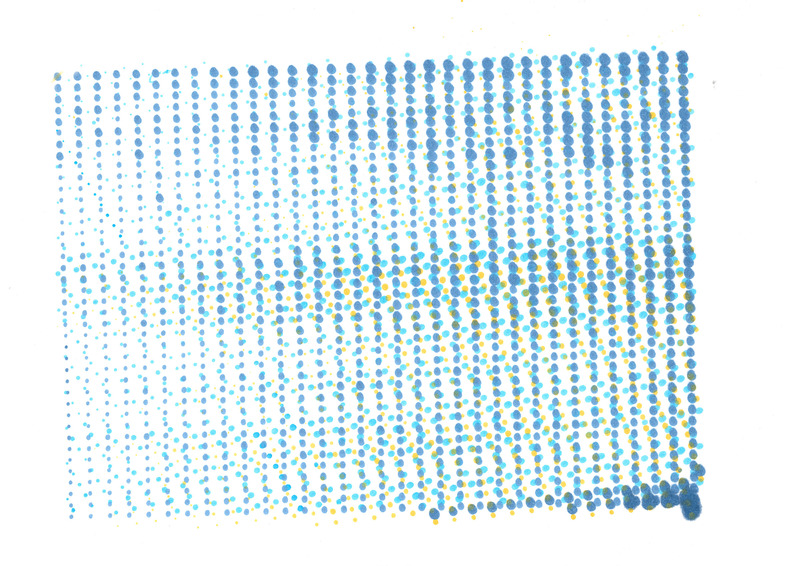 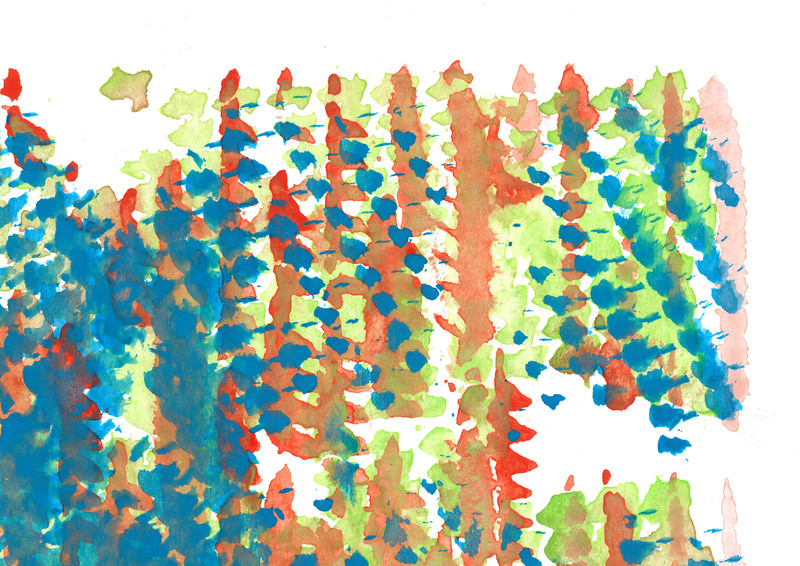 After analyzing different brush techniques of 20th Century painting, students simulated Pointilism, Impressionist and Op Art visual effects. 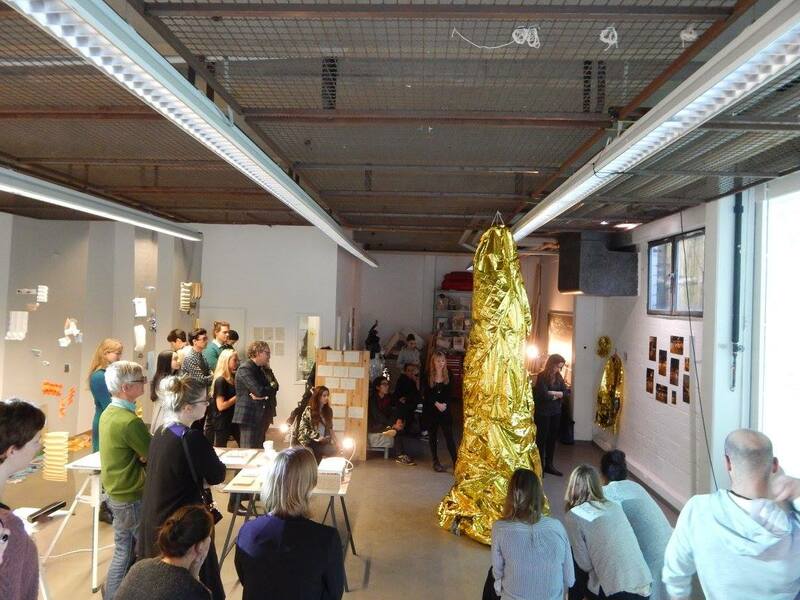 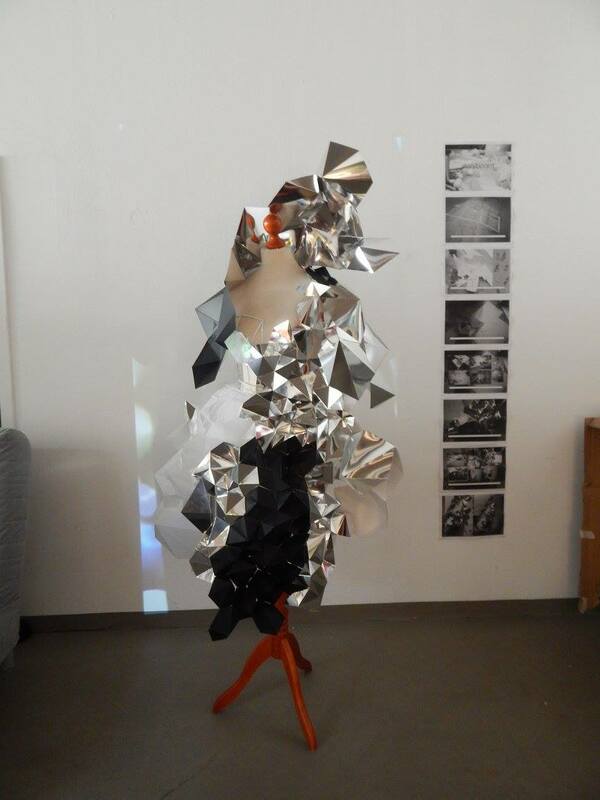 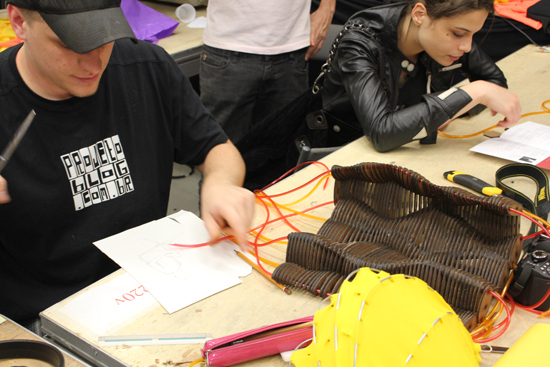 Participants produced their on actuators and set of instructions to create abstract and figurative paintings. 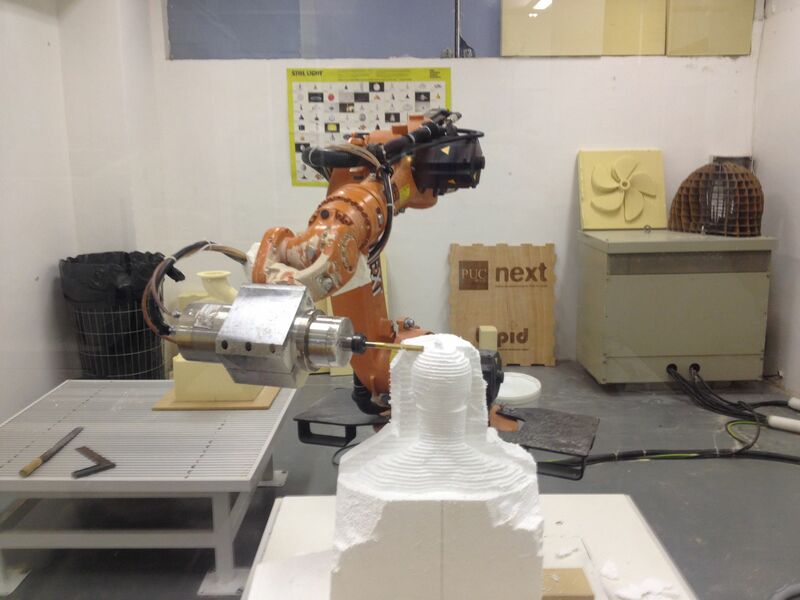 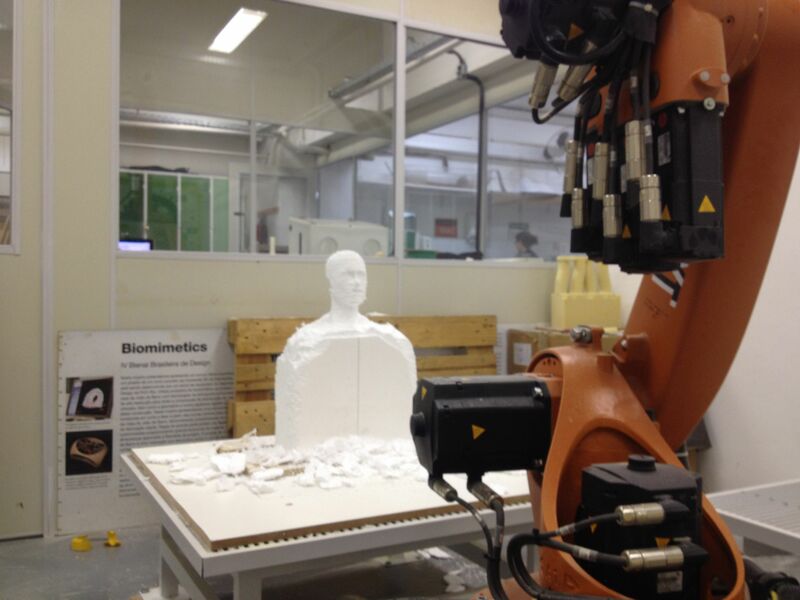 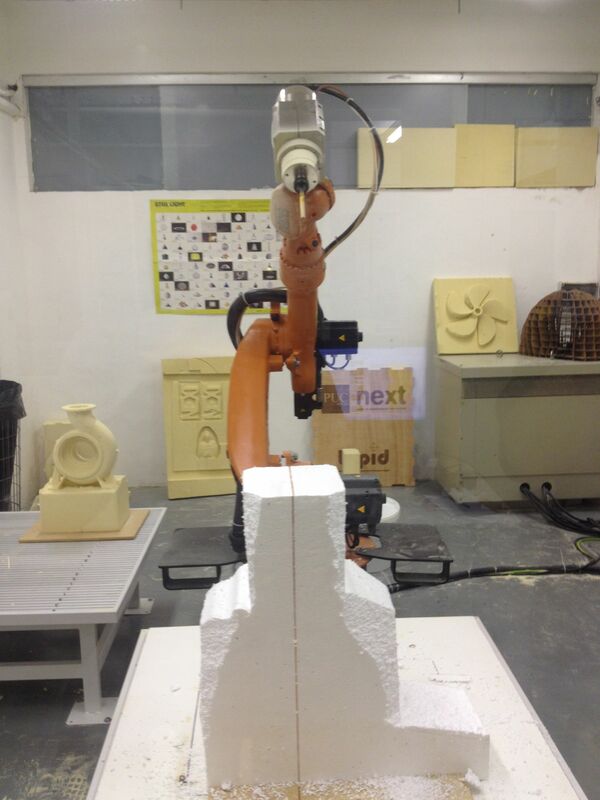 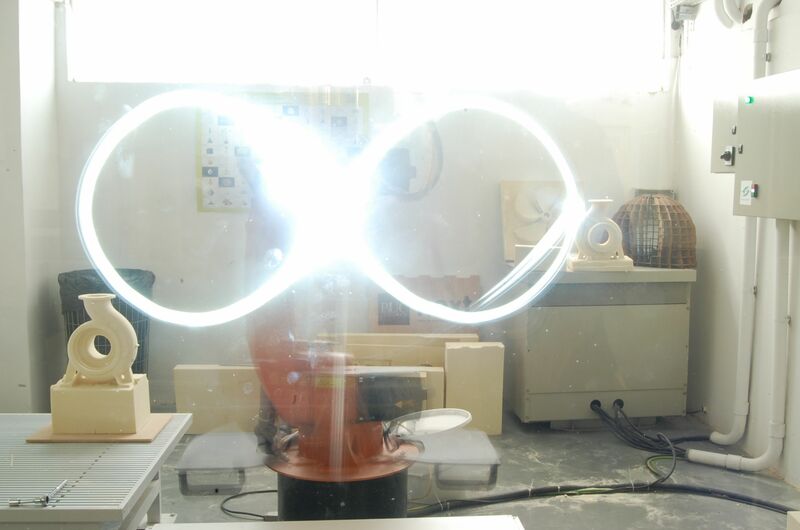 Introduction to 6-axis robot programming for B.Arch. 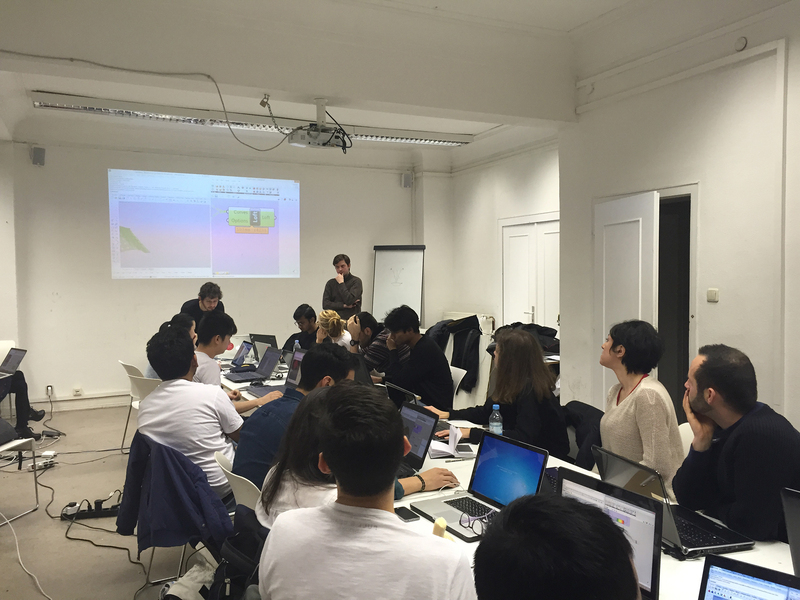 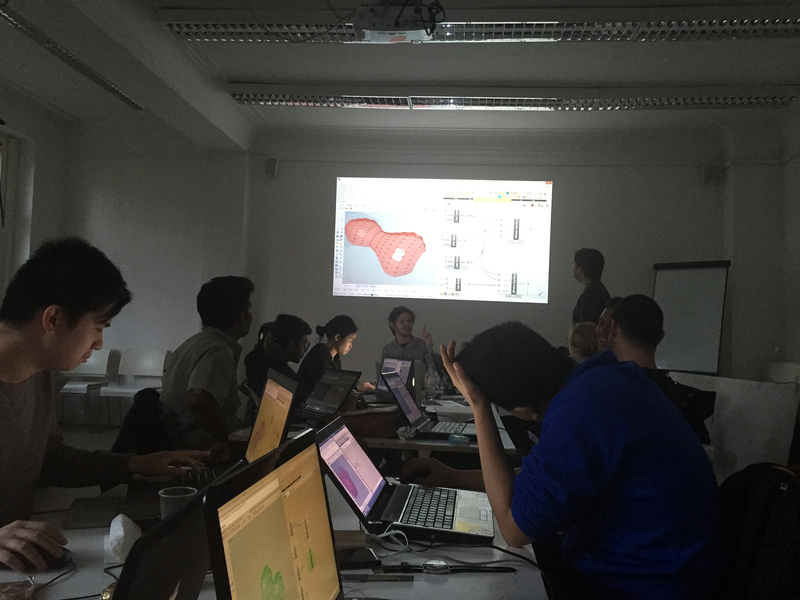 and M.Arch students at dMA (digitale Methoden in der Architektur - Prof. Mirco Becker), Leibniz Universitaet Hannover. 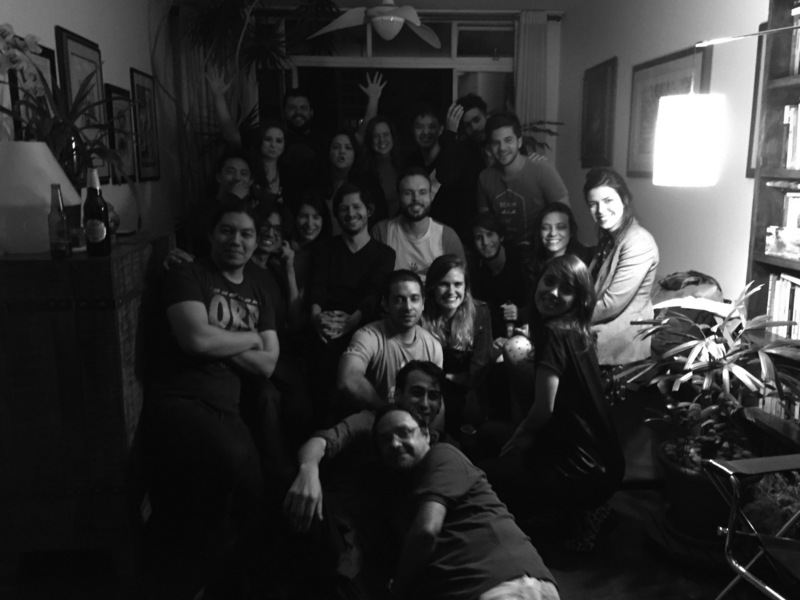 WS 2017/18. 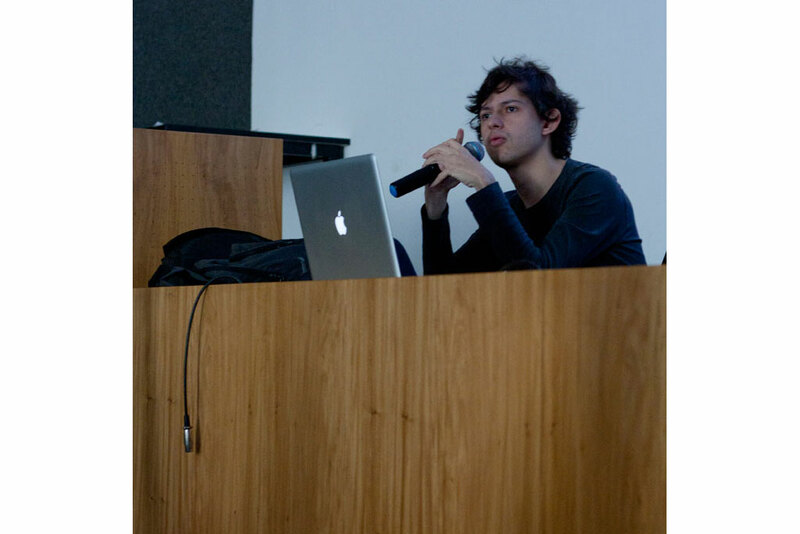 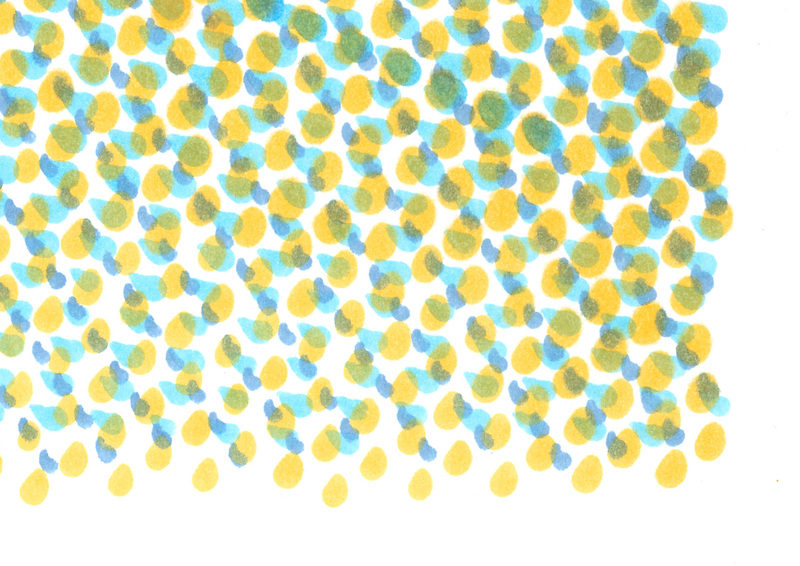 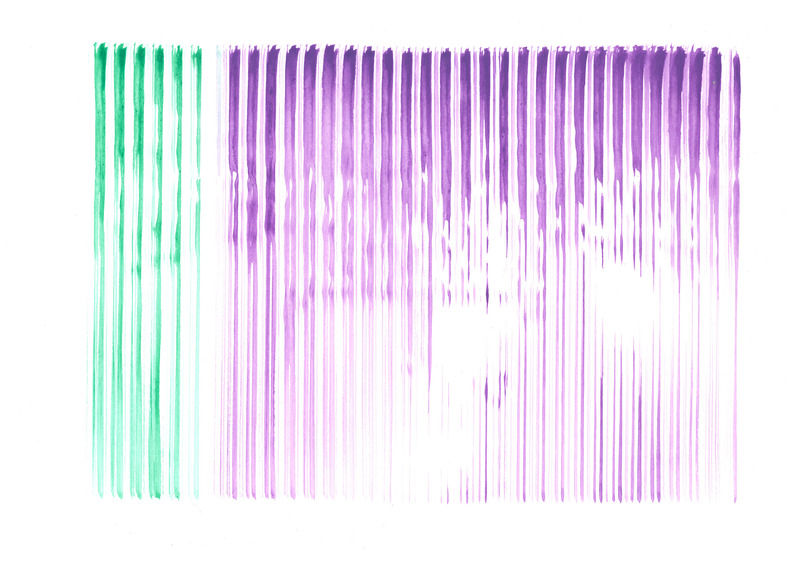 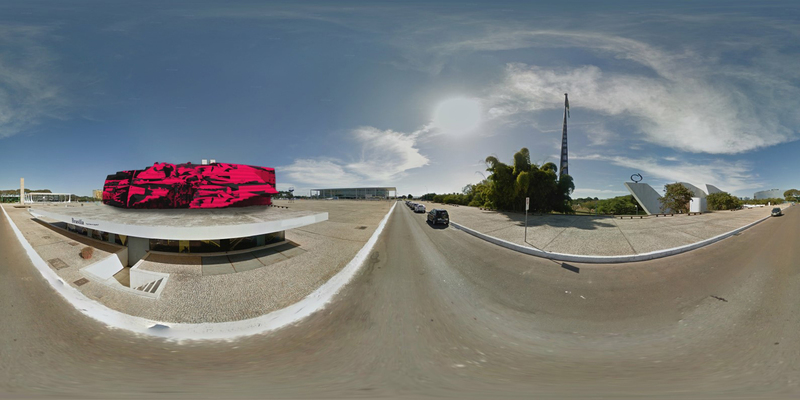 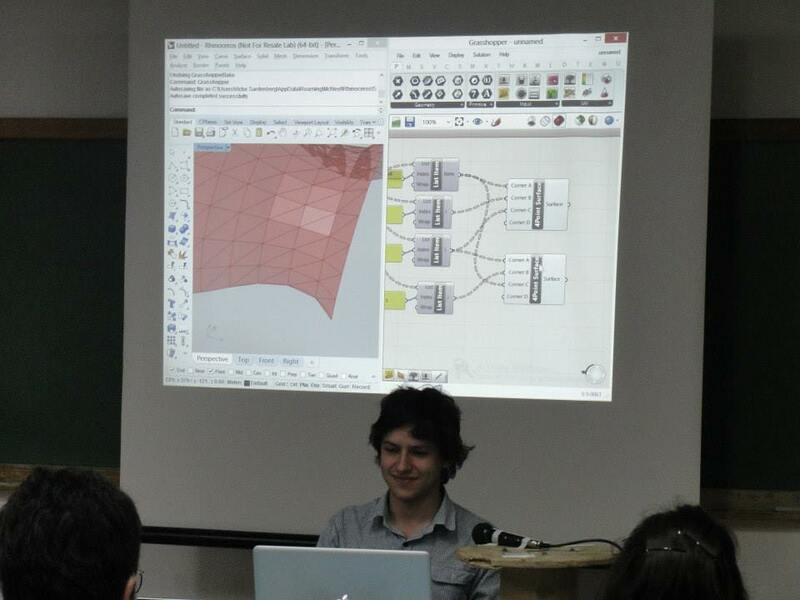 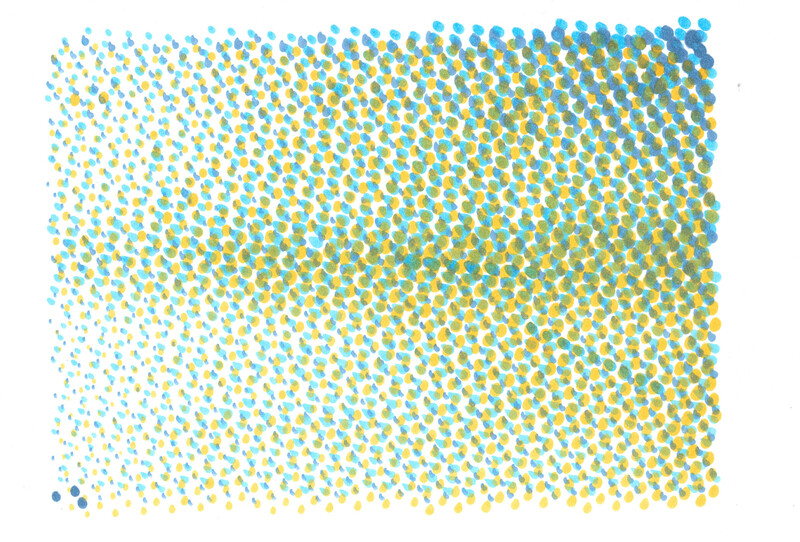 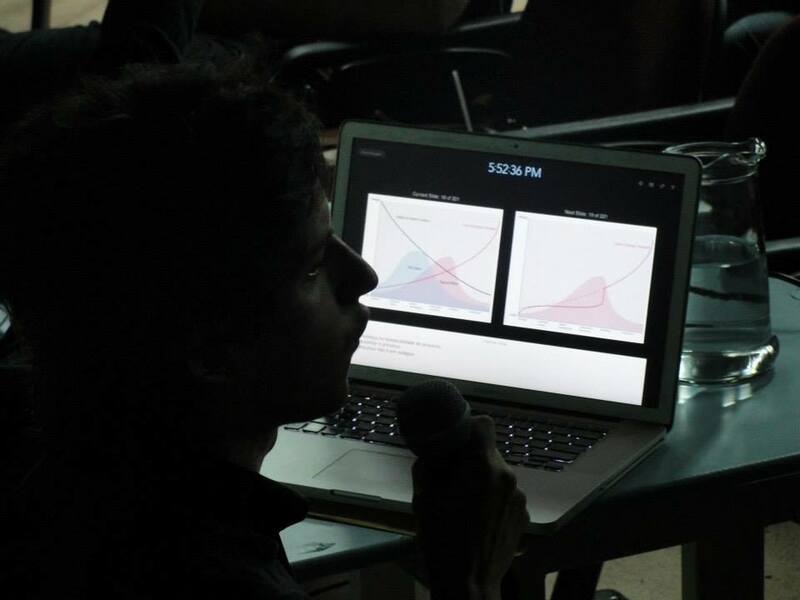 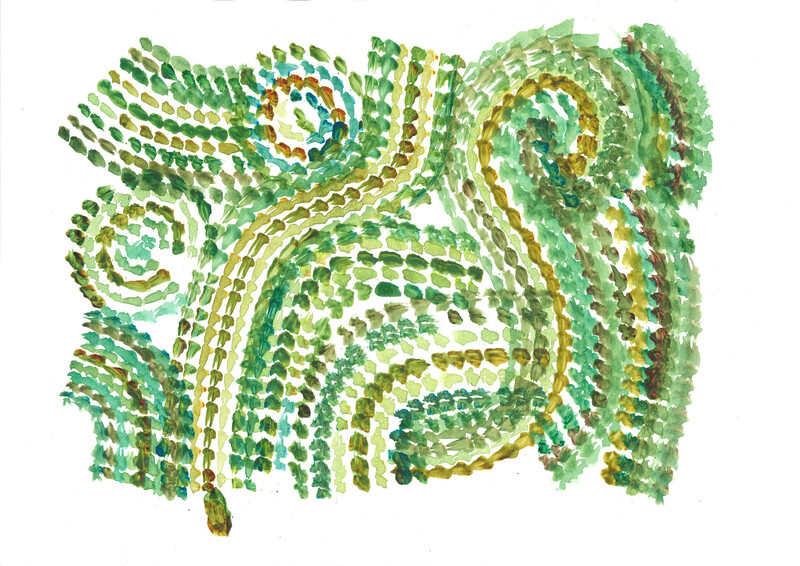 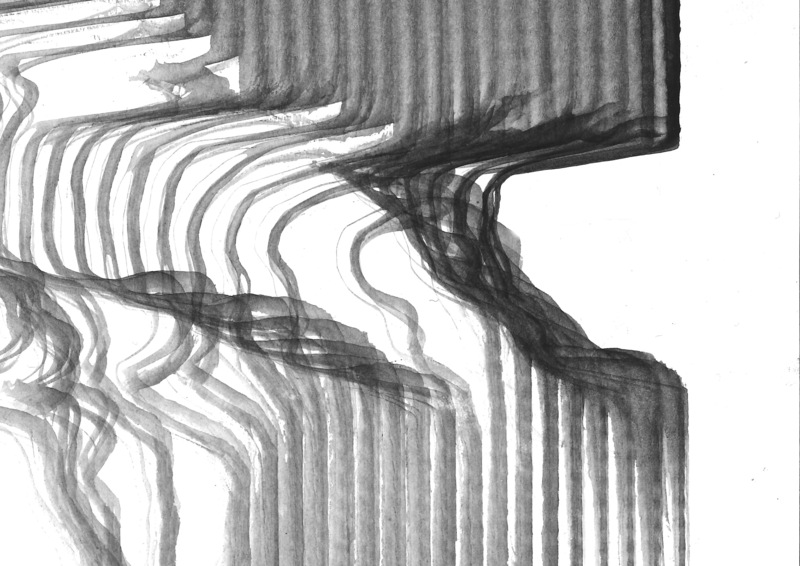 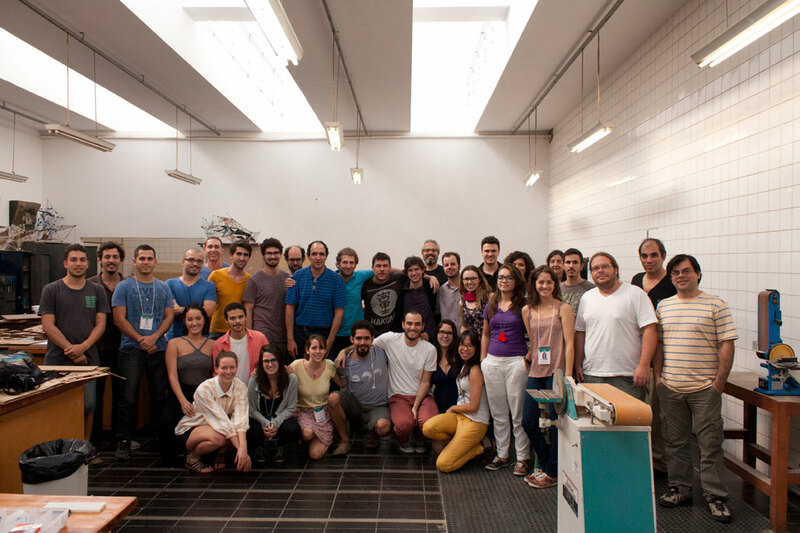 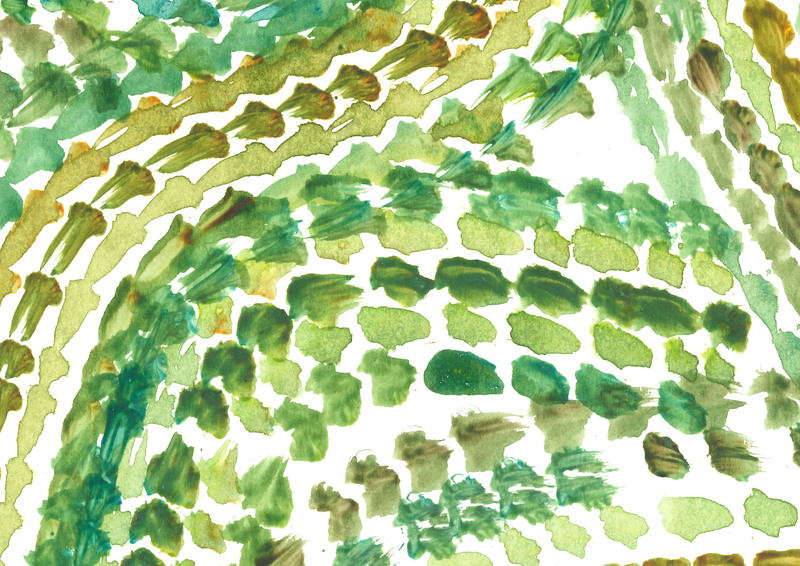 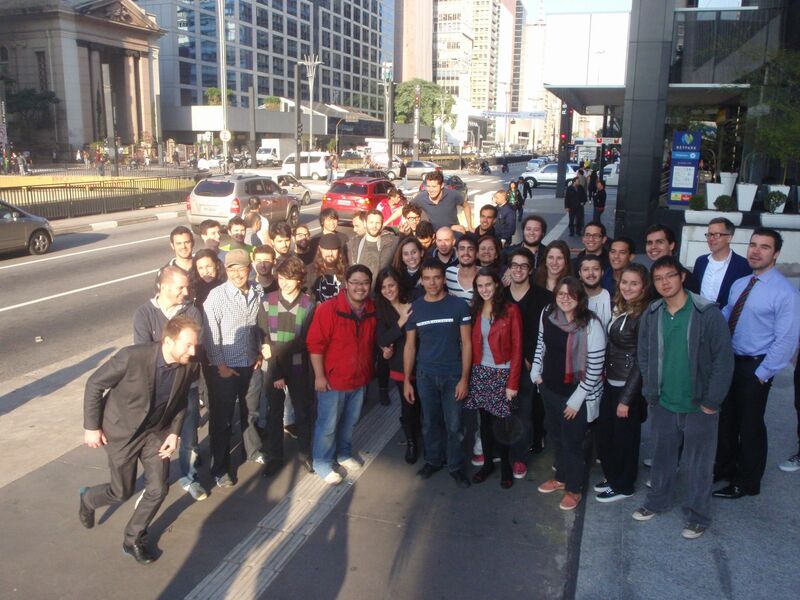 Em Busca da Forma (Searching for Form) was a week long workshop in Rio de Janeiro dealing with Generative Algorithms. 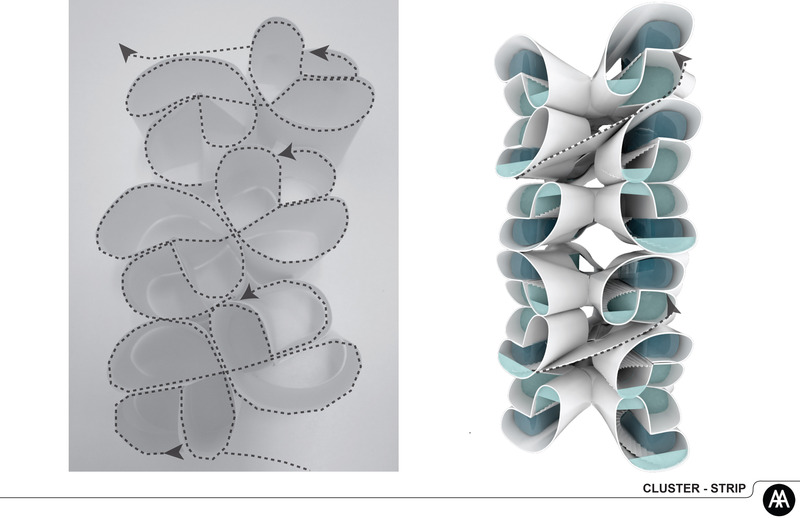 Systems like CA, L-Systems, Genetic Algorithms and Shape Grammar were explored in small scale projects (3m x 3m x 3m) in such a way that it's possible to compare its products and effects. 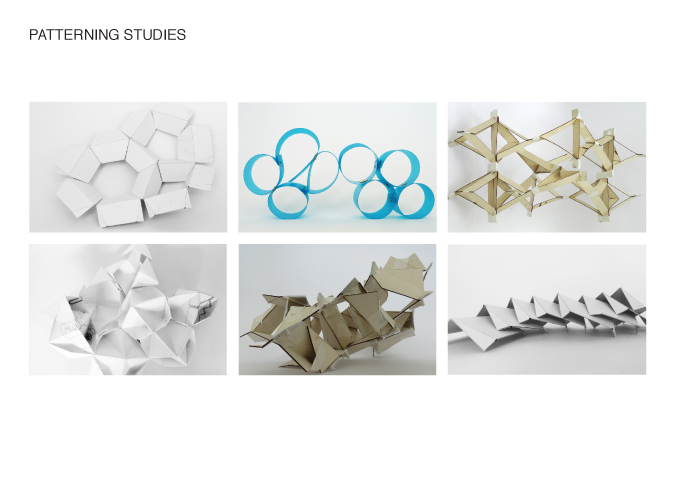 A paper will soon be published. 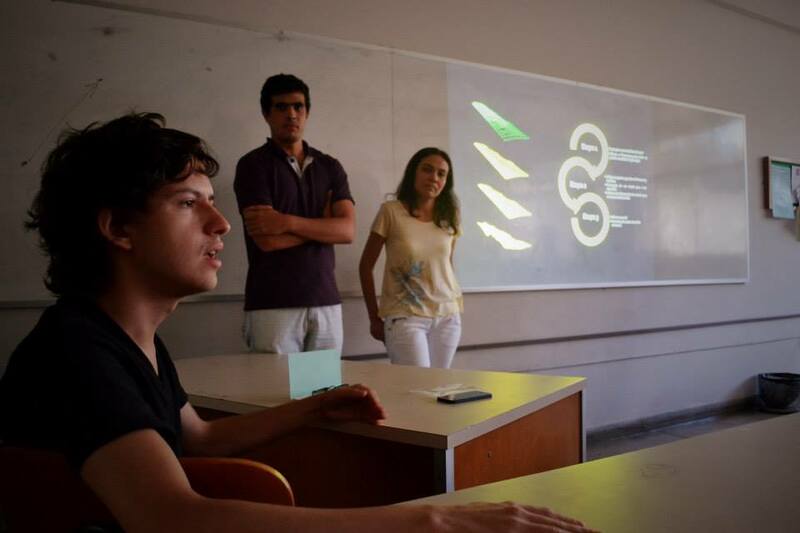 Tutors: Gonçalo Castro Henriques, Ernesto Bueno, Lucas de Sordi, Jarryer de Martino and Daniel Lenz. 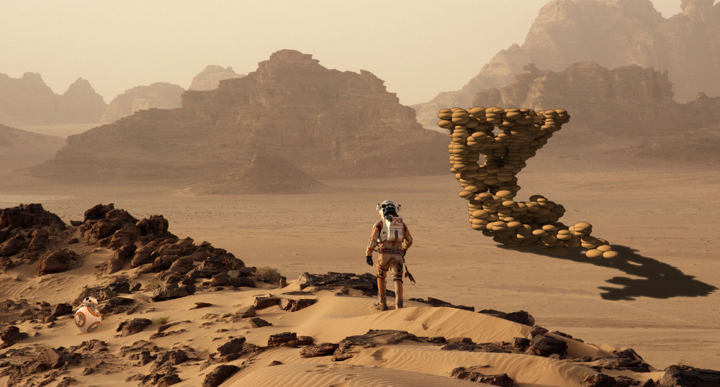 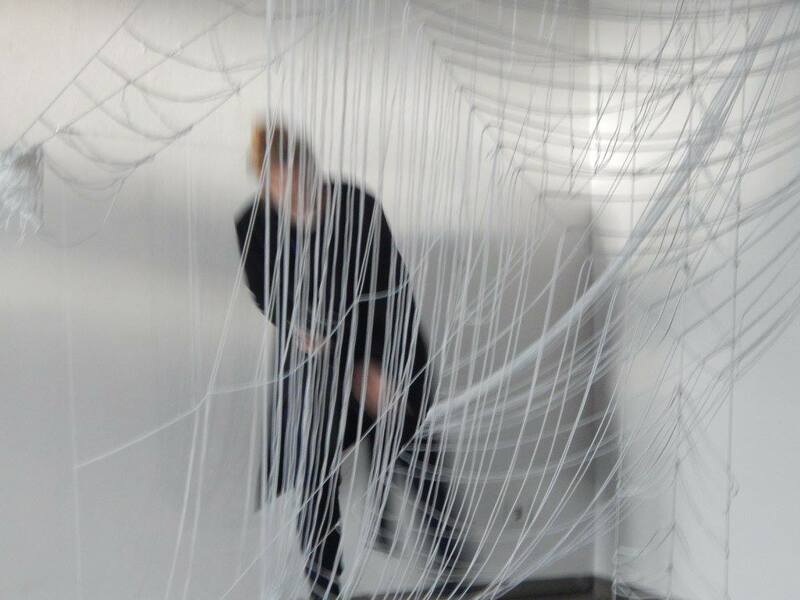 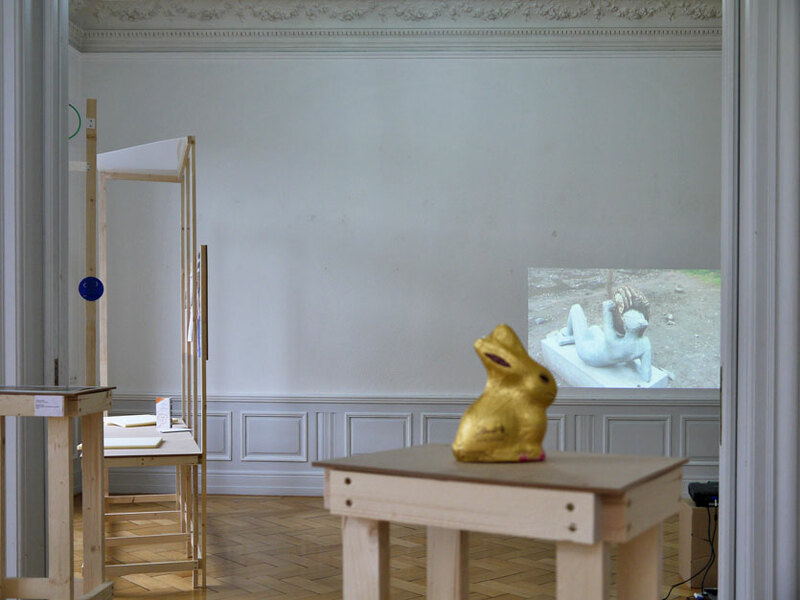 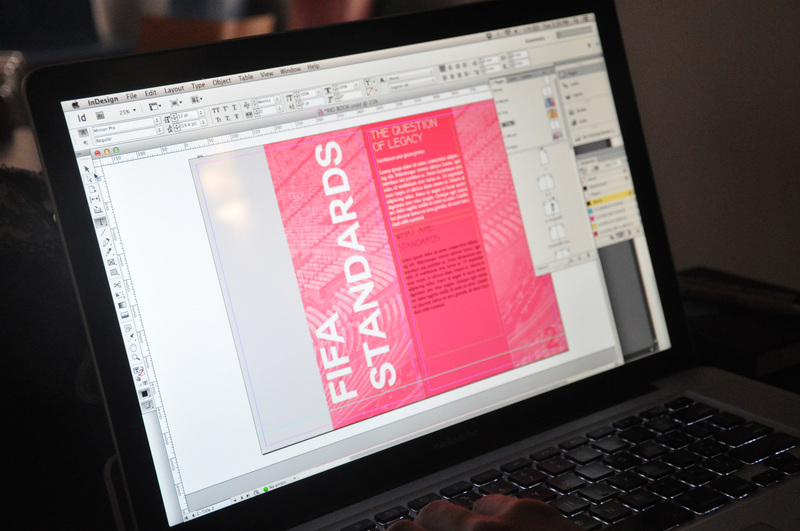 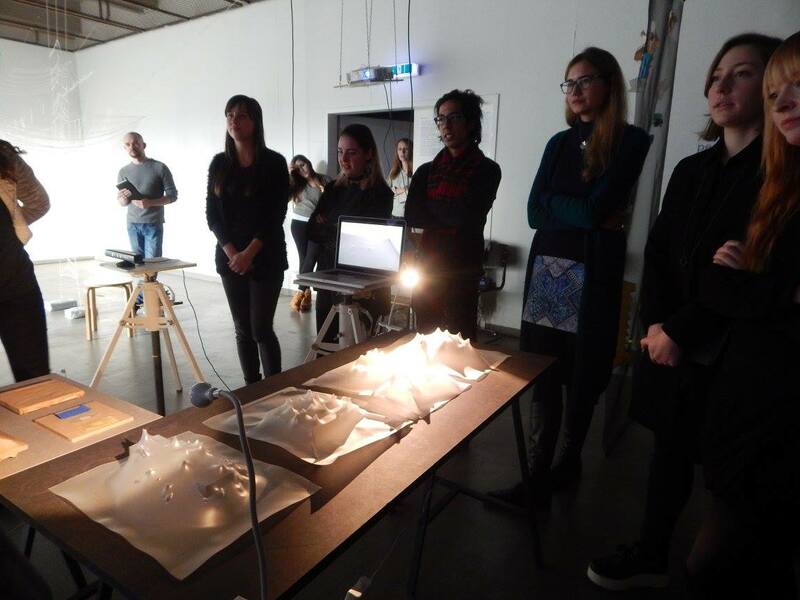 The goal of this workshop was to explore Form Making and the role that very strong and specific sites are able to negotiate with contemporary digital techniques. 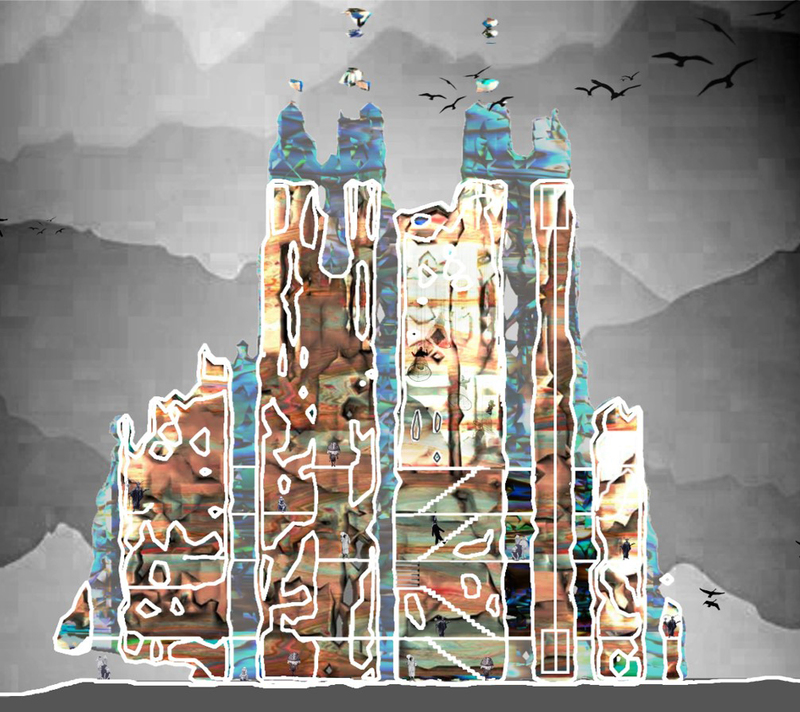 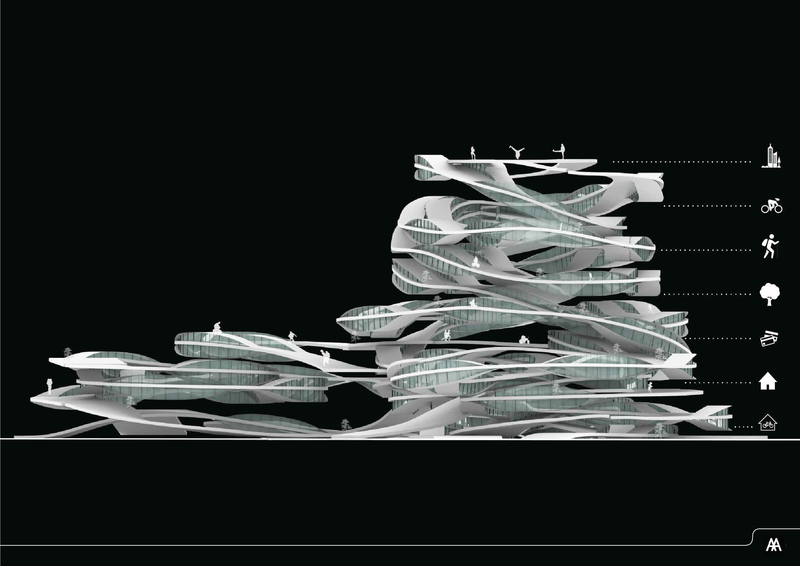 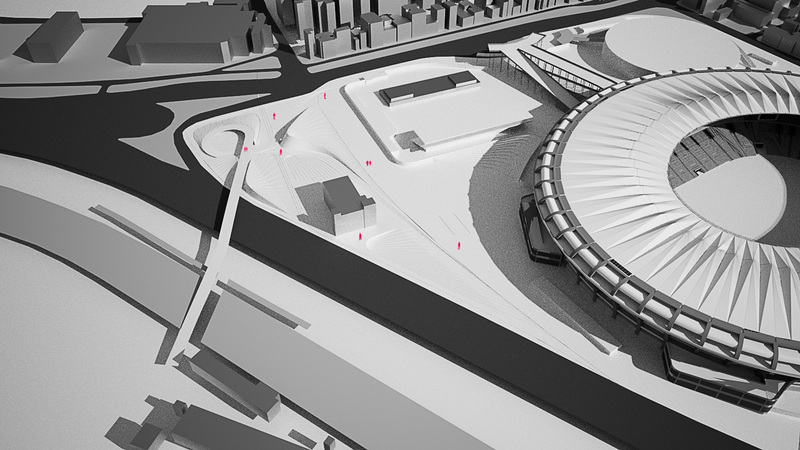 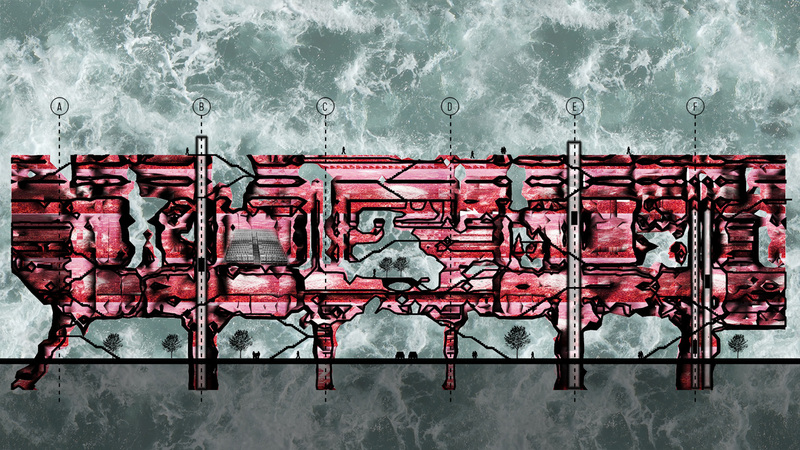 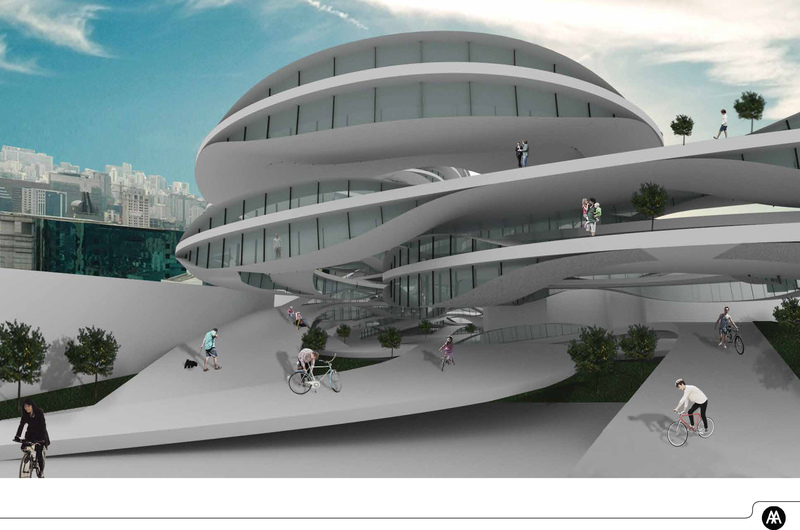 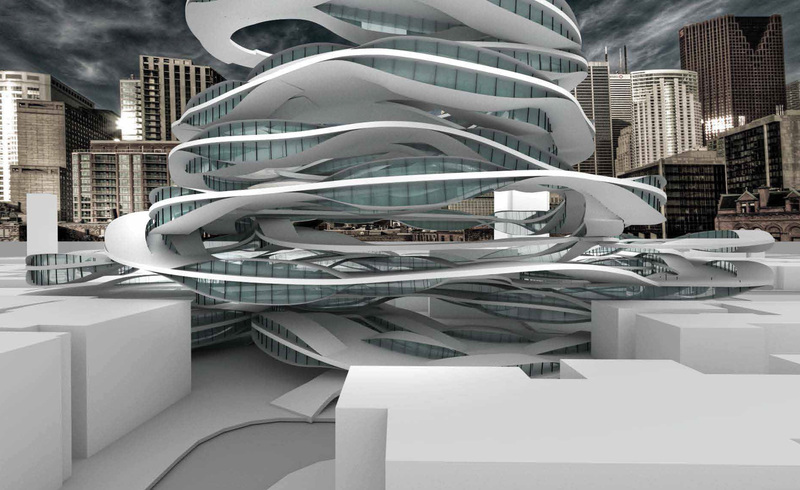 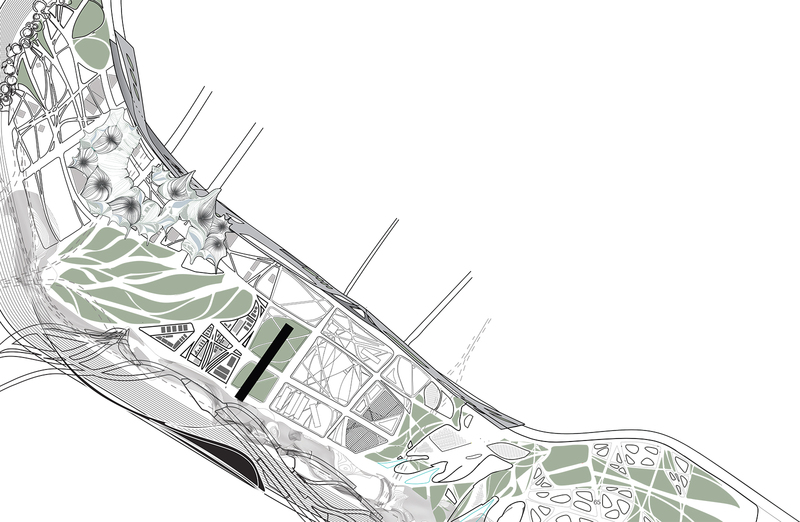 Architectural drawings were appropriated and remixed to produce proposals that are both stange and specific to the site. 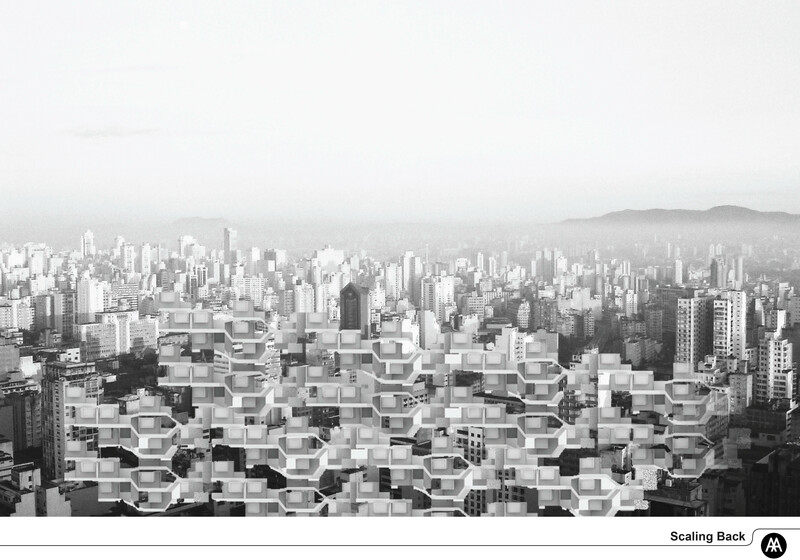 The city of São Paulo is characterized by an endless horizon of monolithic and non-descript towers. 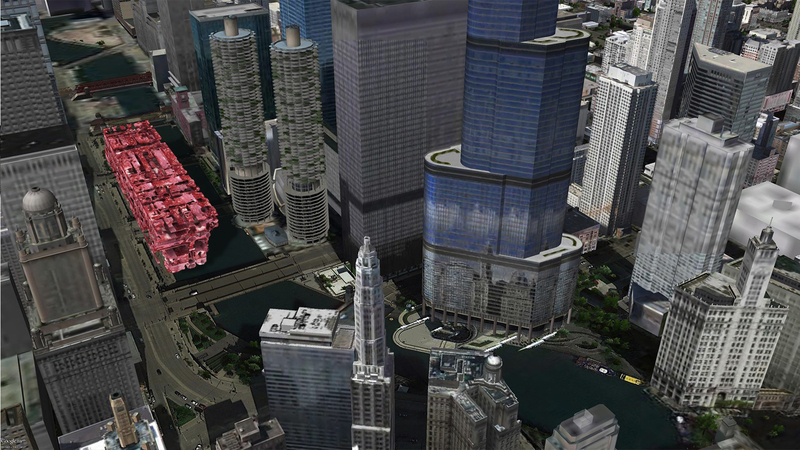 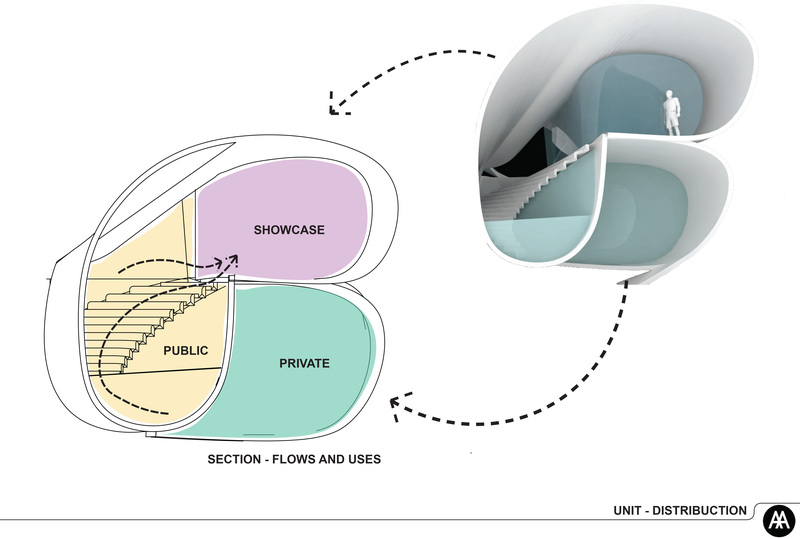 A newly instated City Master Plan promotes further vertical development by allowing for higher skyline and construction areas along public transportation corridors. 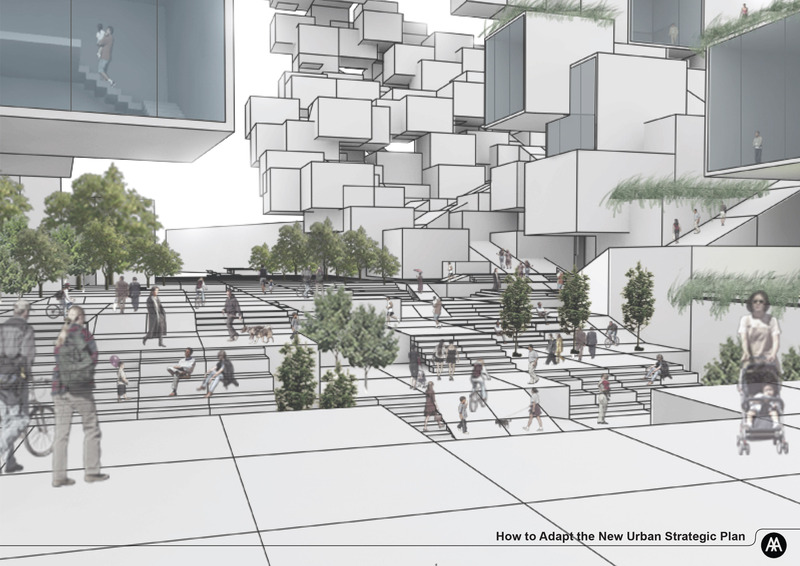 Up until now, neighborhoods once characterized by two-story houses, gardens and ground- floor open shopfront programs, have been completely transformed by the introduction of fortressed monolithic residential and office towers, which lack any sort of urban street life. 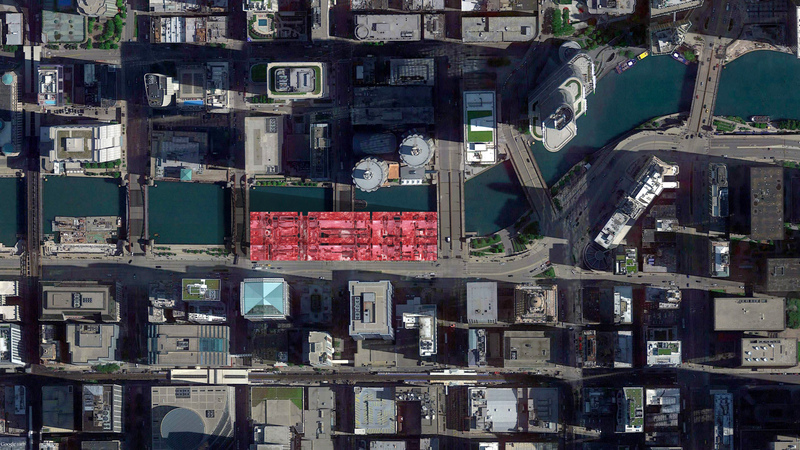 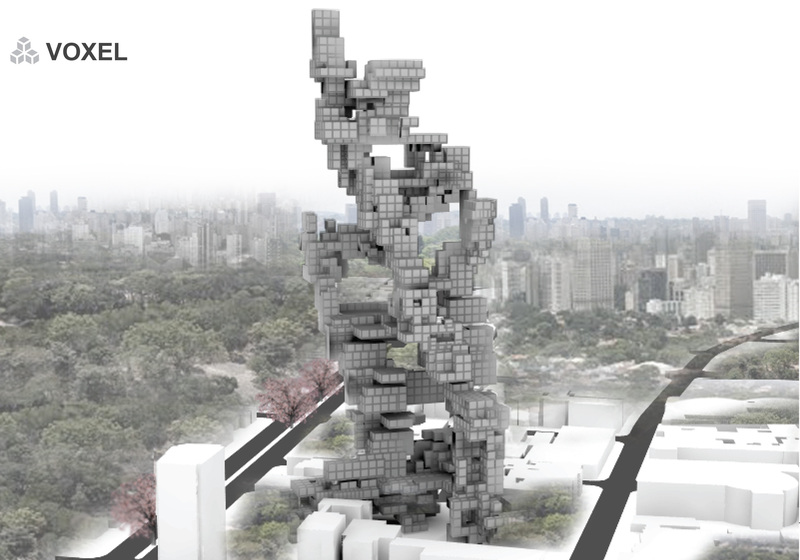 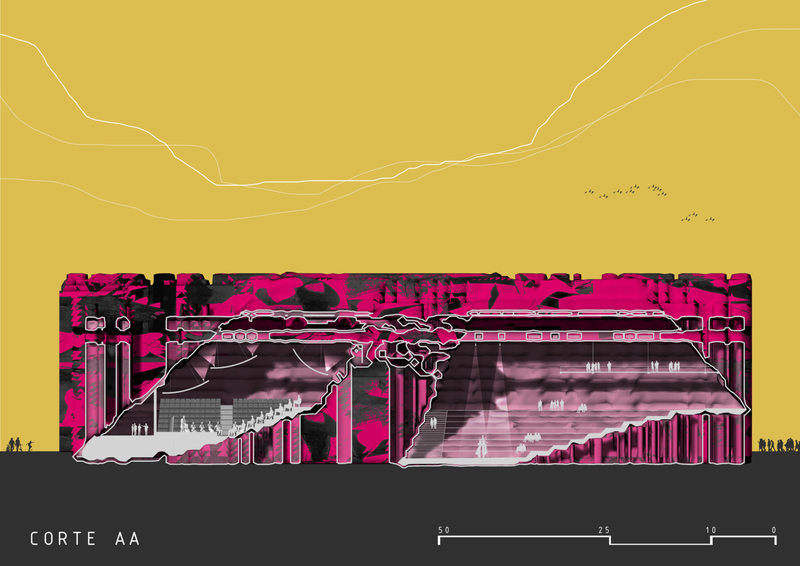 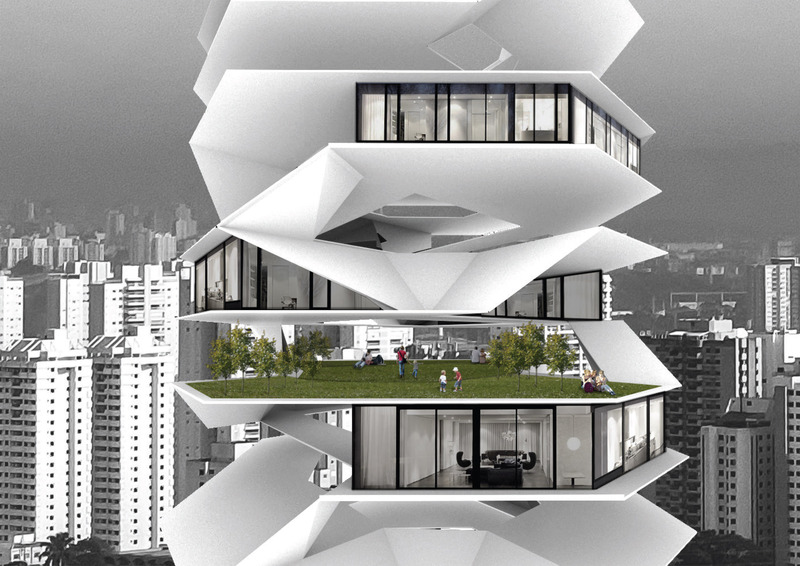 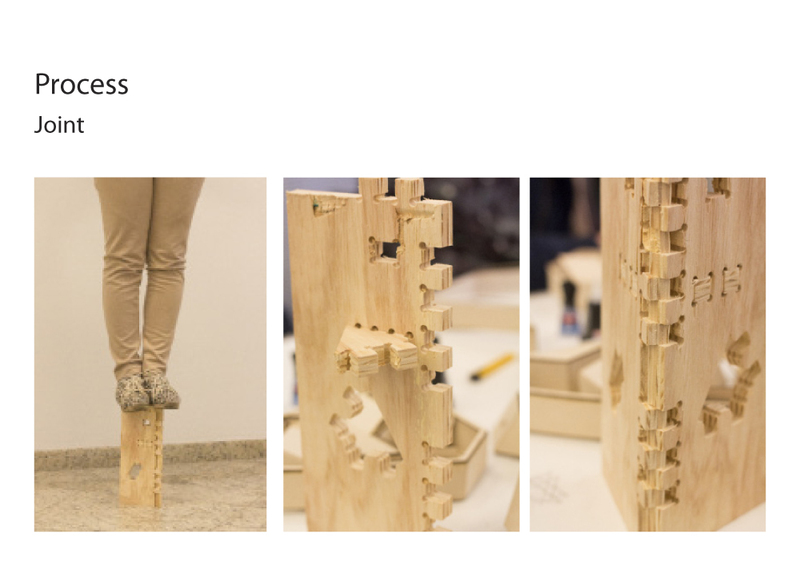 This intenisive 10 days workshop focused on possible new towers typologies for São Paulo 2025. 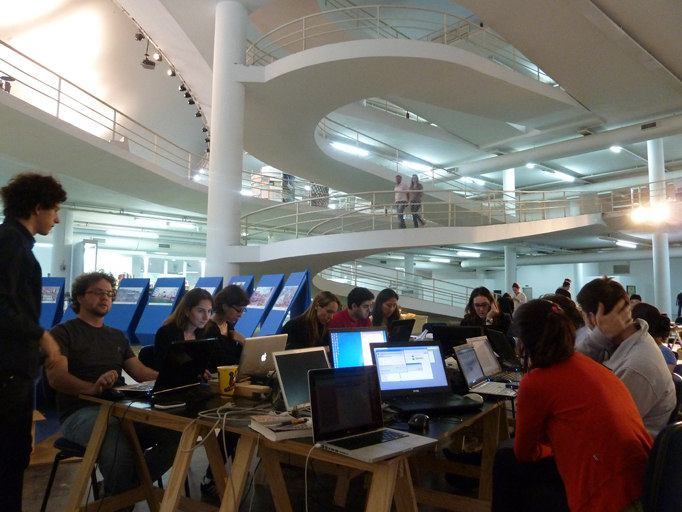 The research-driven work started from analysis of current situation on social and urban issues of São Paulo 21 million inhabitants megacity. 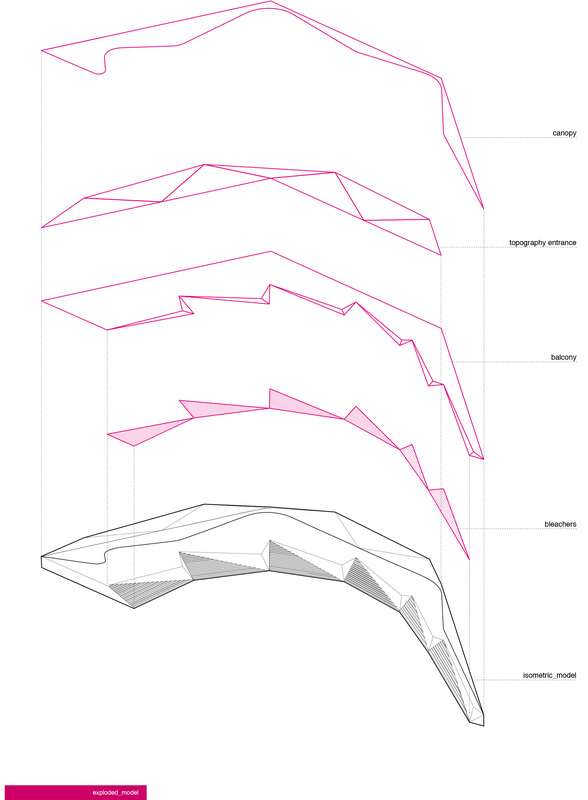 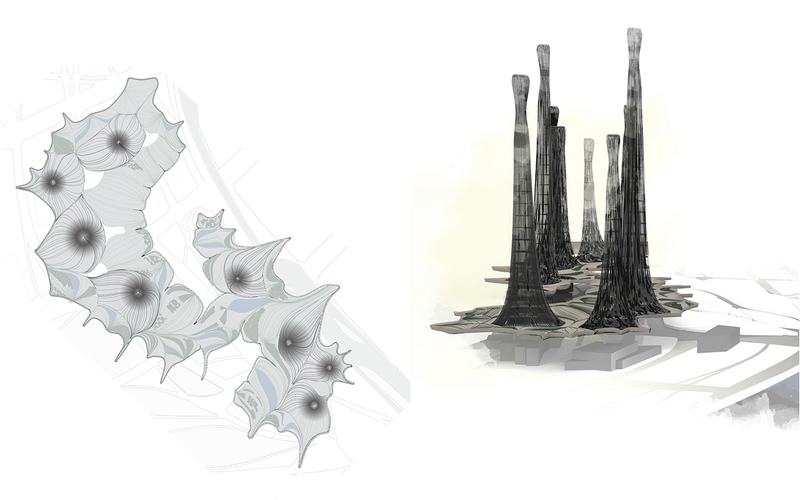 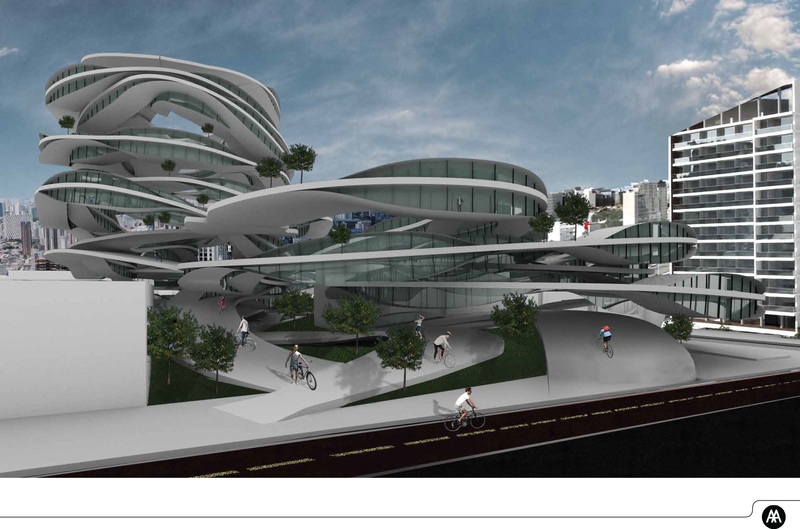 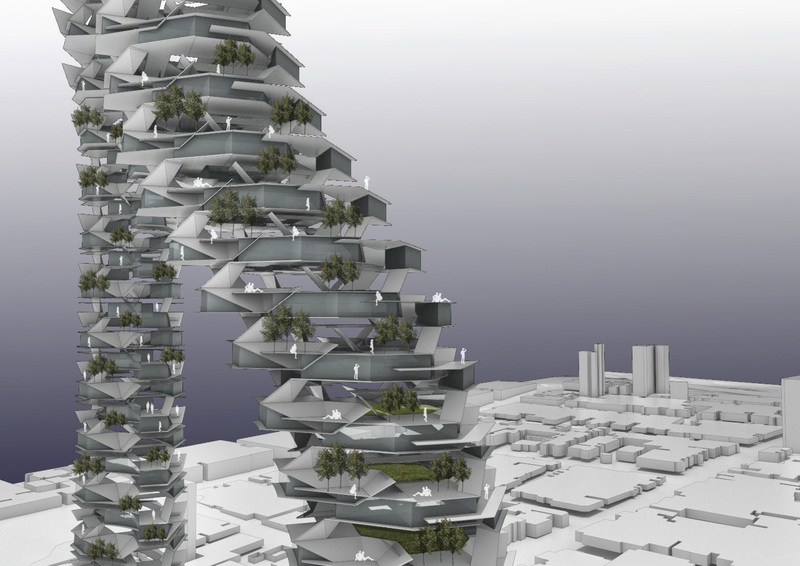 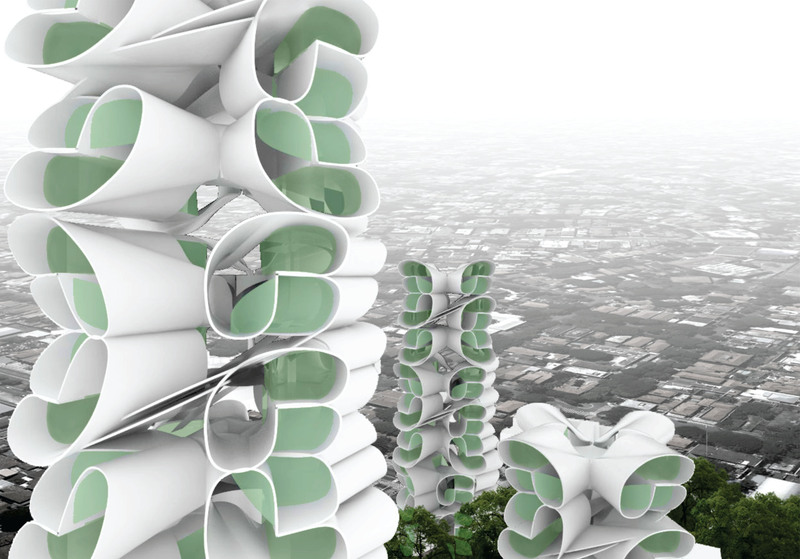 These analysis offered architectural opportunities to speculate on new kinds of towers, ranging from bycicle circulation schemes within a residentail building to vertical branching network neighborhood. 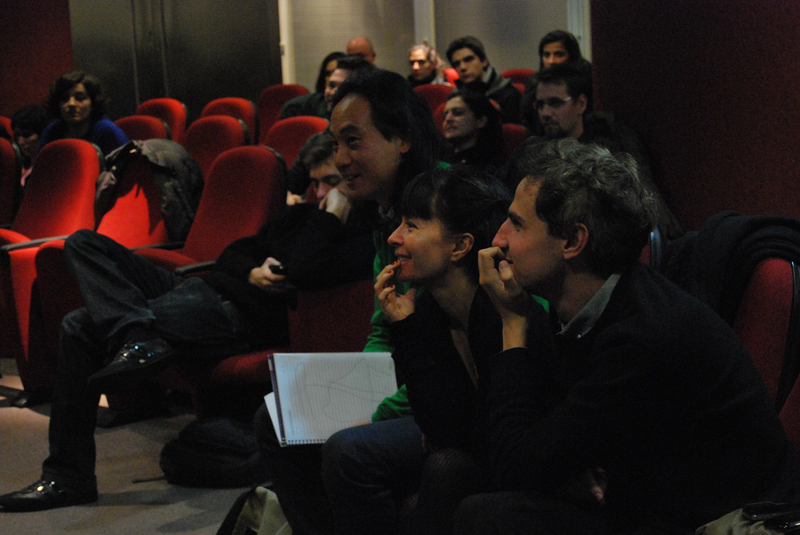 Directors: Franklin Lee and Anne Save de Beaurecueil - Tutors: Christian Veddeler, Adi Utama, Aurélie Hsiao, Victor Sardenberg, Alexandre Kuroda, Renata Portelada and Thomas Takeuchi. 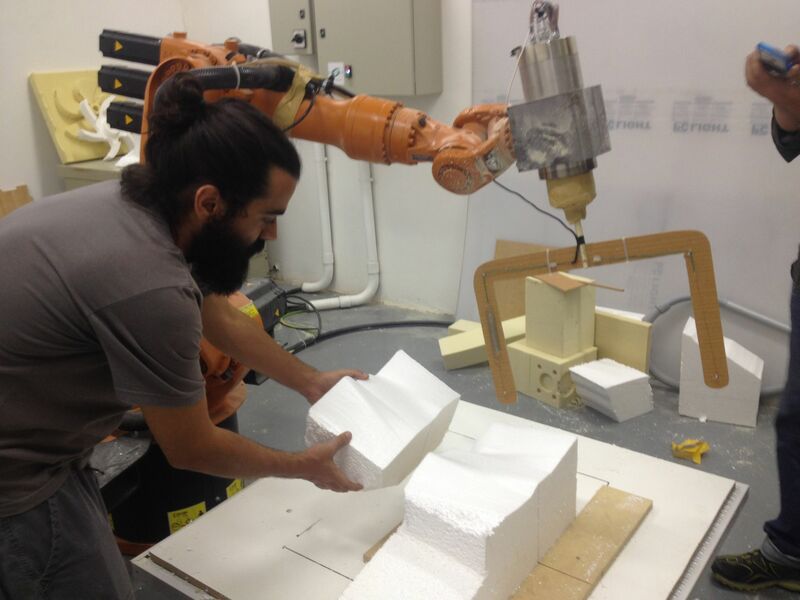 After one week of computational tools workshop, we studied possible parametric control techniques for digital fabrication with a KUKA 6-axis robotic arm. 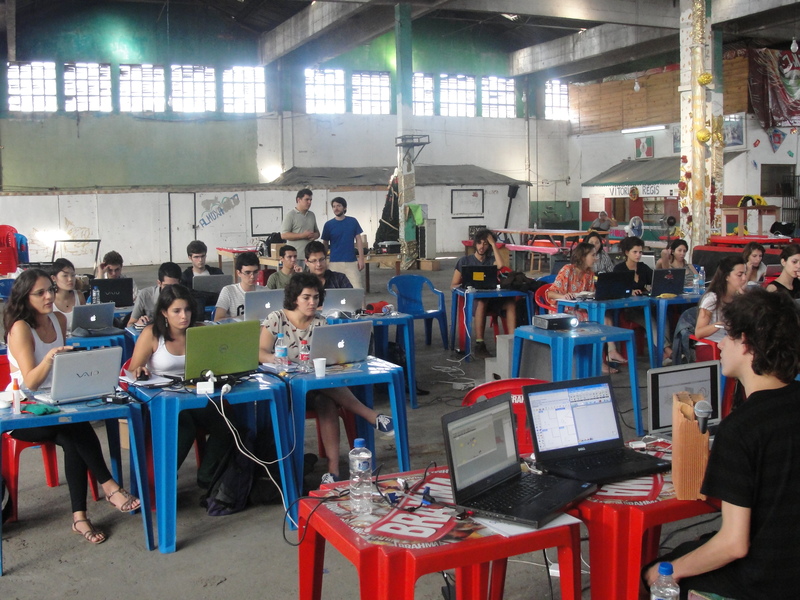 NEXT Núcleo de Experimentação 3D - September 2014 - Rio de Janeiro. 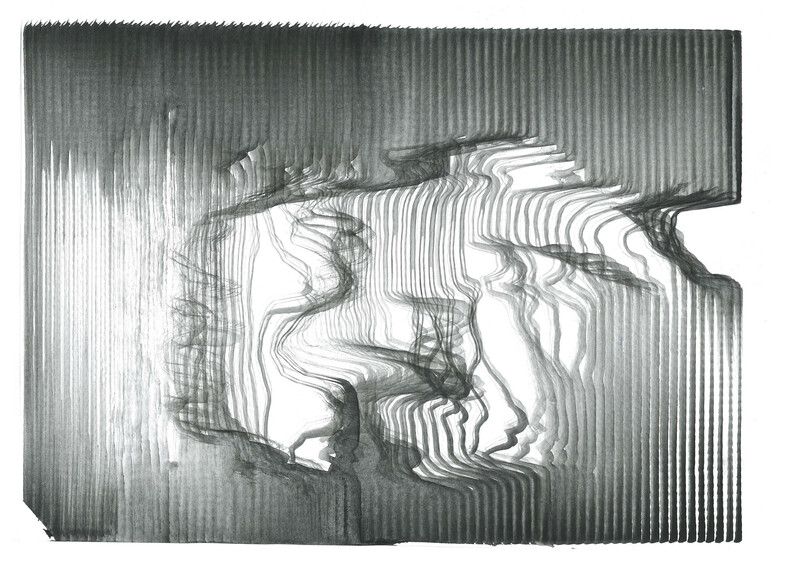 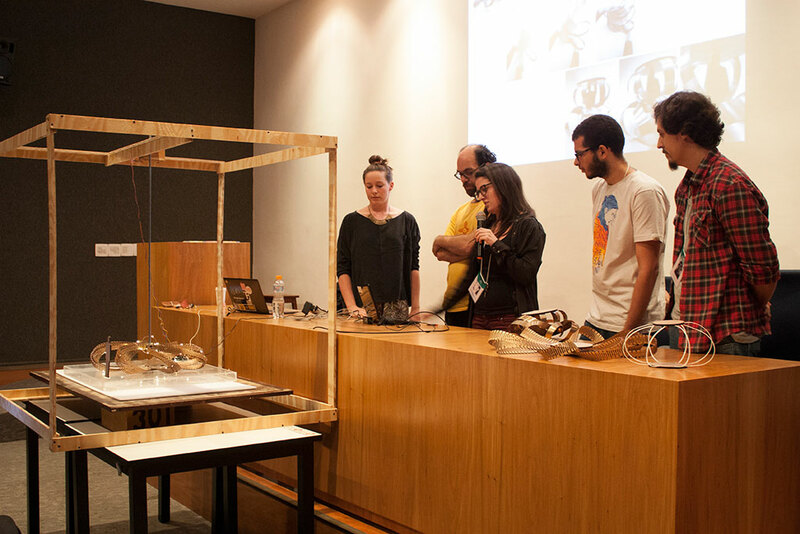 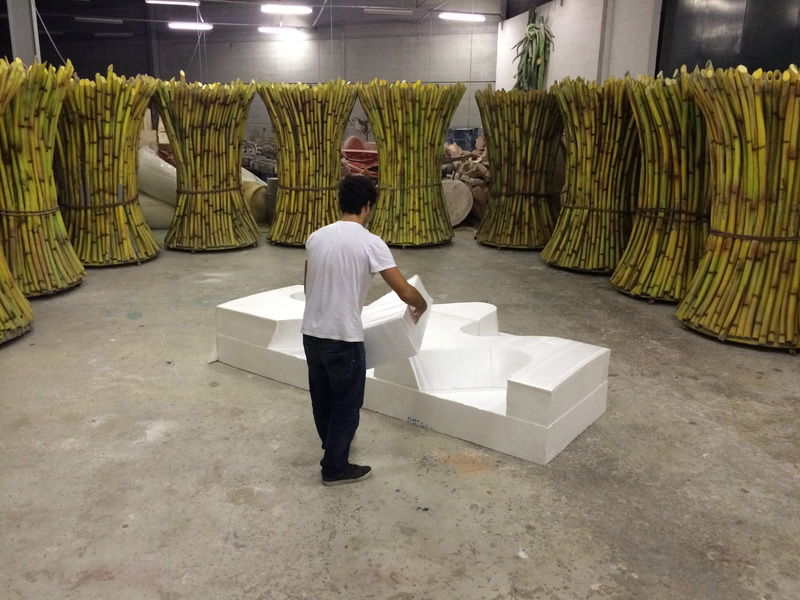 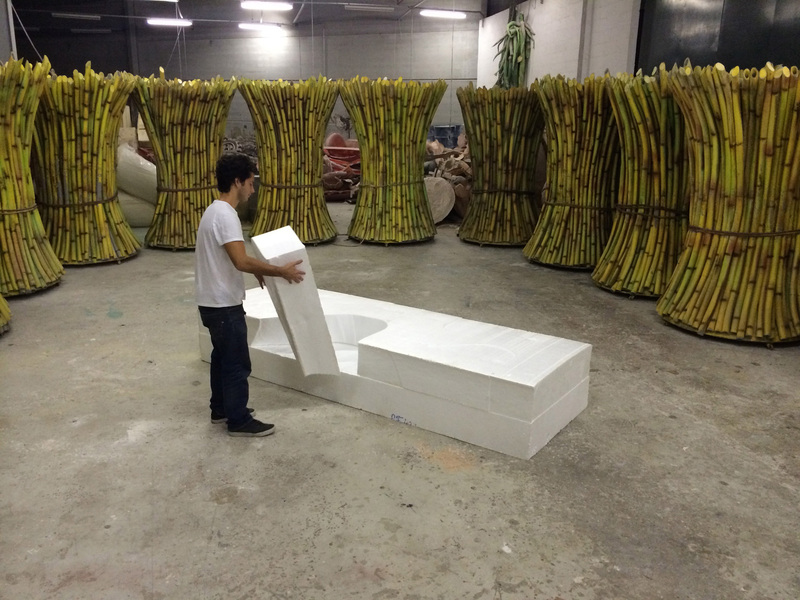 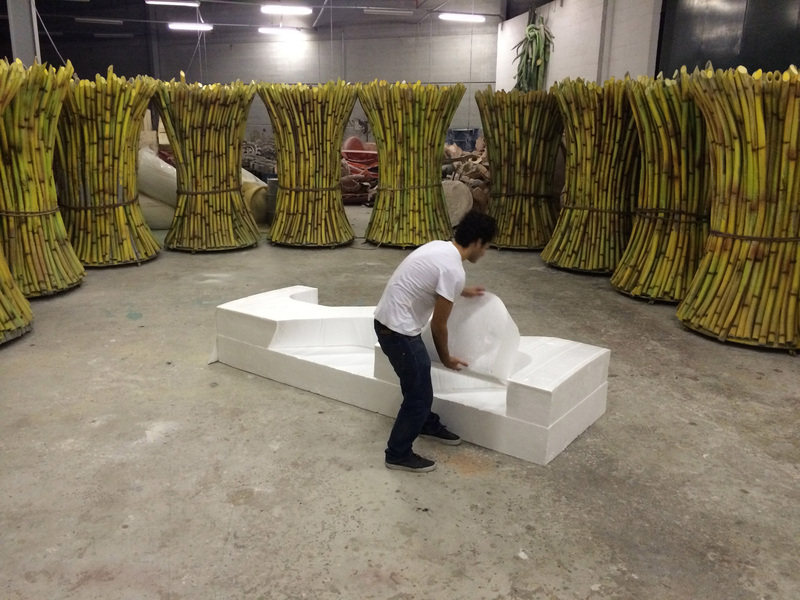 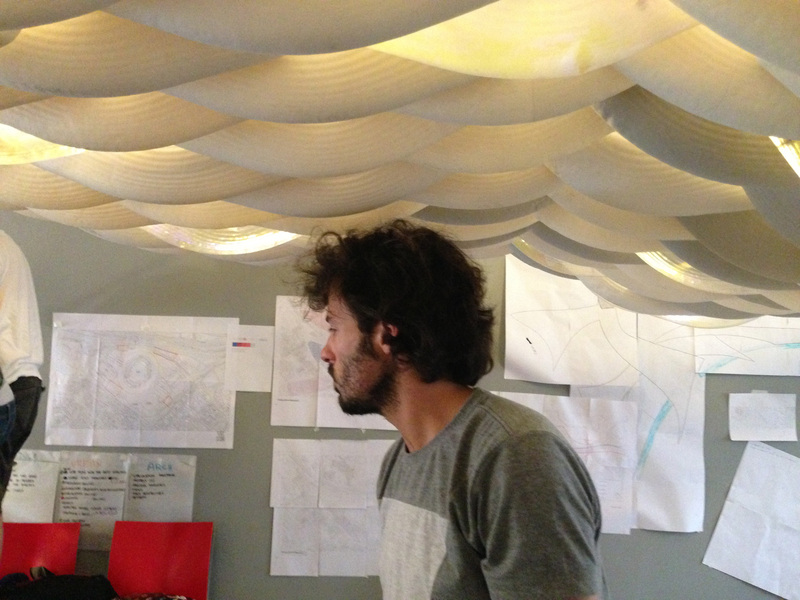 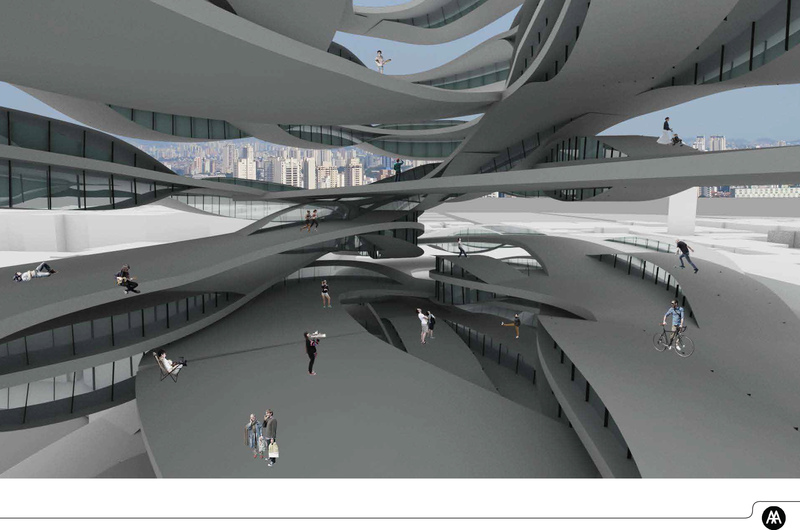 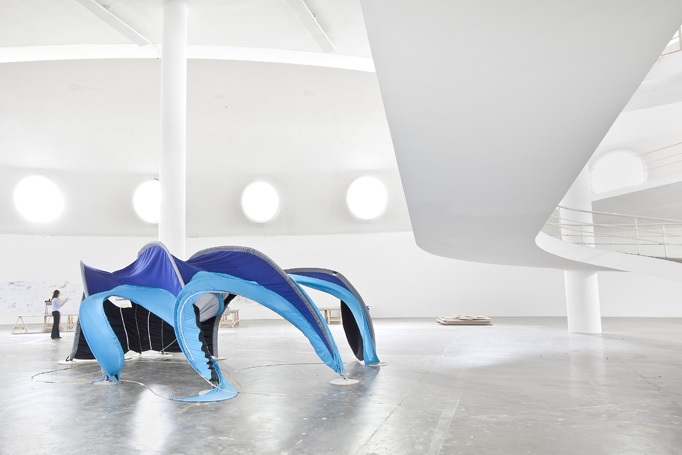 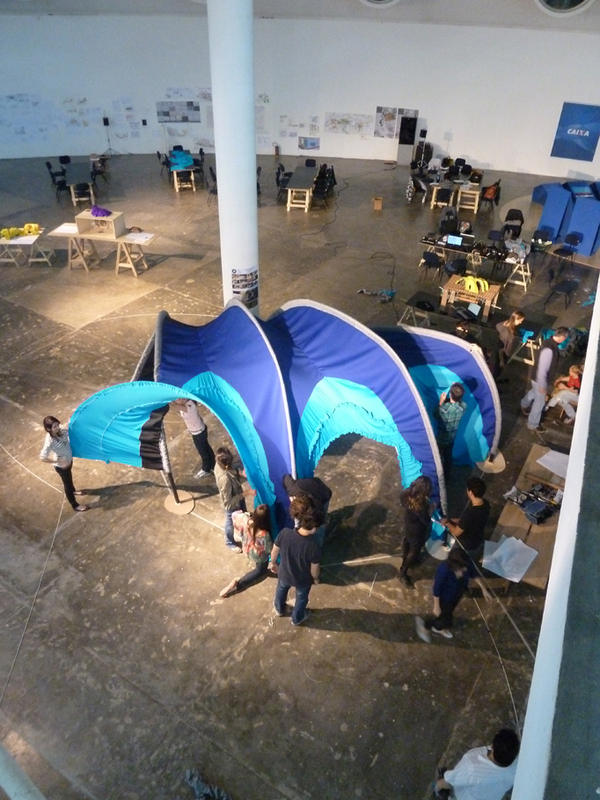 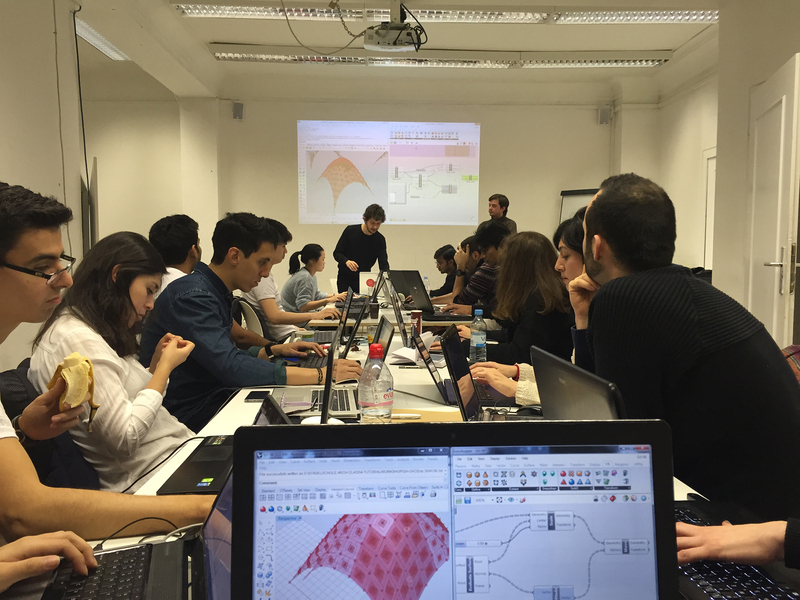 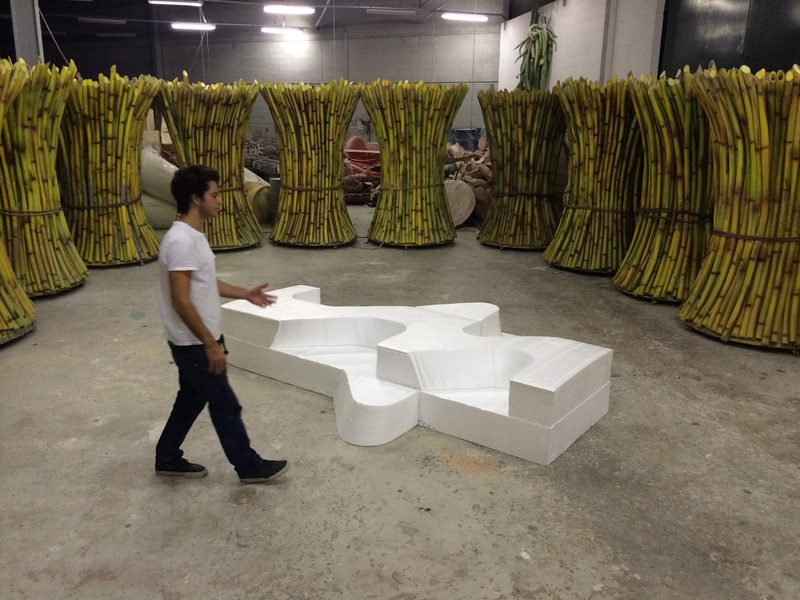 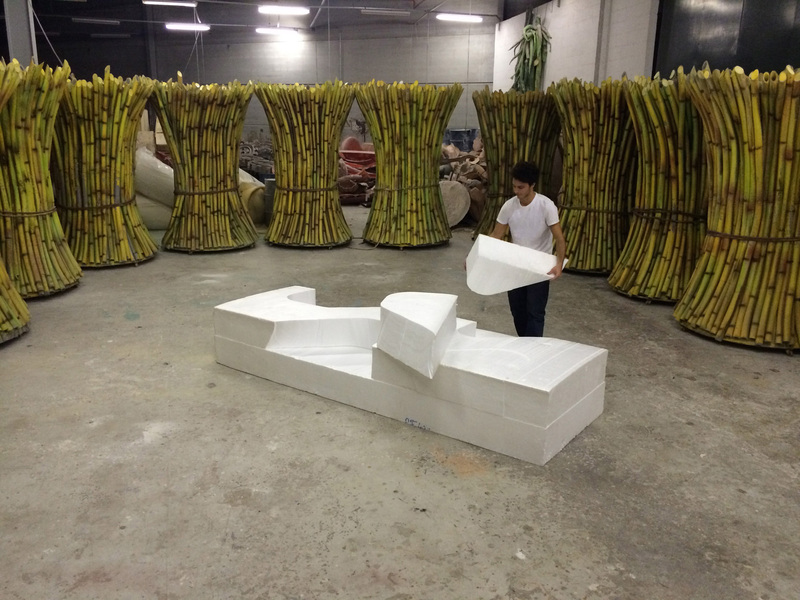 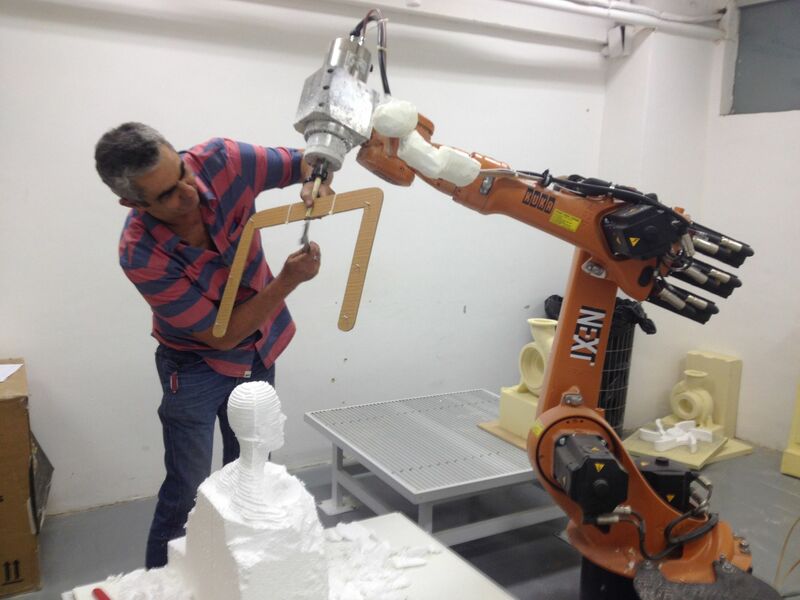 During the intense ten-day workshop of the AA São Paulo Visiting School 2014, advanced computational design and digital fabrication will be used to generate speculative new architecture models in the creation of a ‘liquid design’ that can mediate multiple-scale flows. 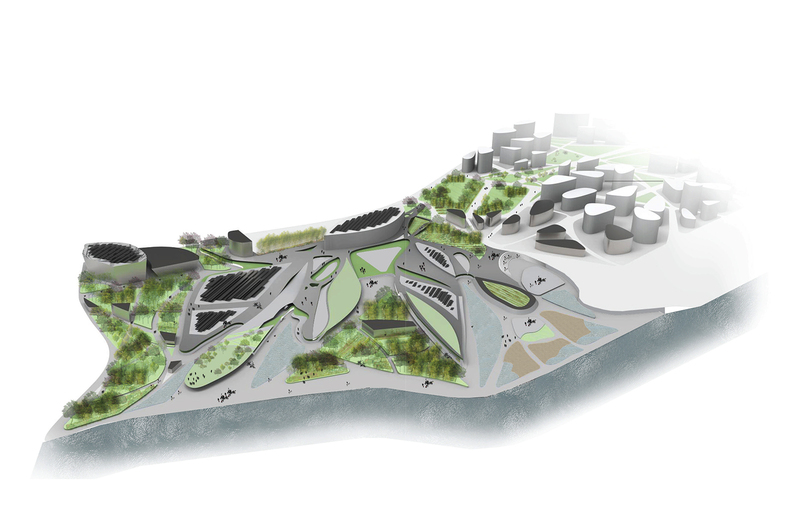 The workshop will explore the redevelopment of a bordering territory along the Marginal Rivers of São Paulo, where in the 1960’s, much of the water-system was disastrously canalized, causing problematic flooding and the creation of ill-conceived residual post-industrial riverbanks that are inhabited by monolithic, large-scale programs such as sports centers, distribution centers, mega-stores and a convention center. 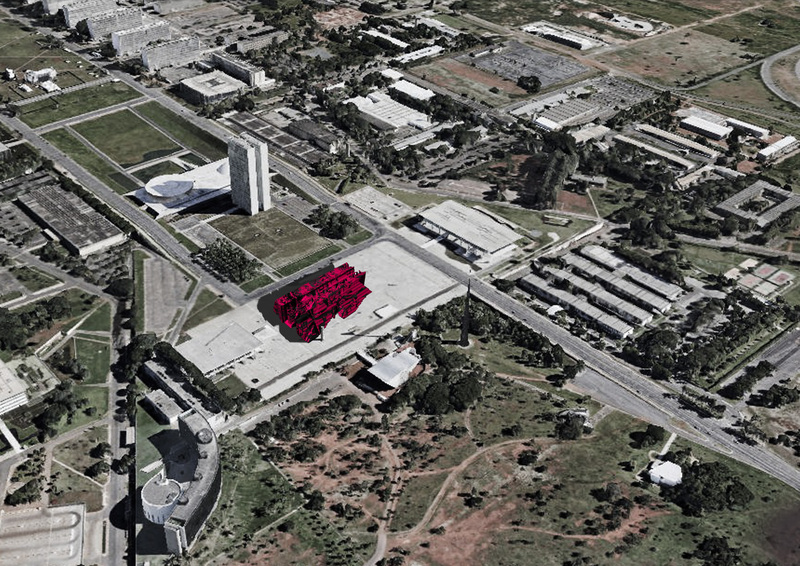 The Visiting School São Paulo will work on bringing a new urban life for these sites by redefining the existing macro-architectural typologies along the river with micro-scale interventions that can introduce new flows of urban street culture. 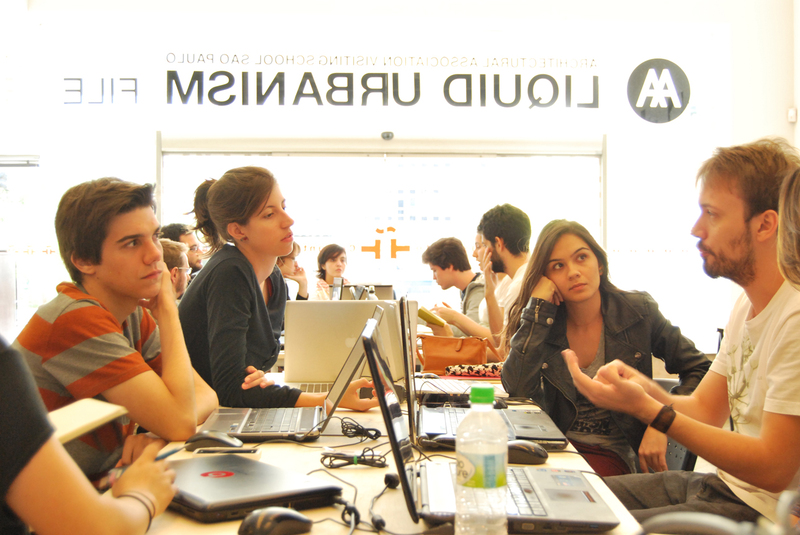 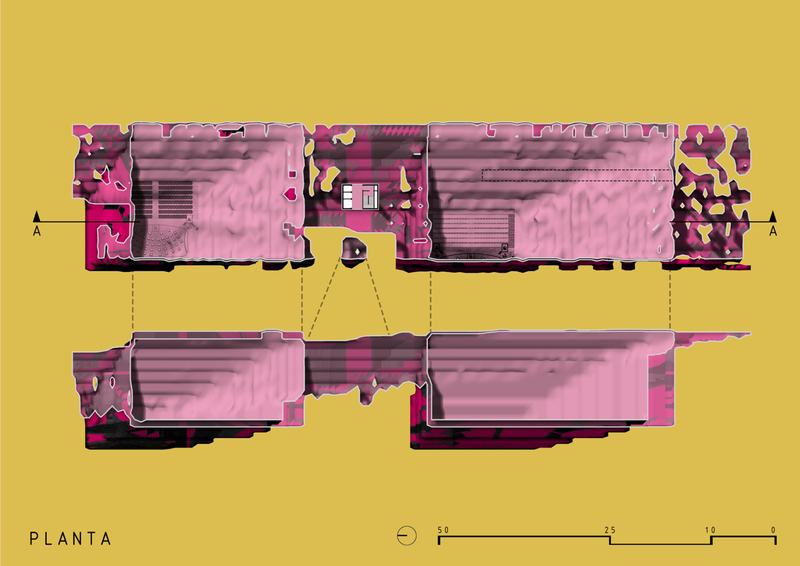 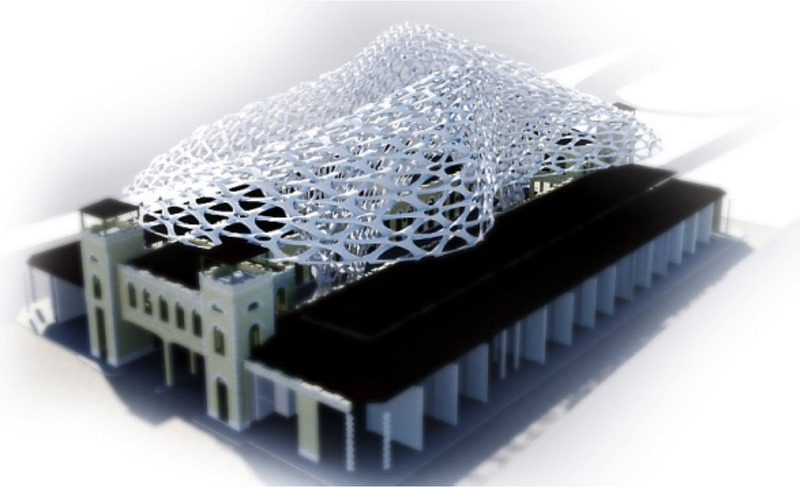 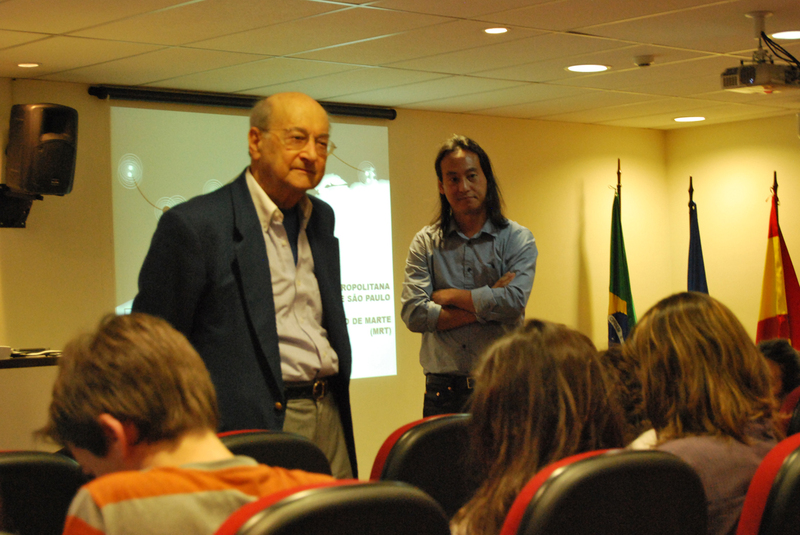 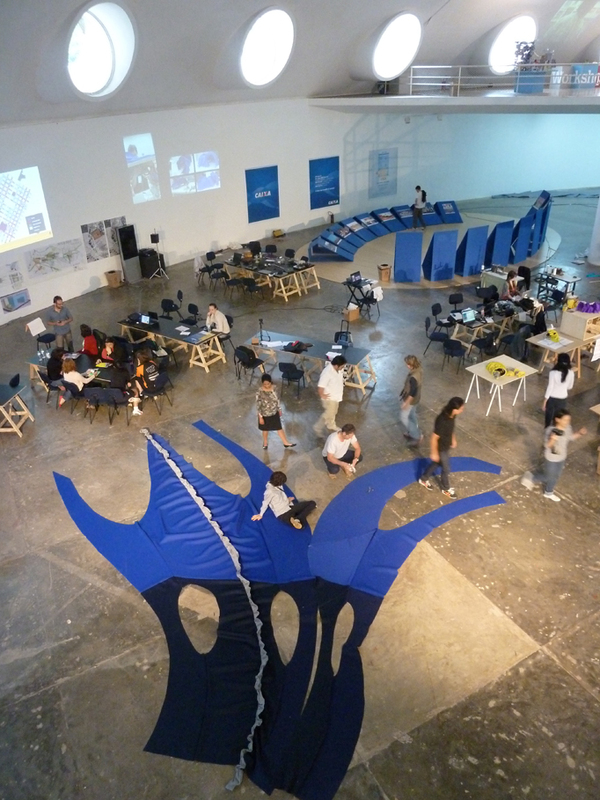 Specifically, the workshop will focus on the reinvention of the large-scale market distribution center, CEAGESP (Companhia de Entrepostos e Armazéns Gerais de São Paulo), to introduce programs and structures that could mediate a new movement of people, commerce, and environmental forces using parametric design and fabrication. 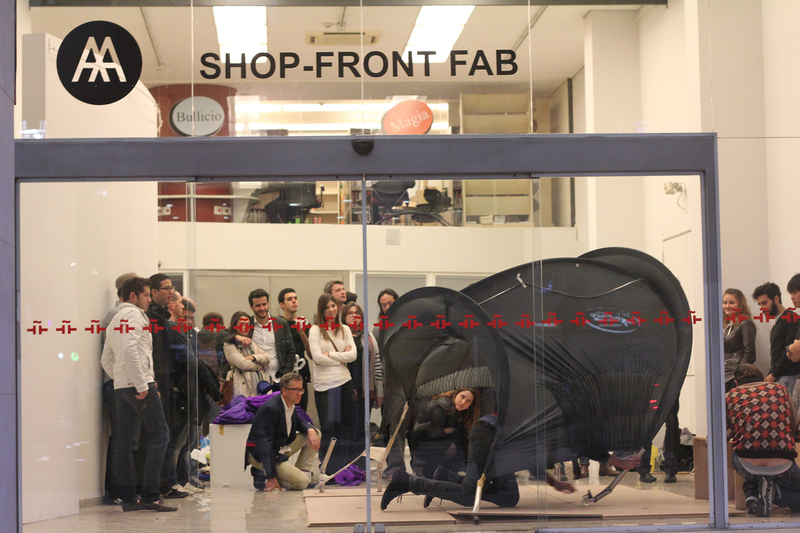 Students can choose to work either at the larger architectural scale or at the scale of the shop-front display, bringing a new contemporary interface between agricultural production and consumption. 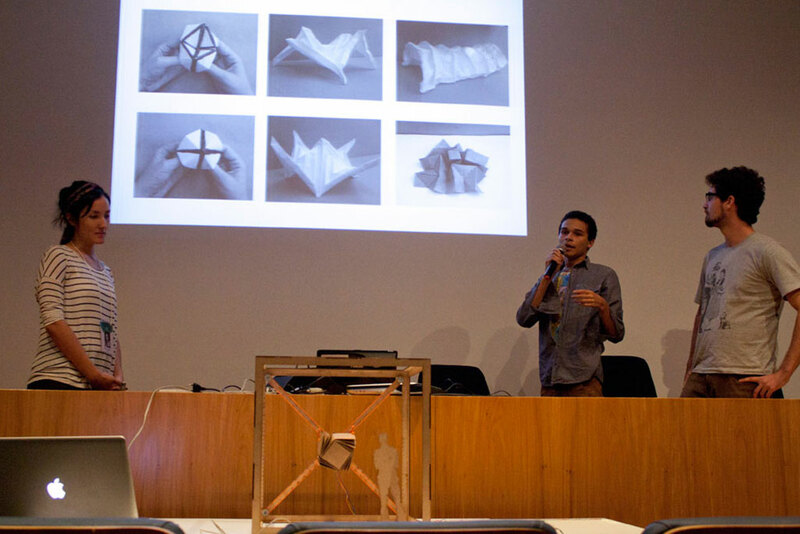 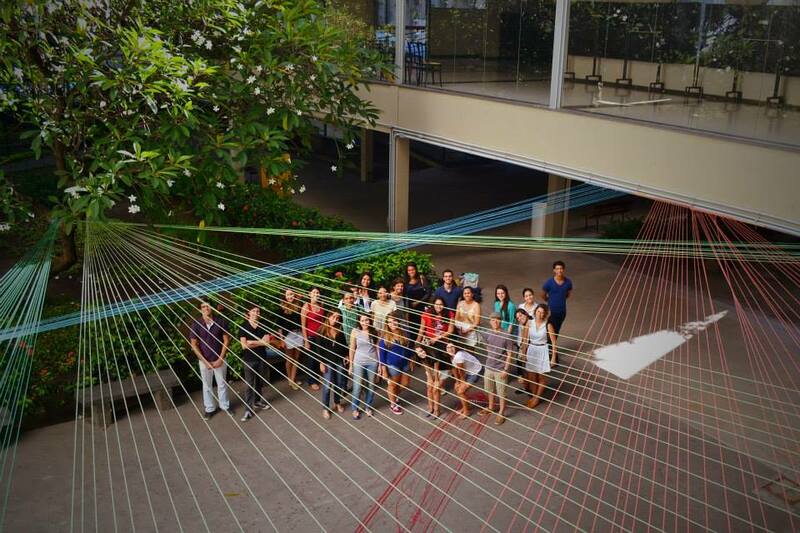 Recife - 07 - 12 April 2014 - The first parametric architecture workshop in Recife focused on digital tools to generate biomimetic structures. 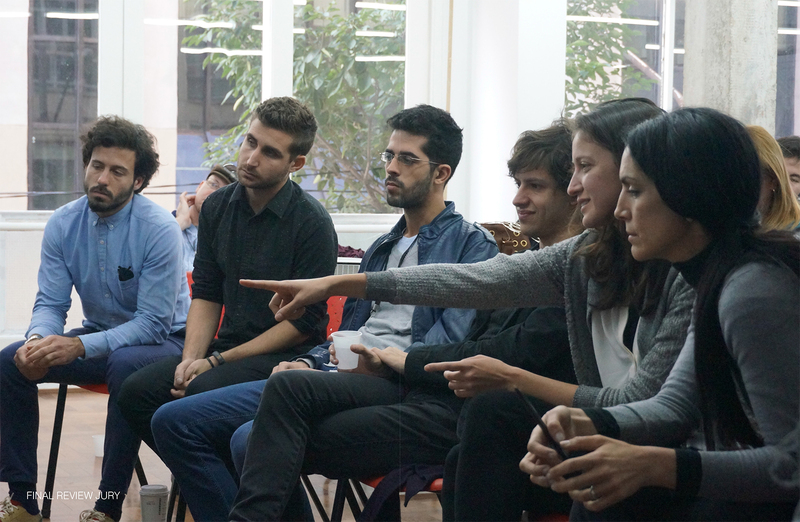 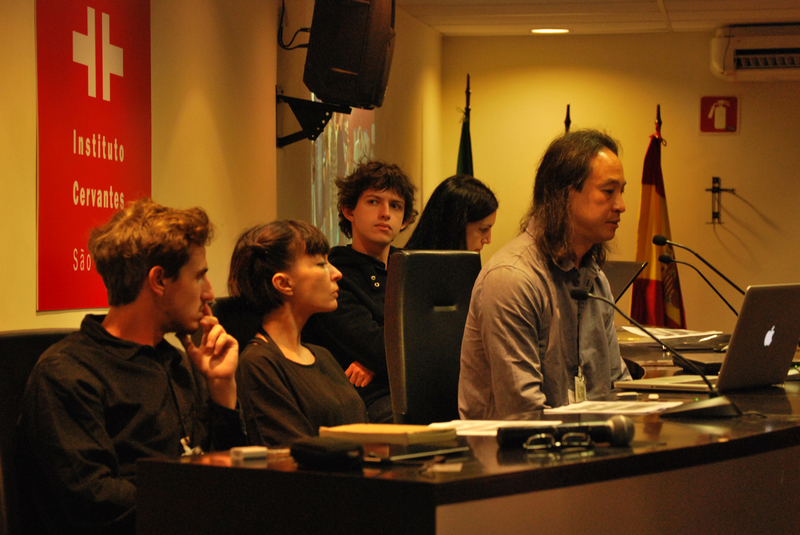 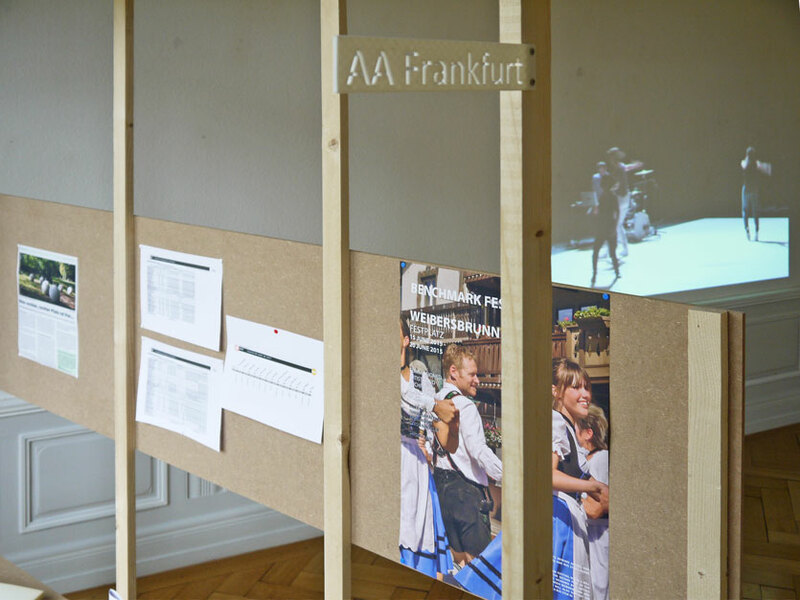 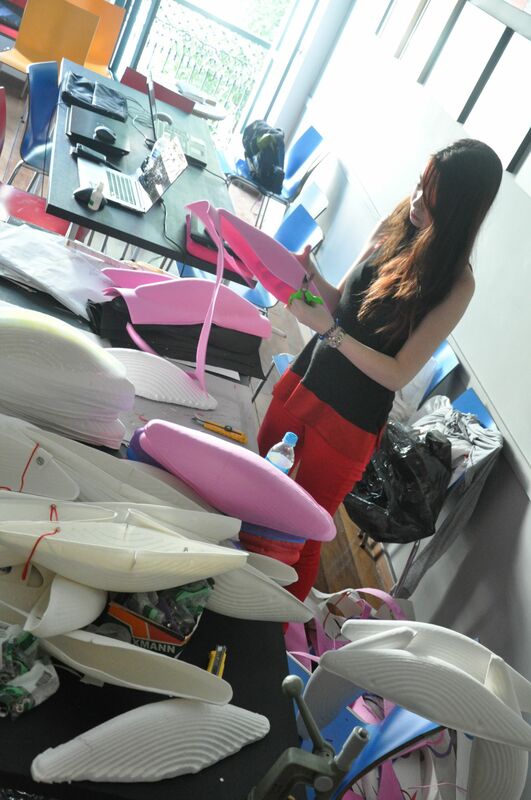 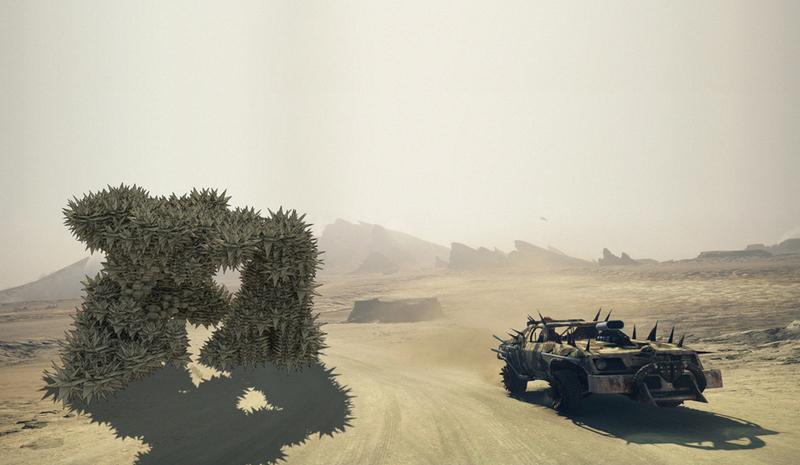 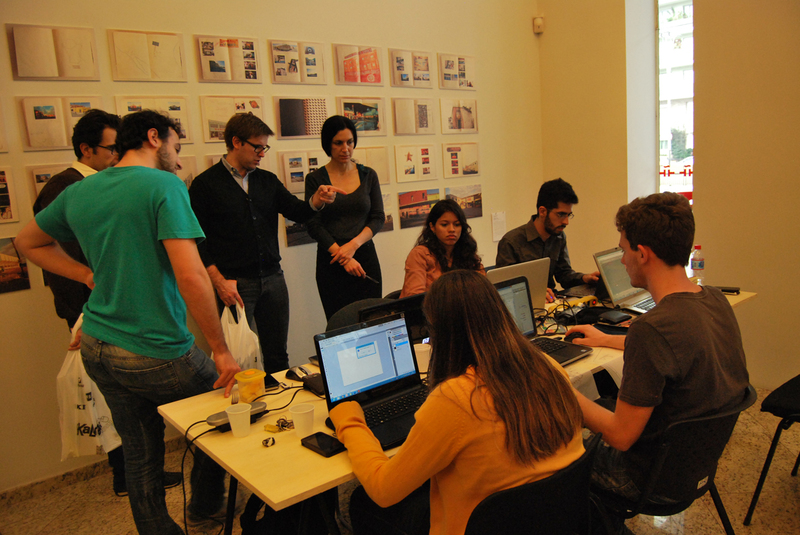 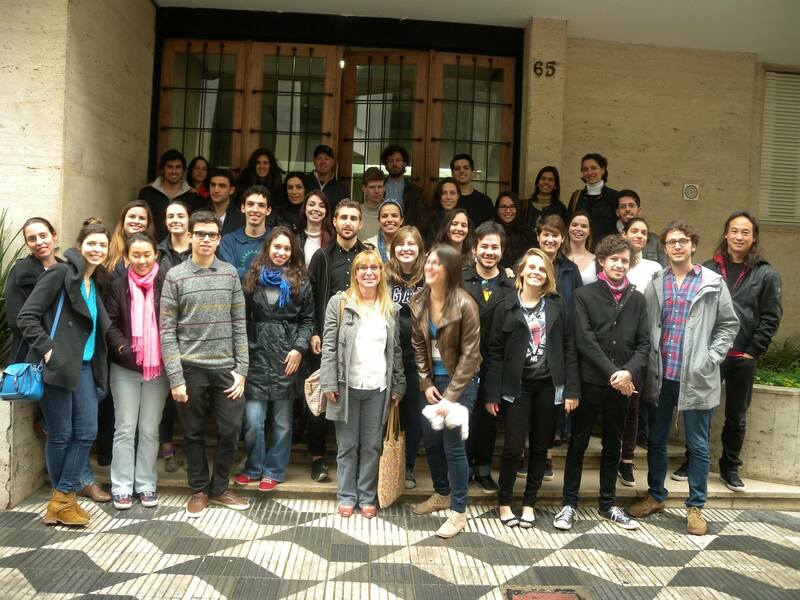 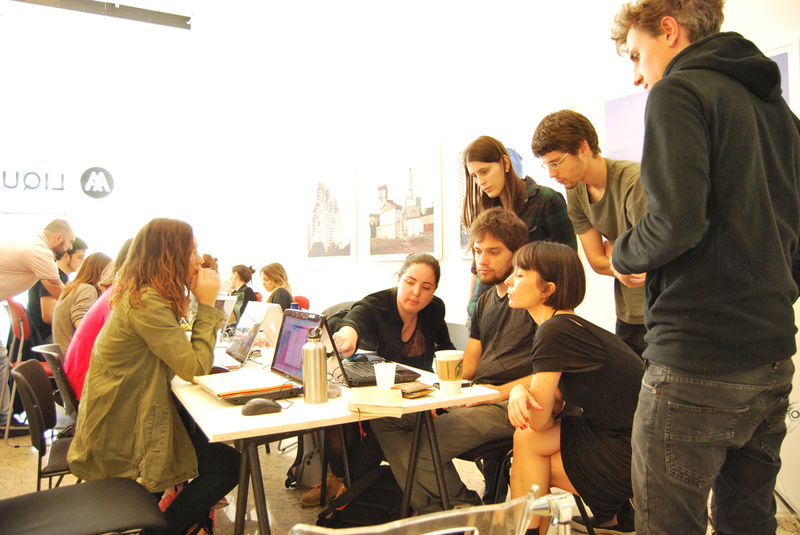 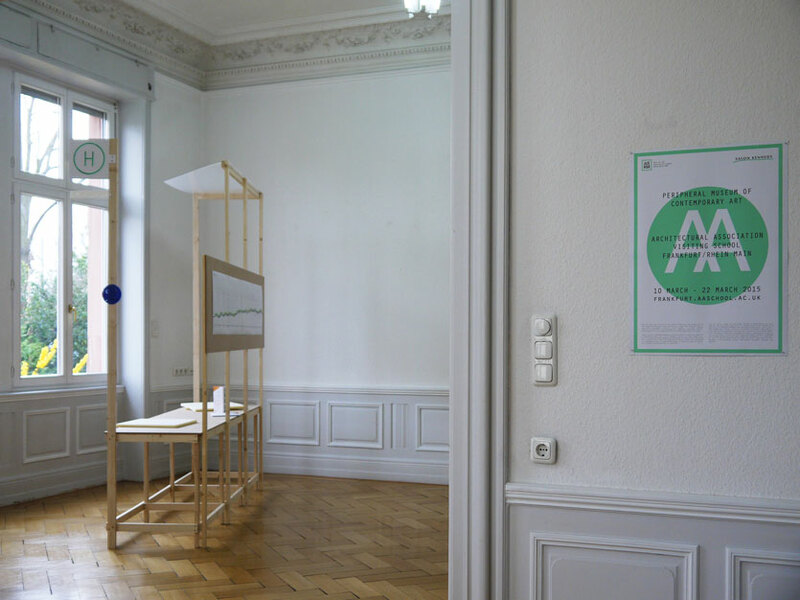 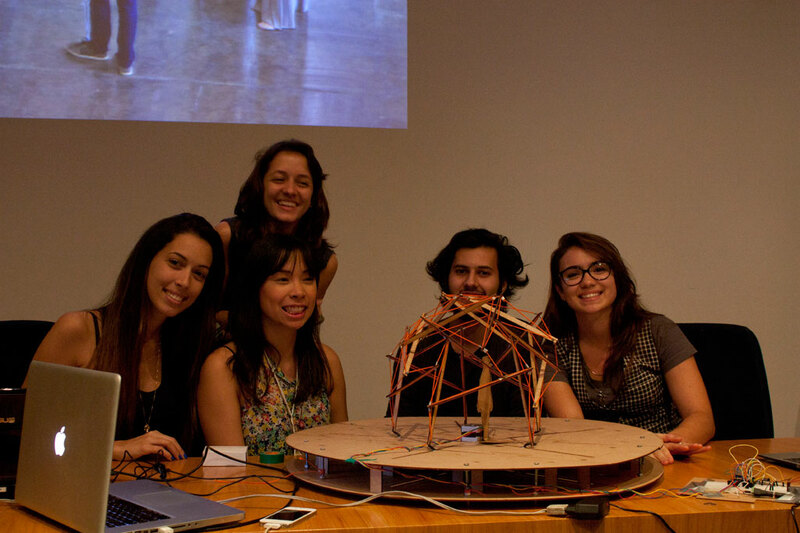 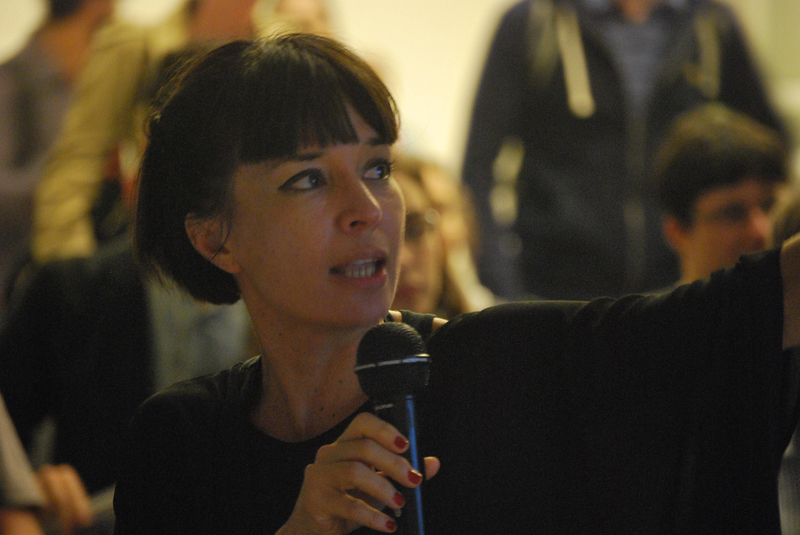 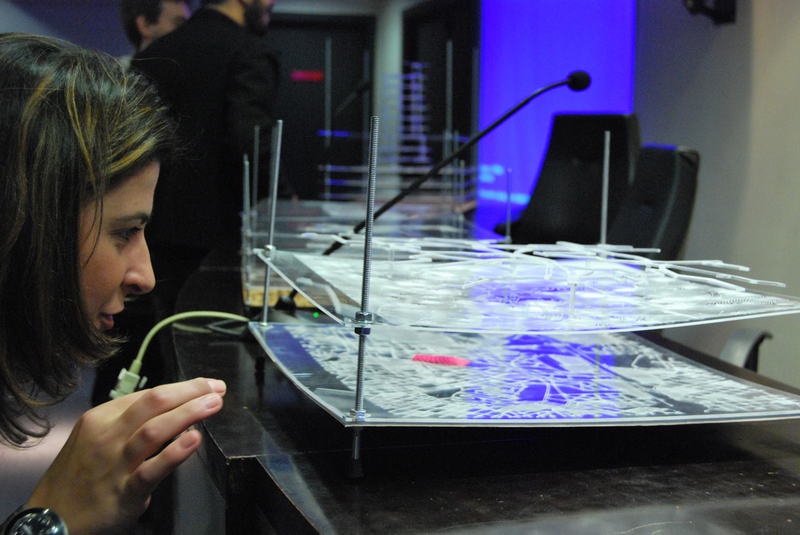 During 5 days, the participants developed proposals for an urban beach. 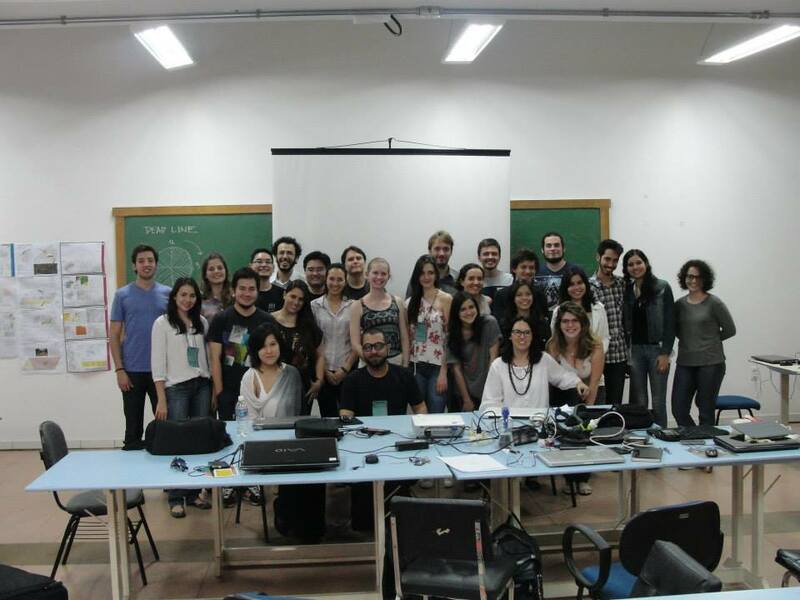 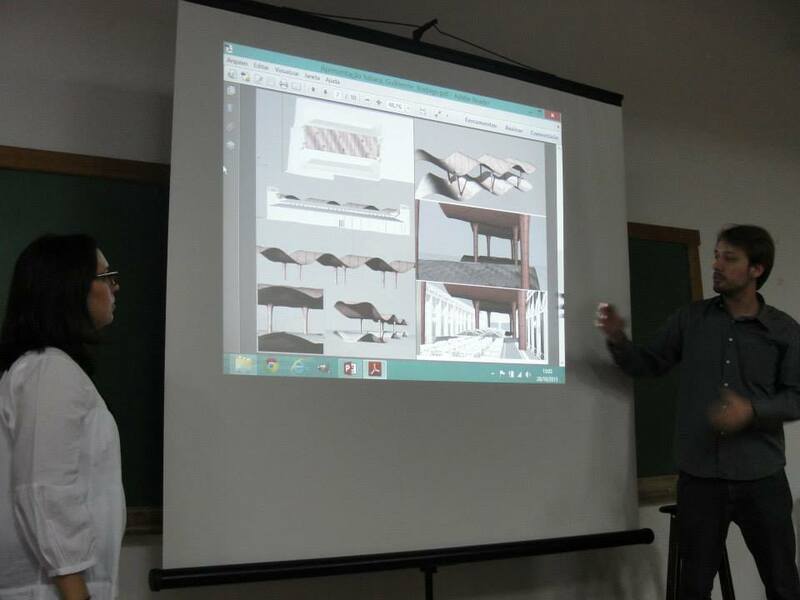 October 26th - 28th 2013 - Universidade Federal do Mato Grosso do Sul - Campo Grande The proposal of this short workshop was to introduce and apply parametric tools and form-finding in a design proposal for Mercado Municipal de Florianópolis' courtyard coverage. 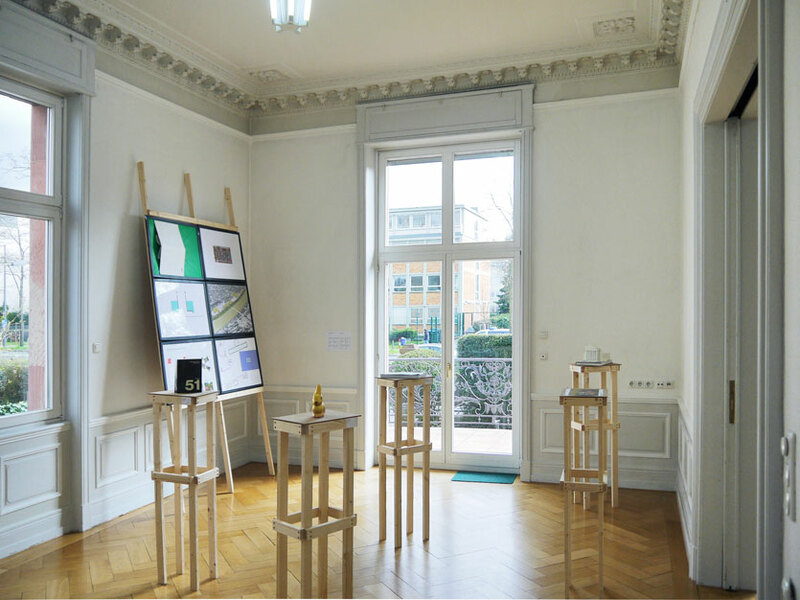 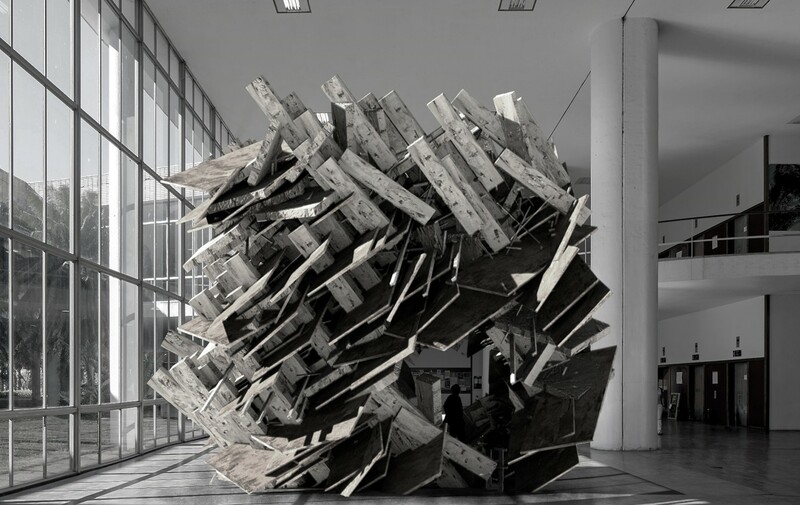 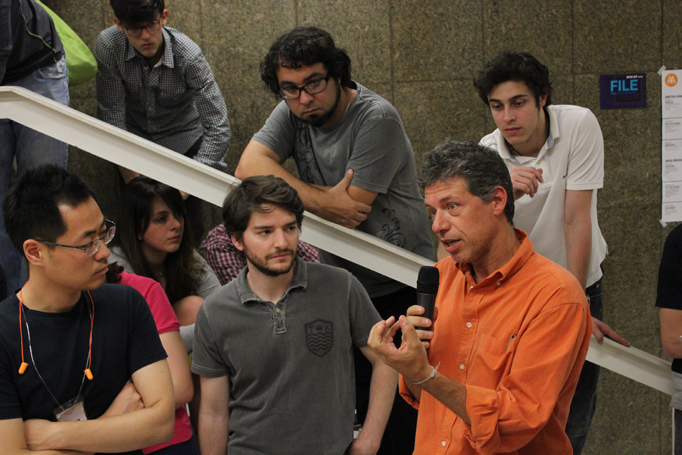 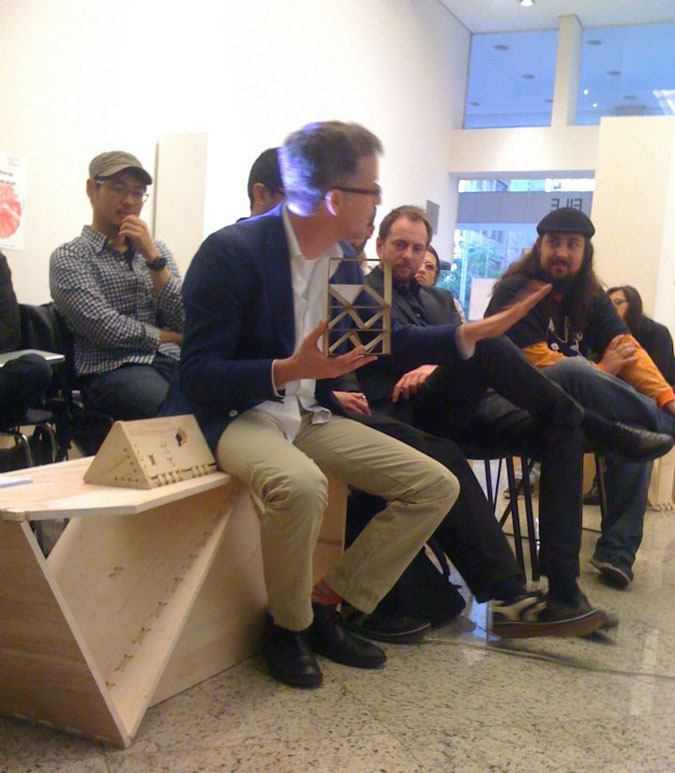 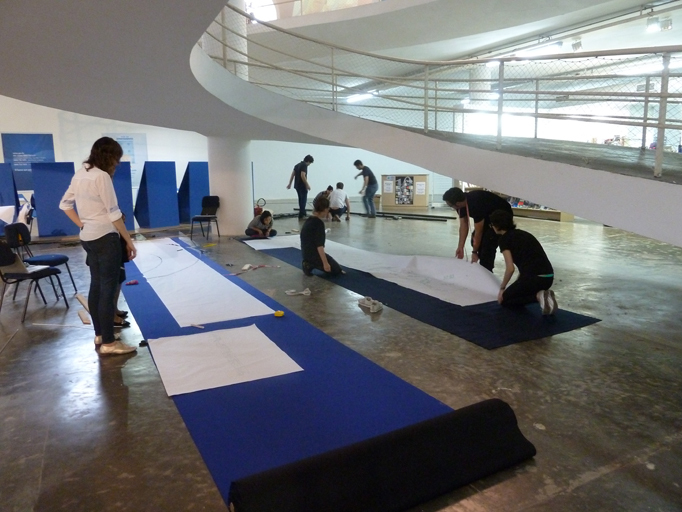 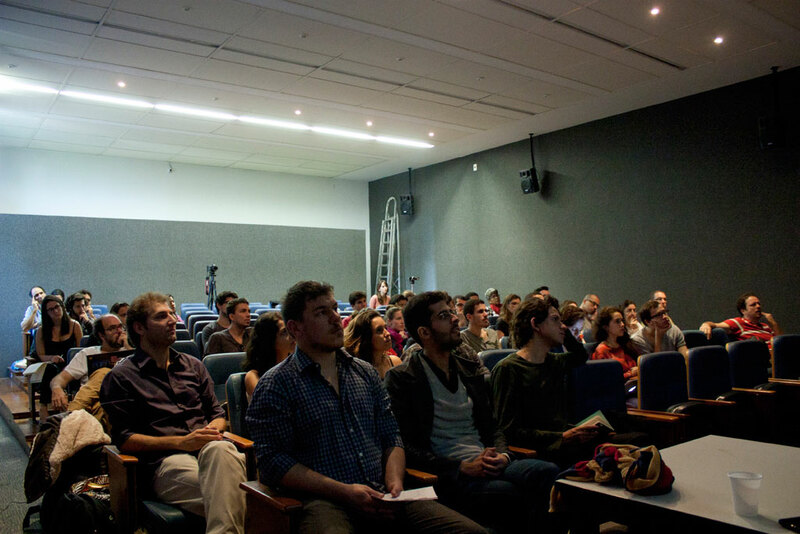 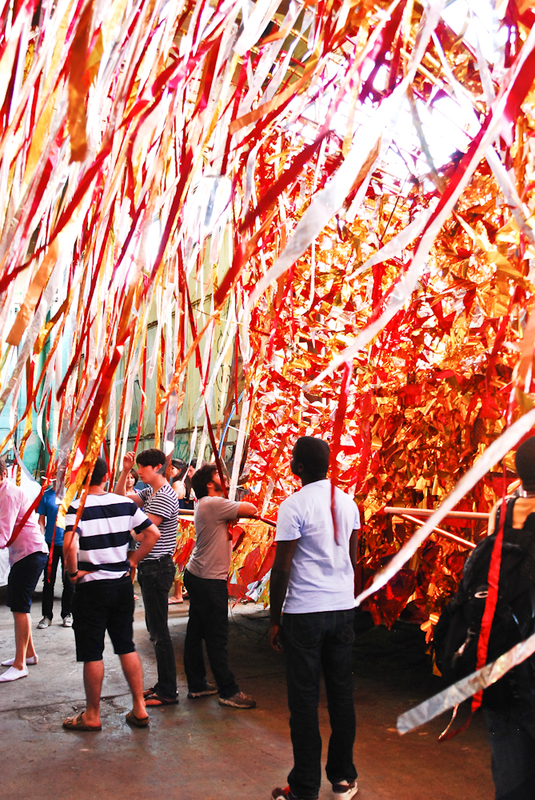 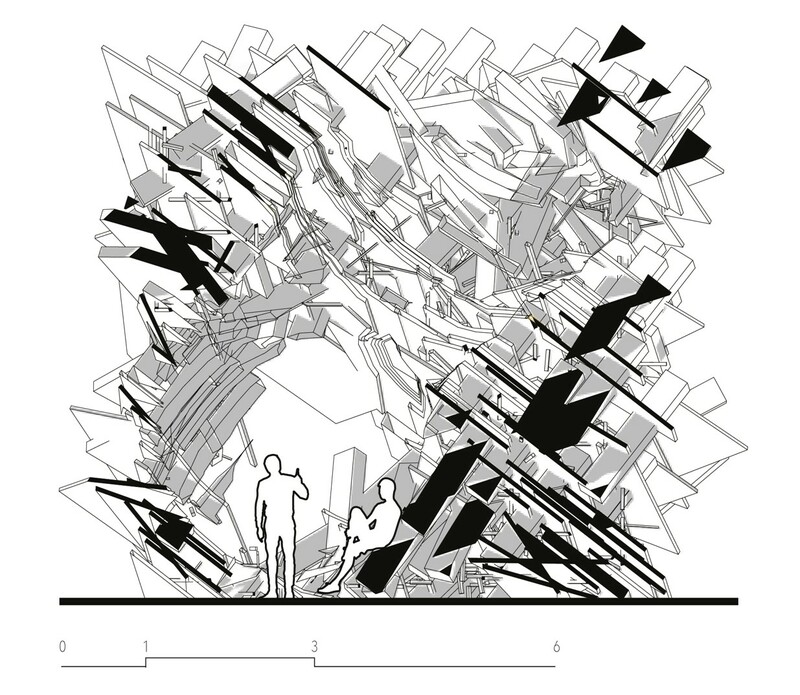 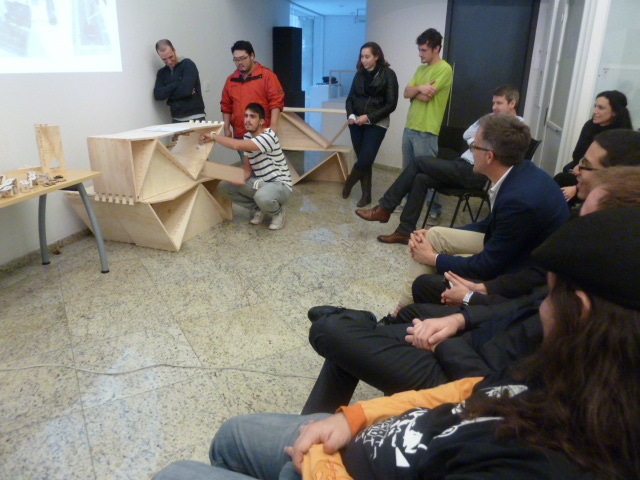 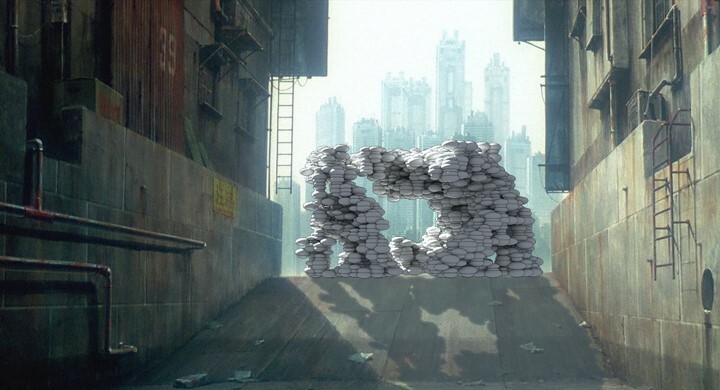 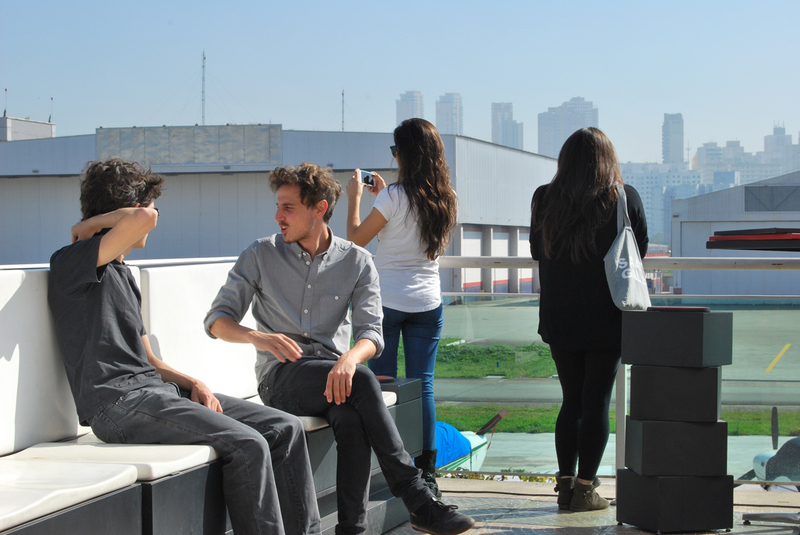 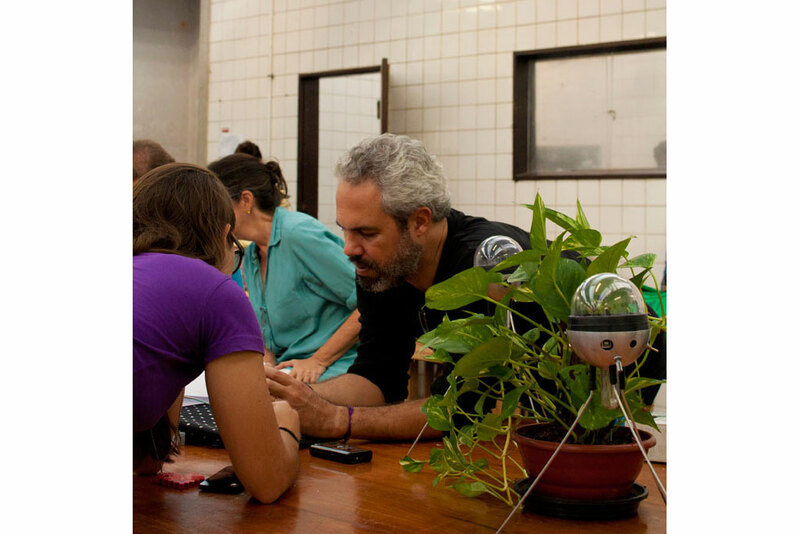 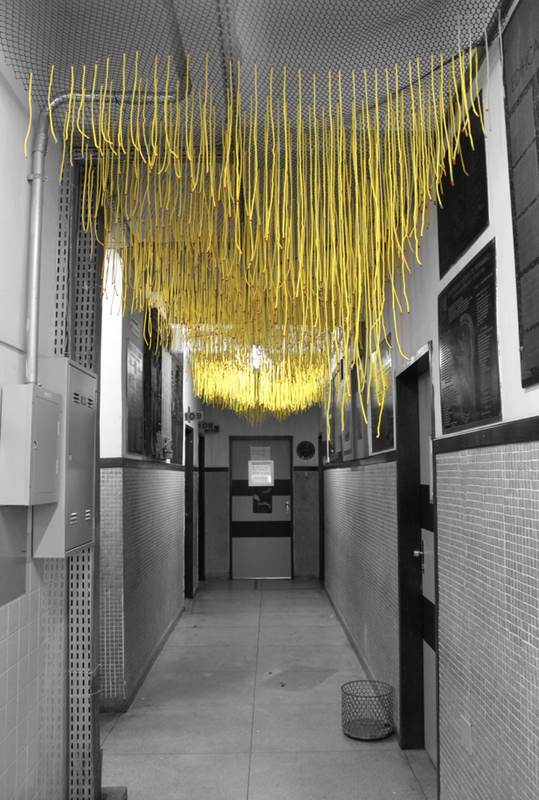 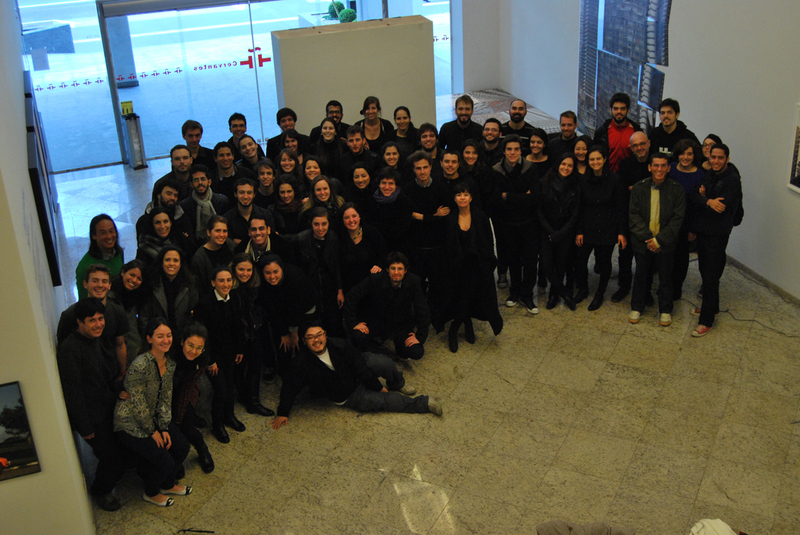 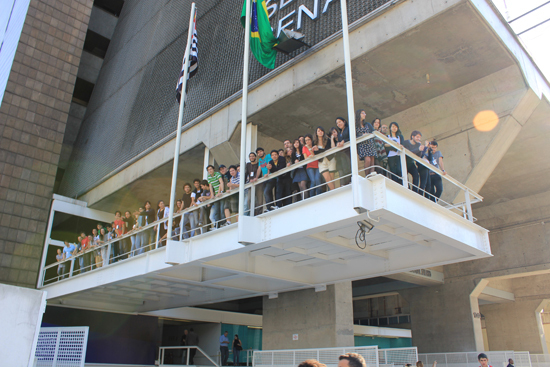 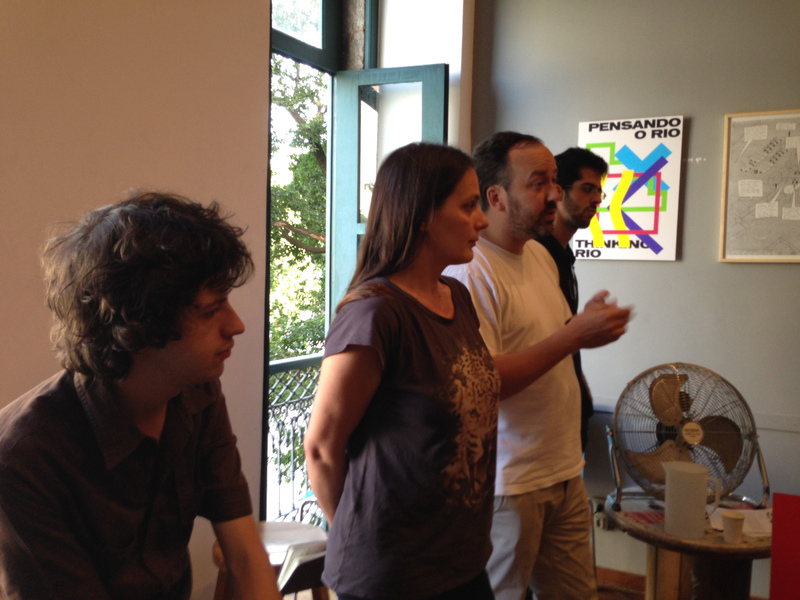 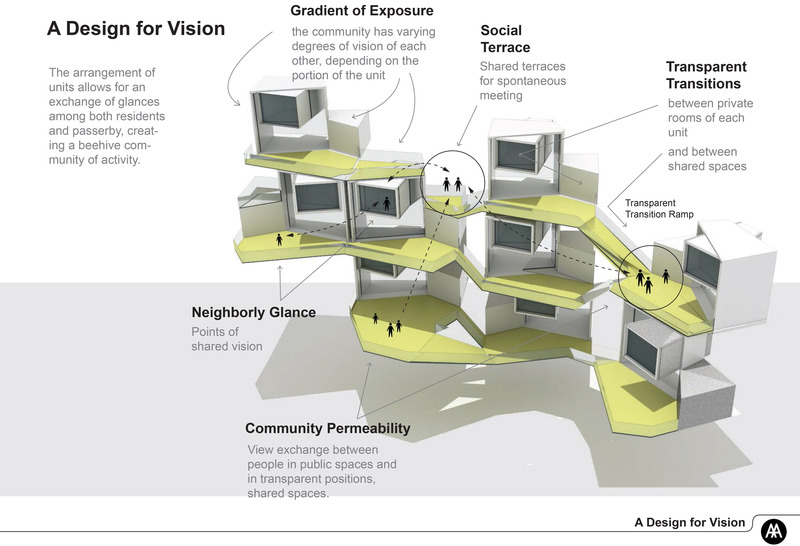 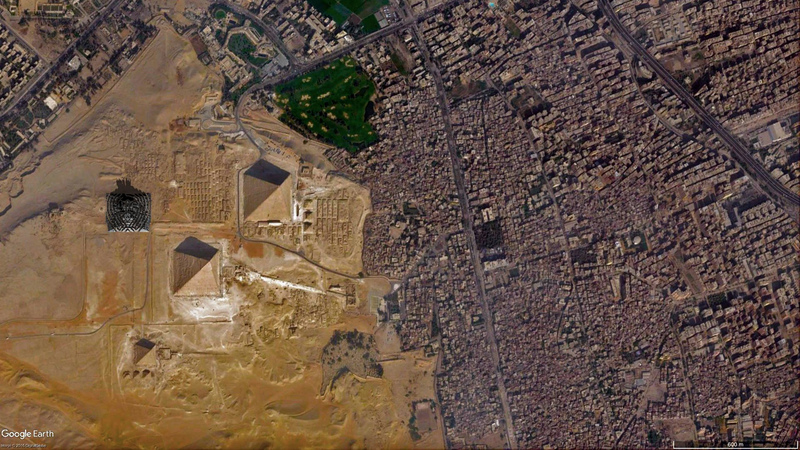 July 16th–25th, 2013 - The premise of the 2013 São Paulo Visiting School is to re-define urban architecture through creating a symbiotic fusion between landscape, infrastructure and building design. 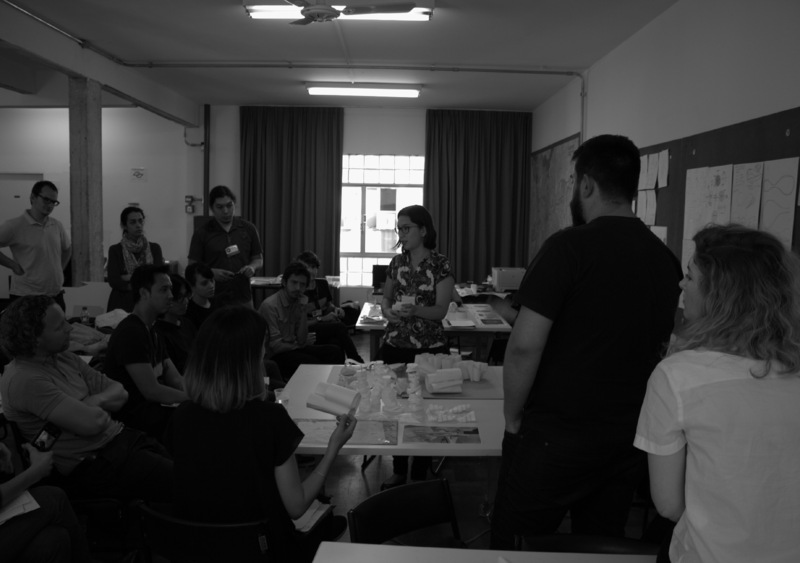 Workshops, lectures and seminars will challenge the environmentally destructive urban planning of the 1960’s local government of São Paulo, which destroyed major water systems to build a network of macro-scaled roadways and zoning divisions, which has caused flooding, pollution and urban decay. 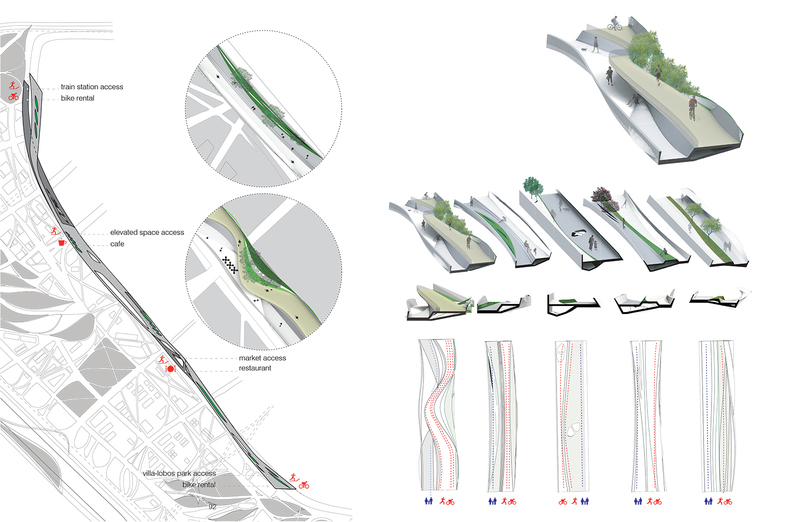 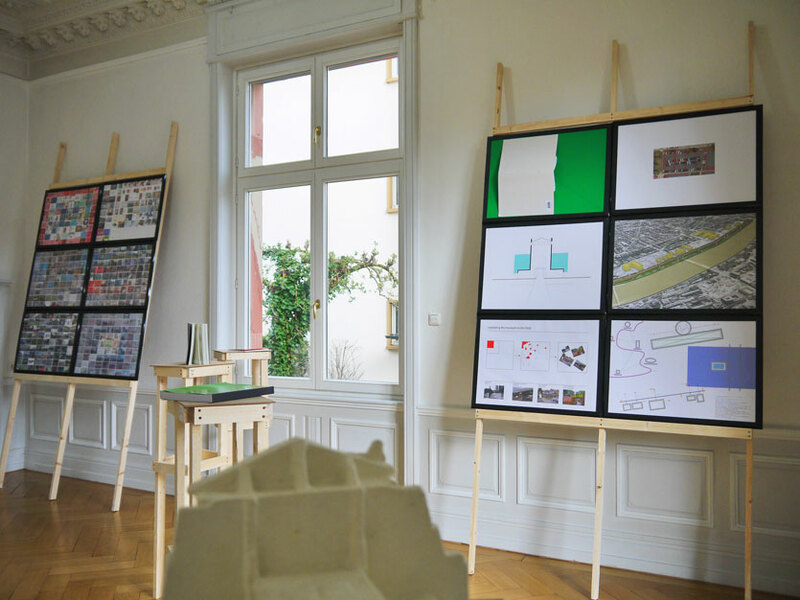 Instead, the Visiting School promotes an intricate integration of natural eco-systems within new multi-modal interfaces connecting urban transport and building infrastructures. 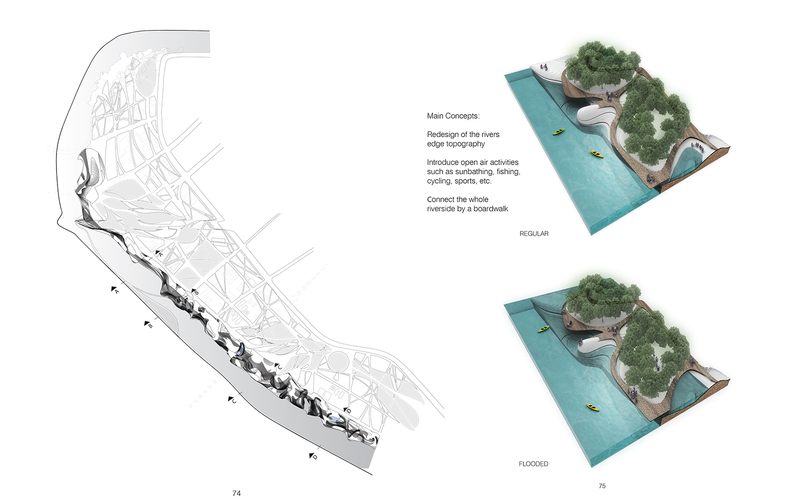 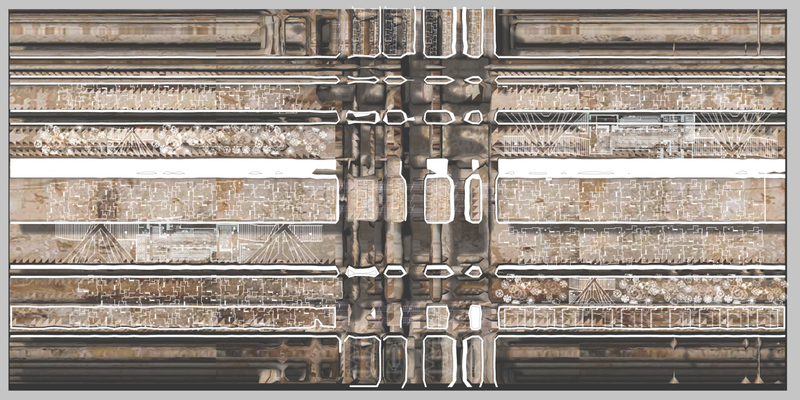 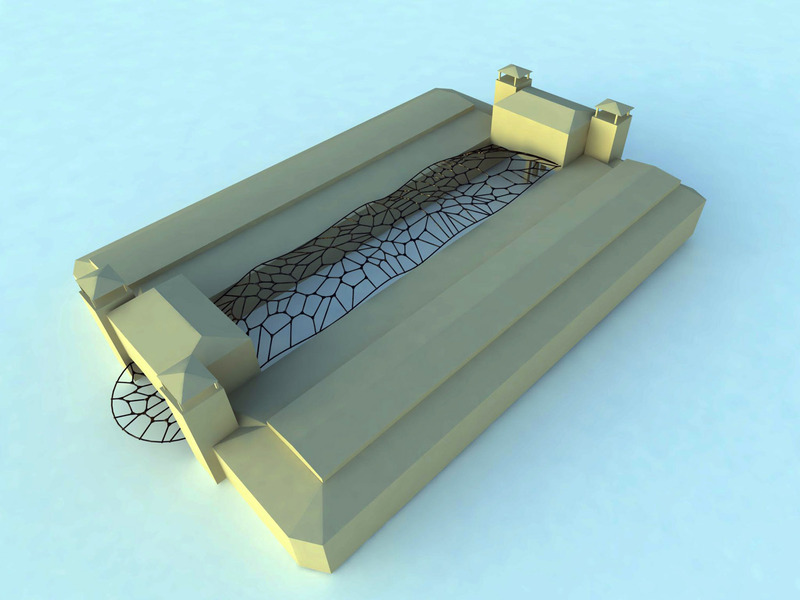 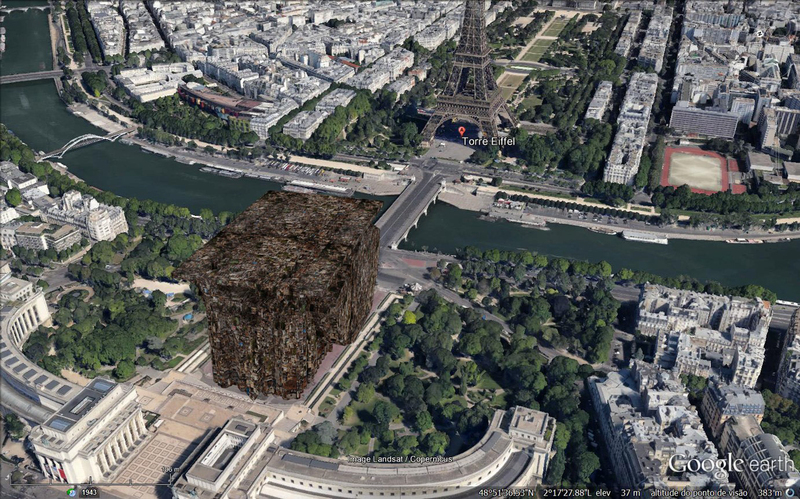 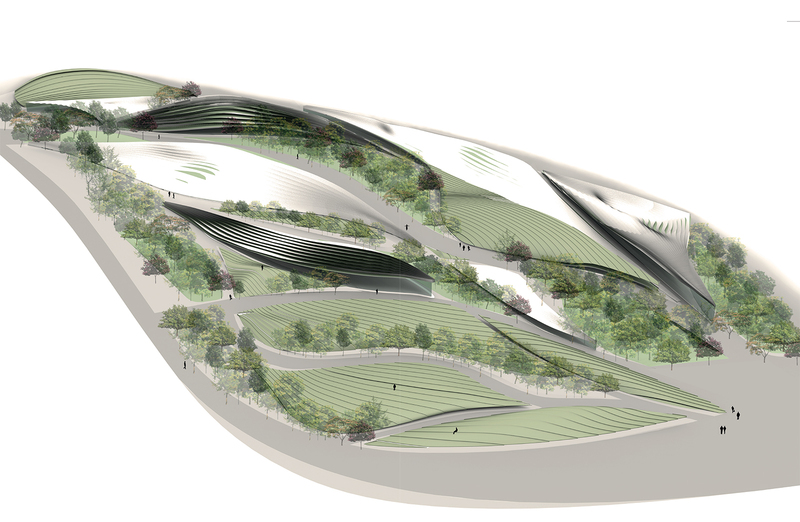 This will be achieved through the use of advanced computational design incorporating parametric design and interactive media, to create highly responsive landscape-urban systems. 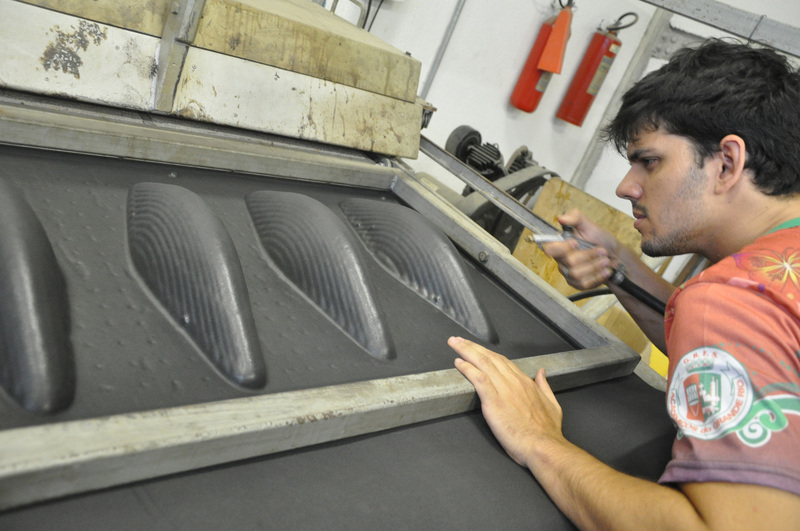 10-19 JULY 2012 The Barra Funda district of São Paulo was once characterised by a vibrant mix of small industrial, commercial and residential programmes, but over time, as economic policies have favoured agglomerated, larger production industries, numerous companies have abandoned the area and moved to the periphery or even abroad. 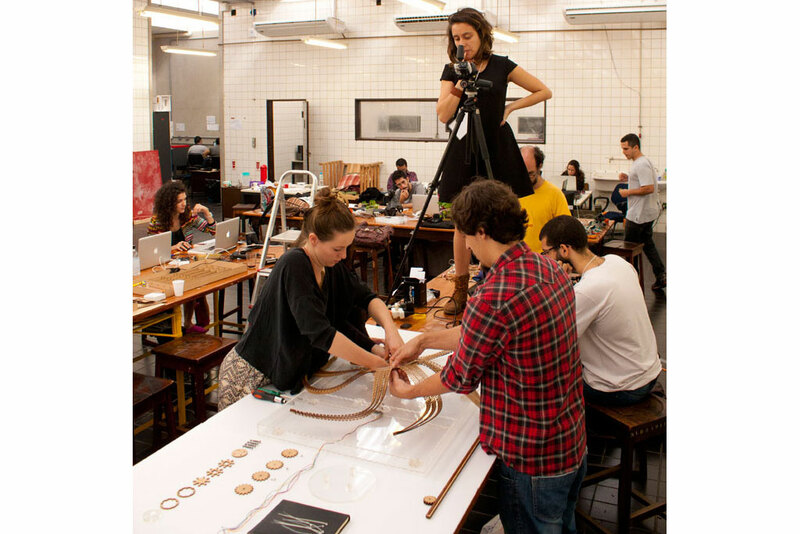 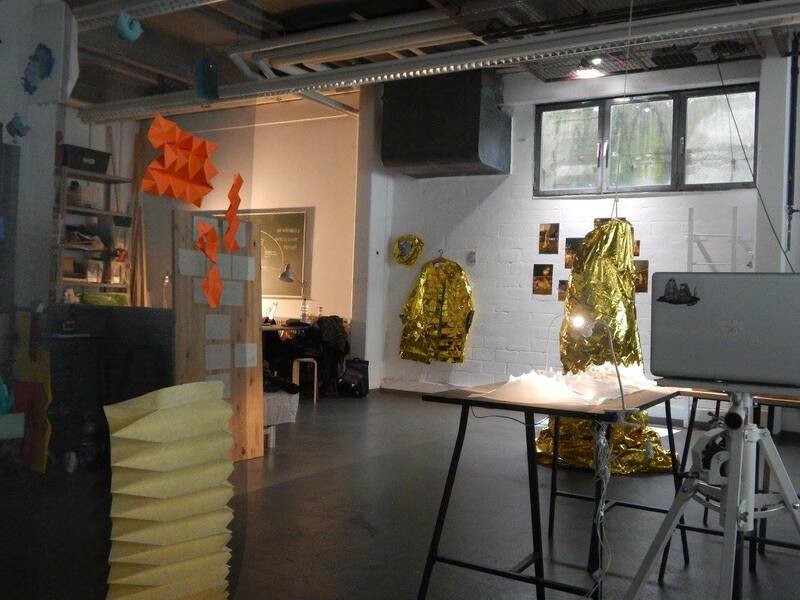 In response to this decentralisation, the workshop proposes the creation of new types of smaller industries to produce a mix of both consumption and production within the centre, manifested through micro-manufacturing interventions that can co-exist alongside retail and housing. 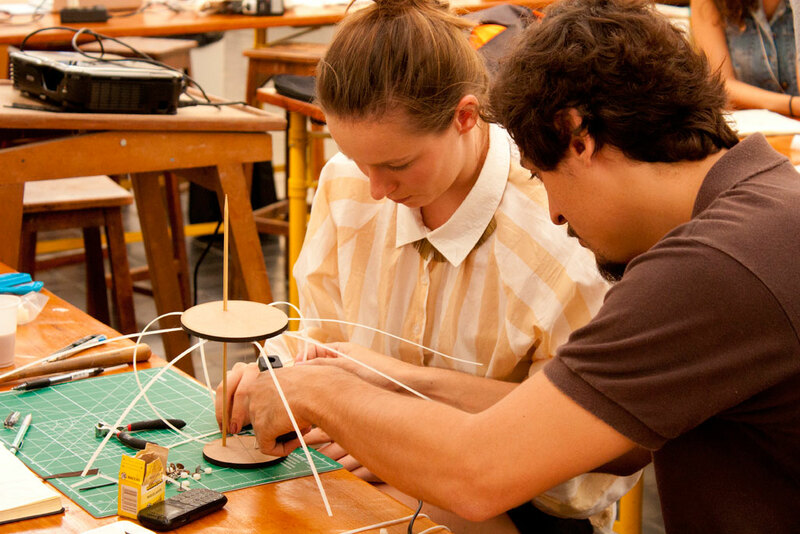 At its core will be the idea that computational design and digital fabrication can be used to help create these new micro-industries, which in turn will help empower local craftsman to produce and sell directly to consumers through micro-manufacturing, located in small urban workshops implanted within the centre district. 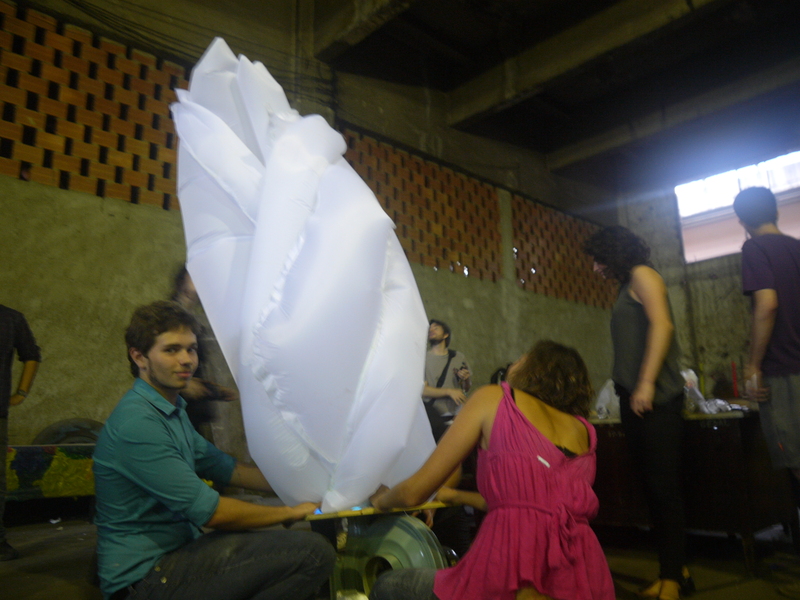 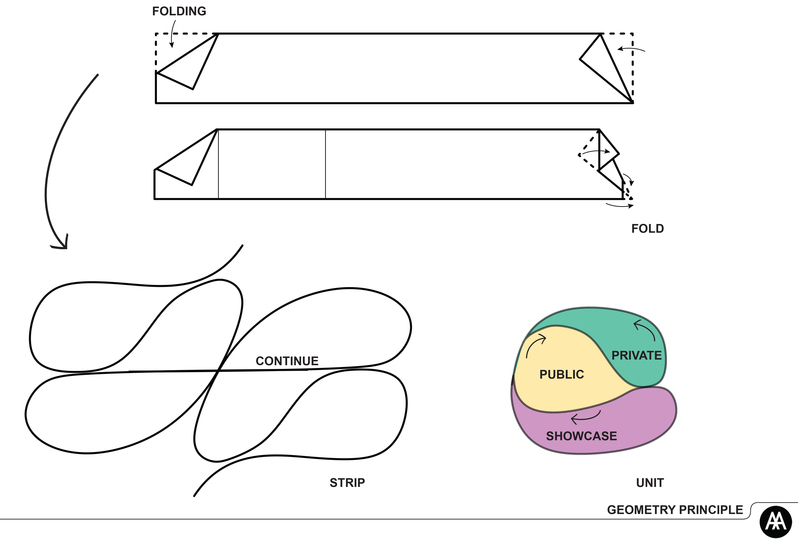 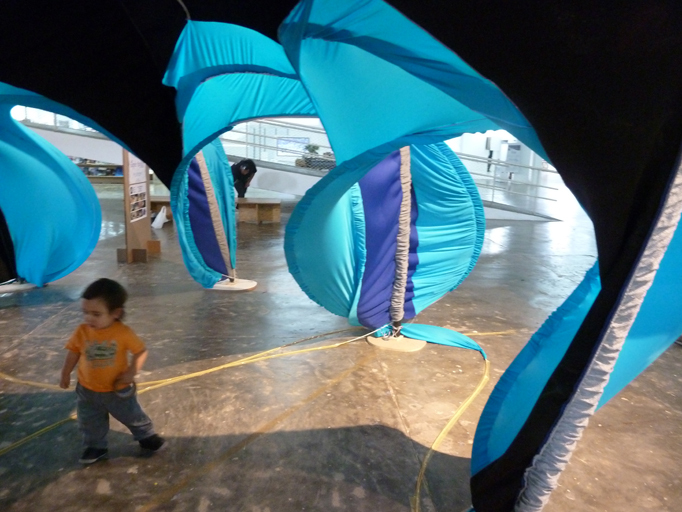 30 March – 7 April 2012 Pimpolhos da Grande Rio Escola de Samba – RIO DE JANEIRO The second stage of the Supple Pavilions workshop series will focus on the development and 1:1 fabrication of a network of interactive pavilions and related artifices. 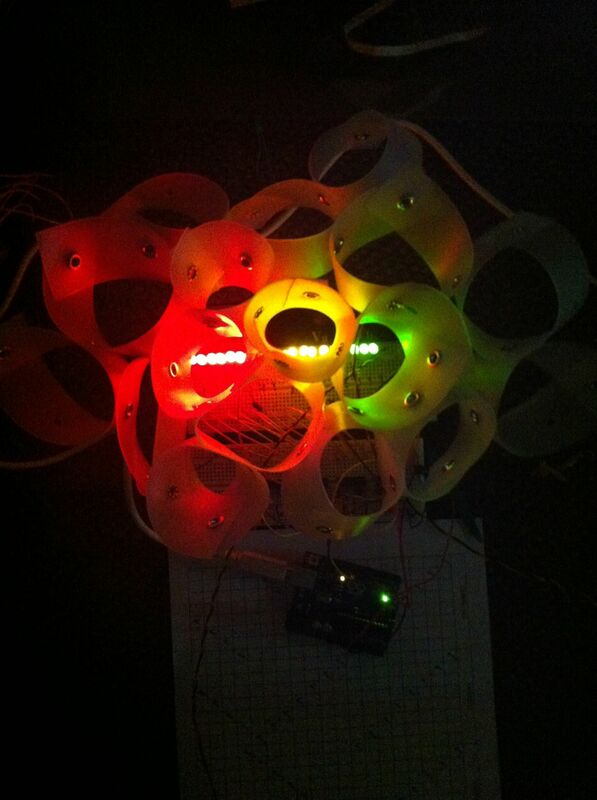 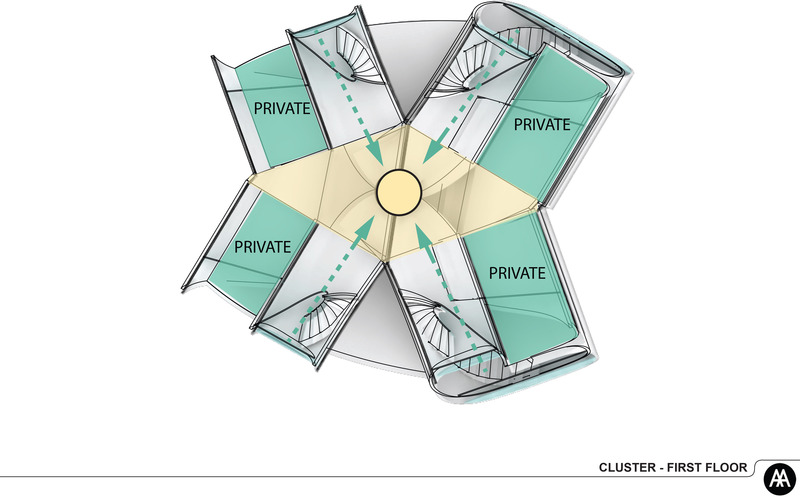 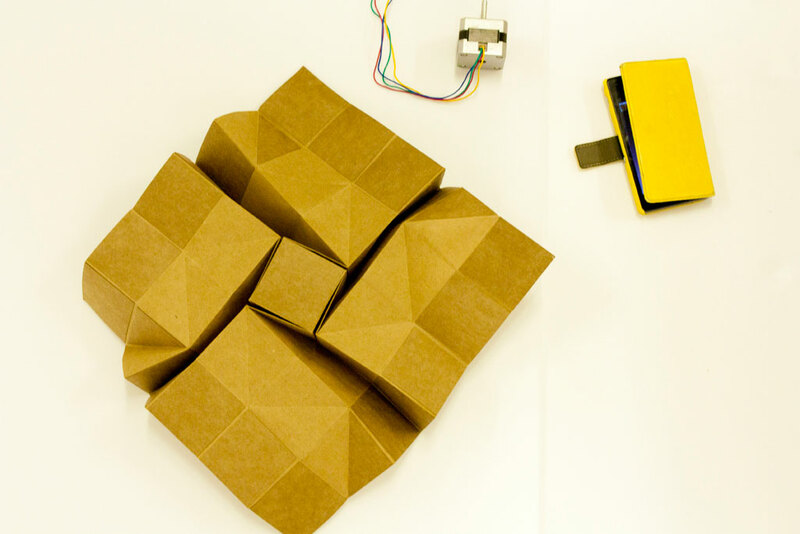 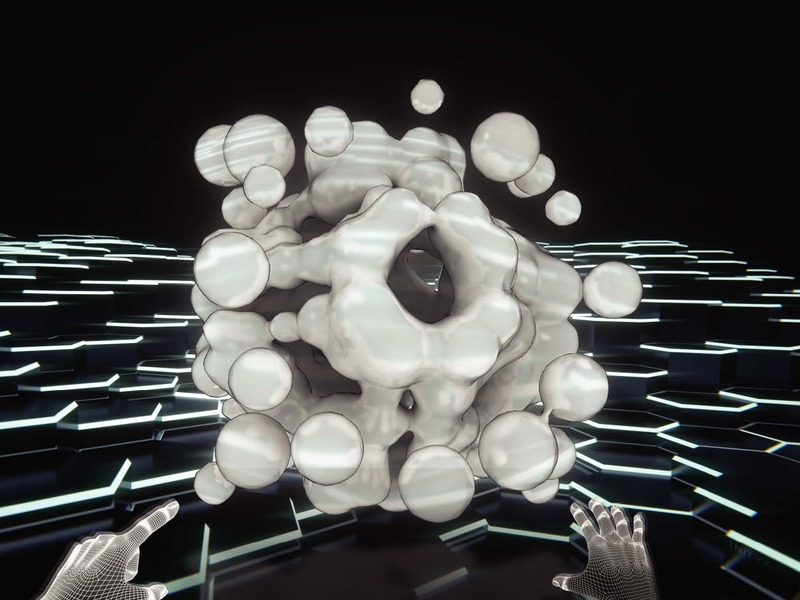 These elements will react to sensors, creating a range of different lighting and spatial effects that will trigger further movement and produce a feedback loop of behaviour and response. 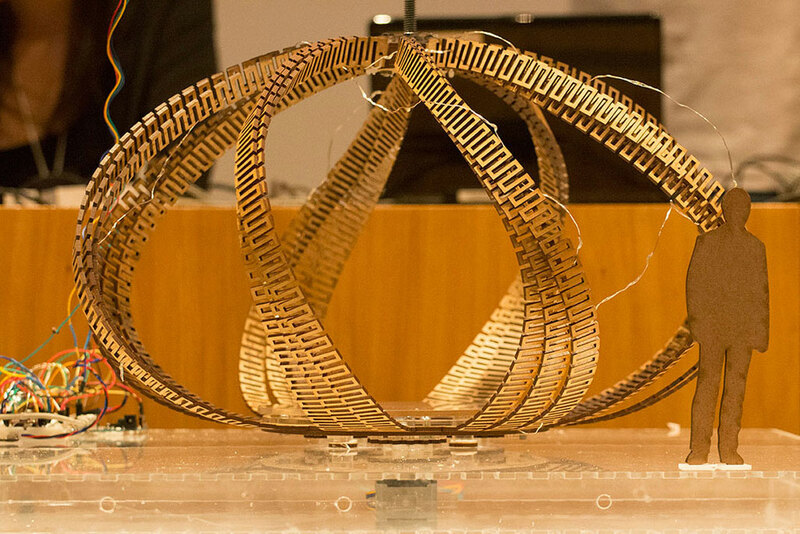 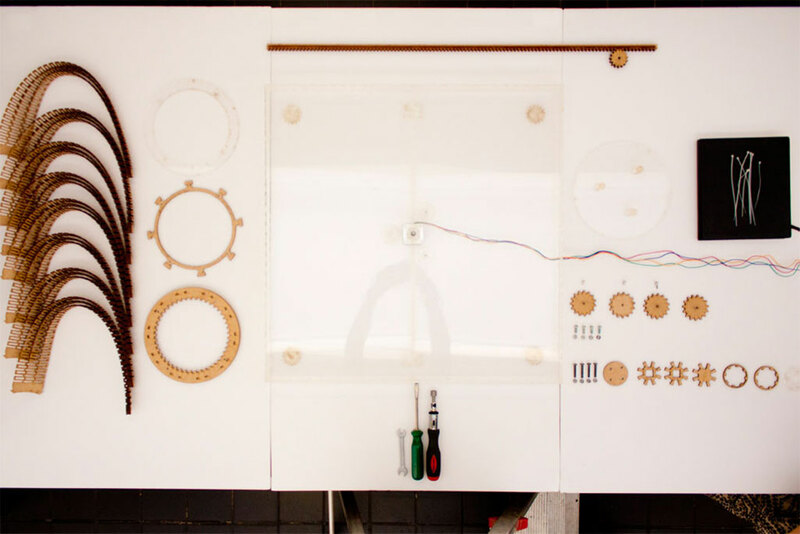 To accommodate this respon­siveness, the design will be developed using parametric associative modeling, processing, arduino, and digital fabrication using the CNC and Laser Cutters. 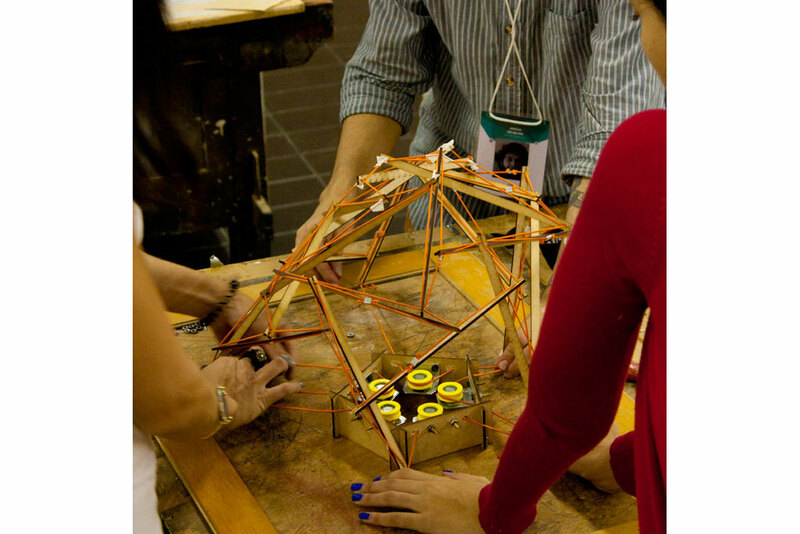 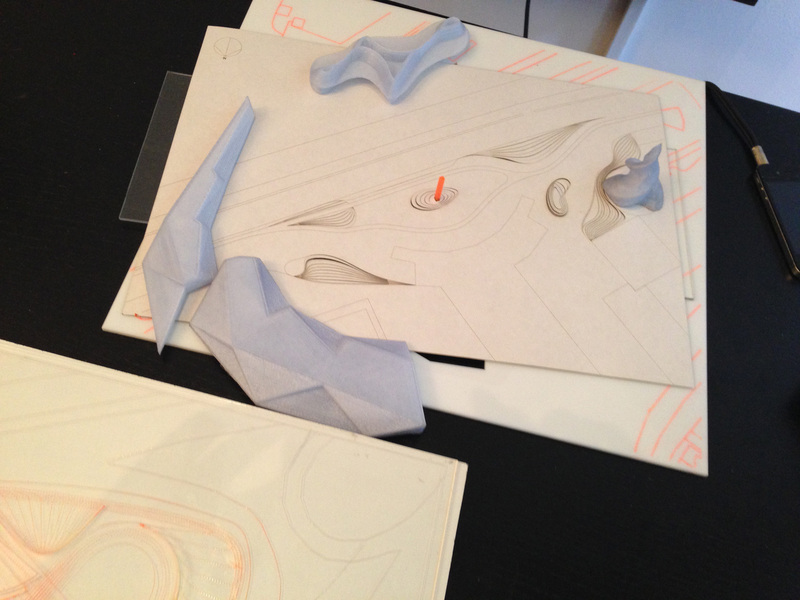 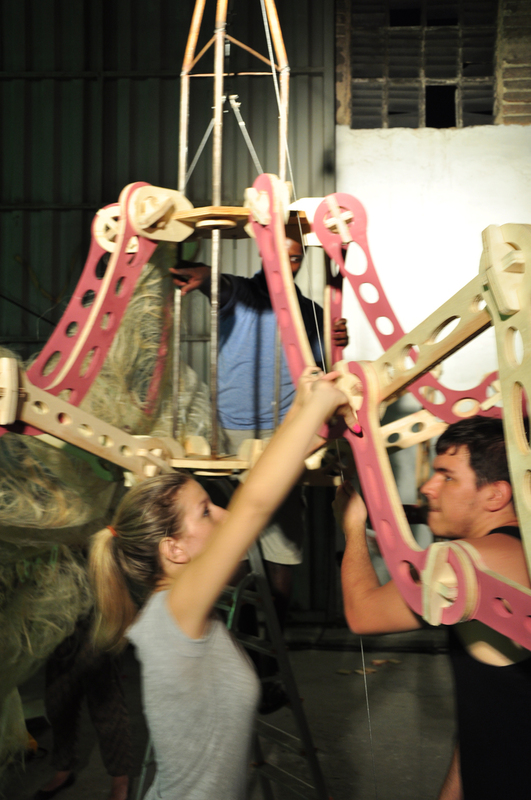 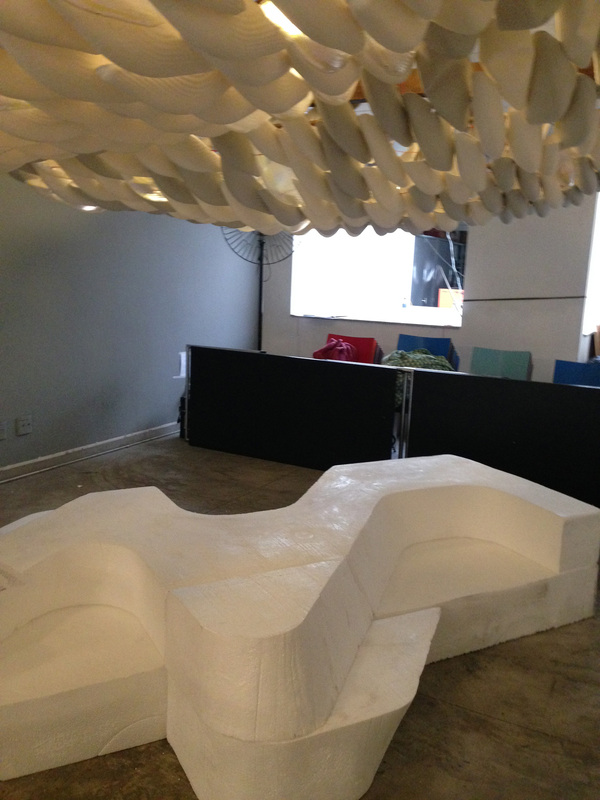 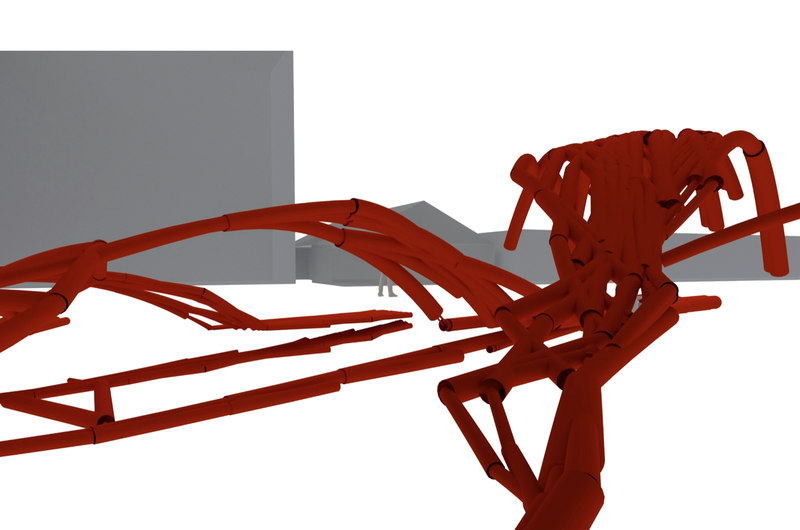 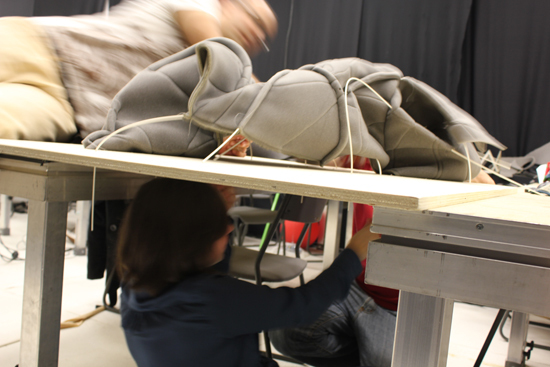 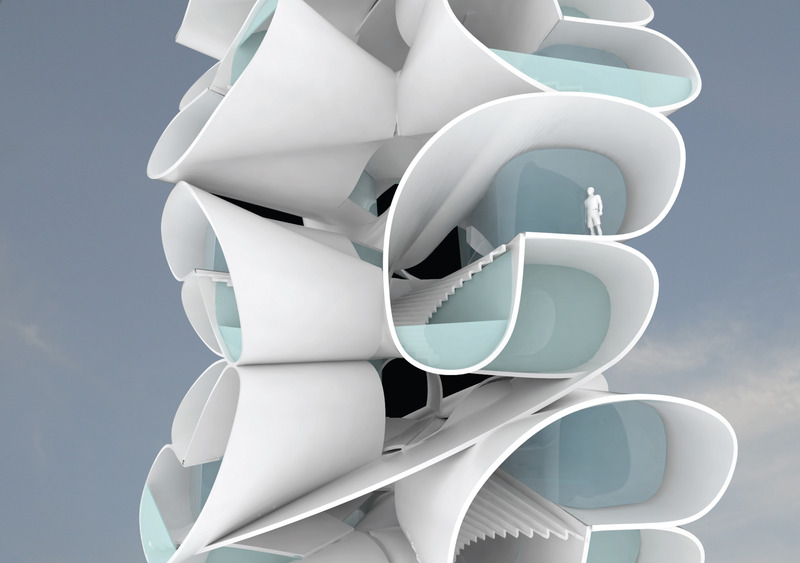 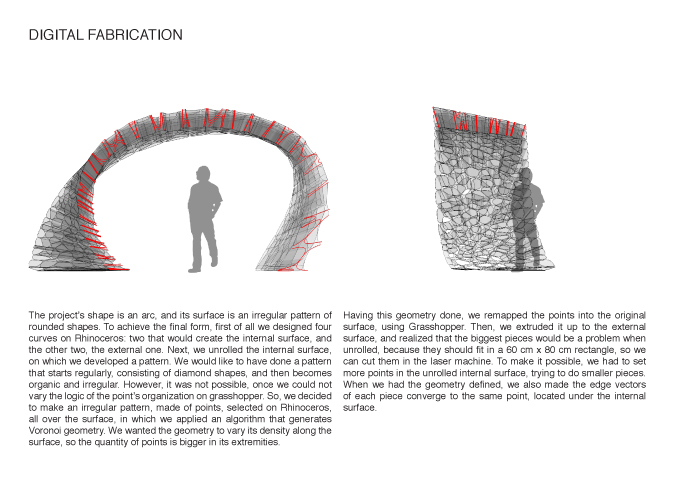 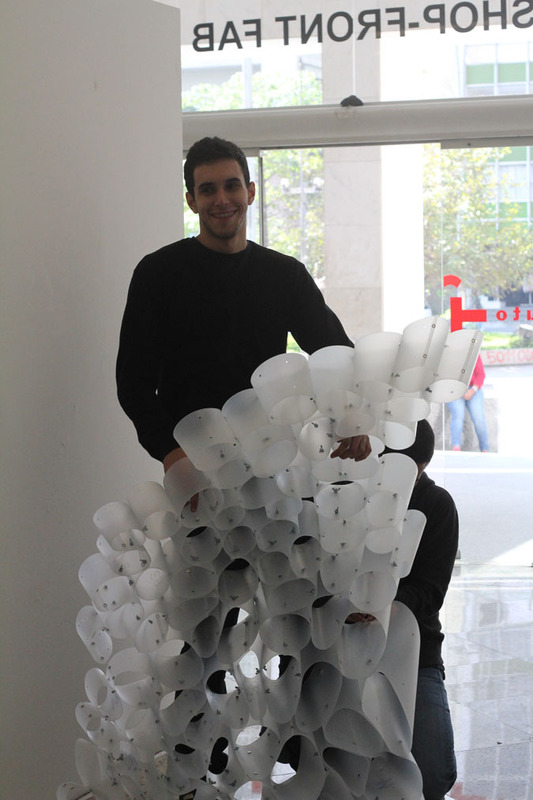 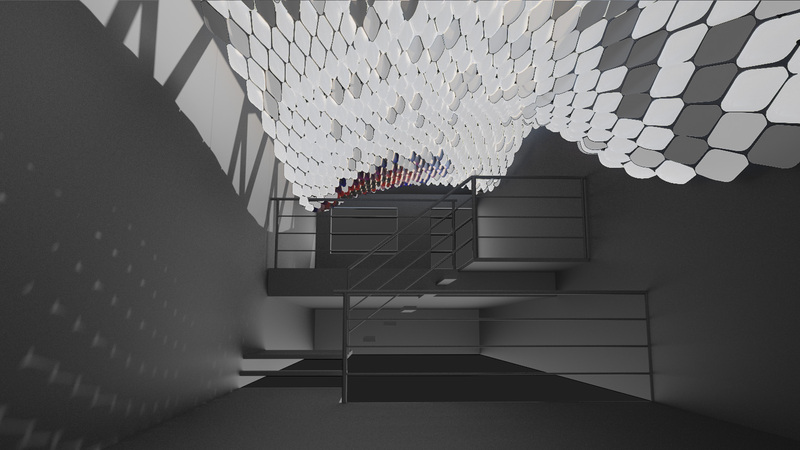 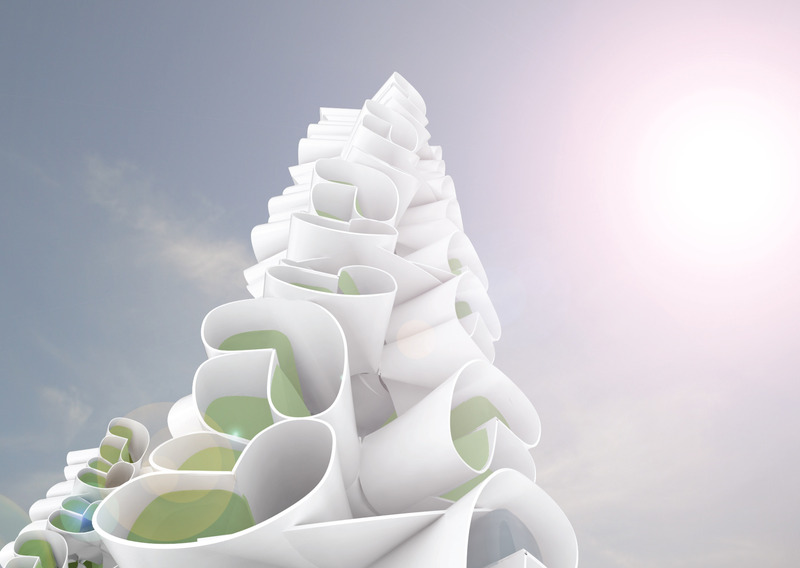 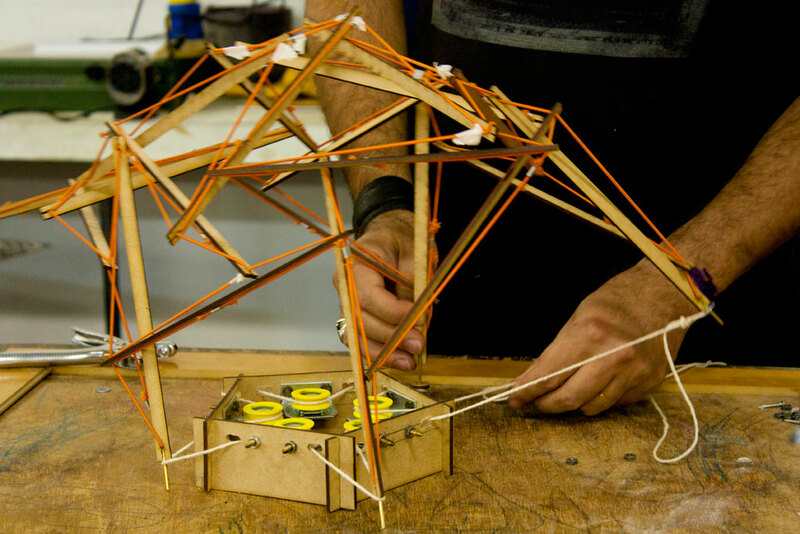 Students can both develop completely new designs, and/or work on the evolution of the Workshop 1 Supple Pavilion project. 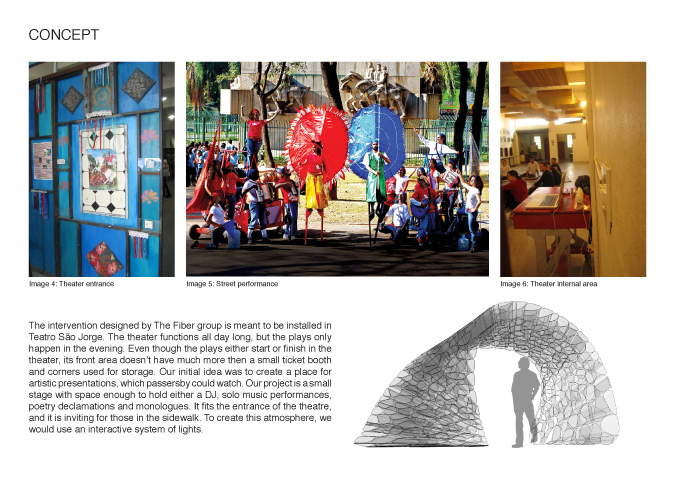 The Visiting School will return to Pimpolhos da Grande Rio Samba School to evolve the design of the migrating Pavilions, their contents and their context, exploring a design philosophy of interactive event design and the production of a creative fusion of high-tech design generation and fabrication with low-tech redefinition of Carnival-float artisan techniques, paraphernalia, and materials. 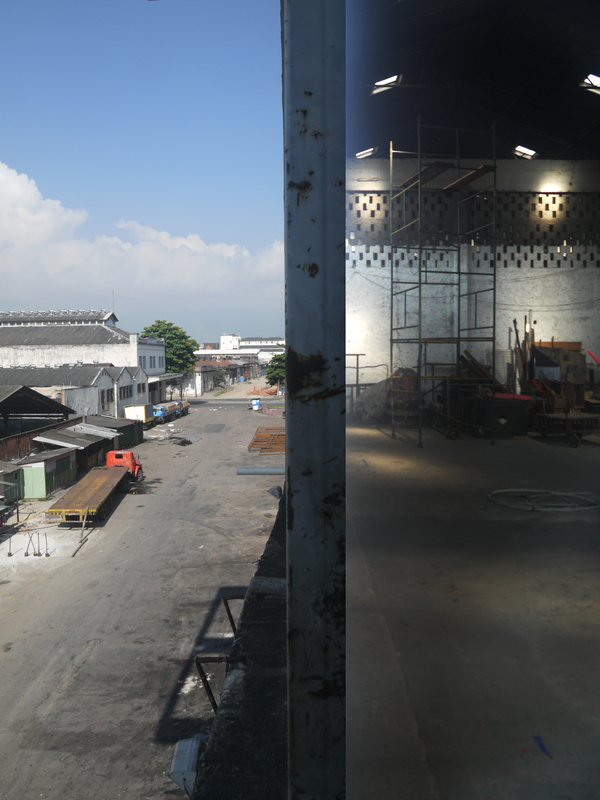 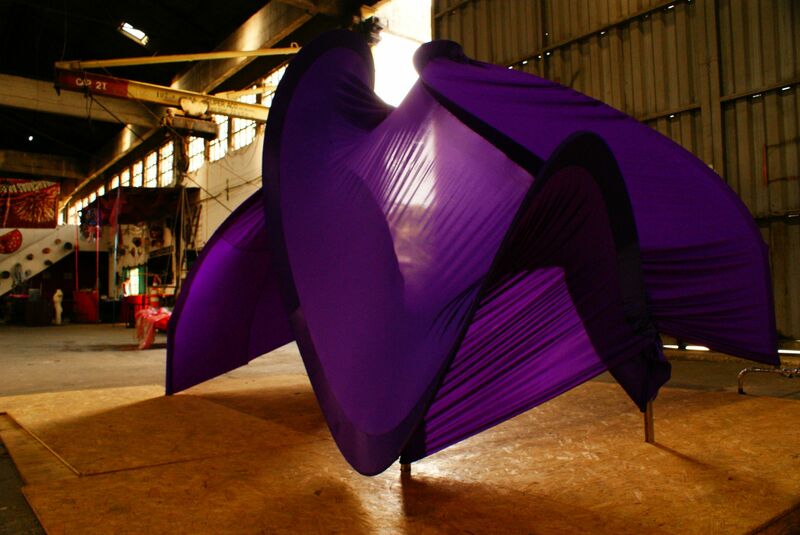 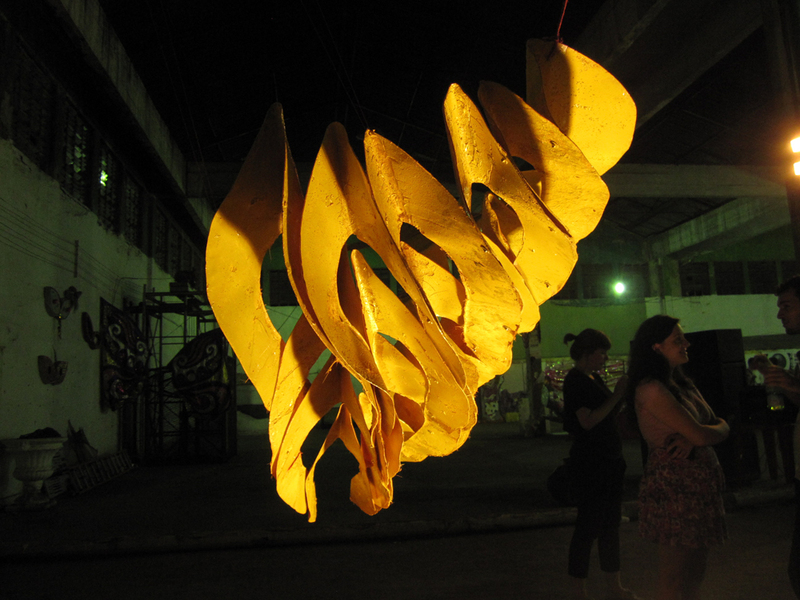 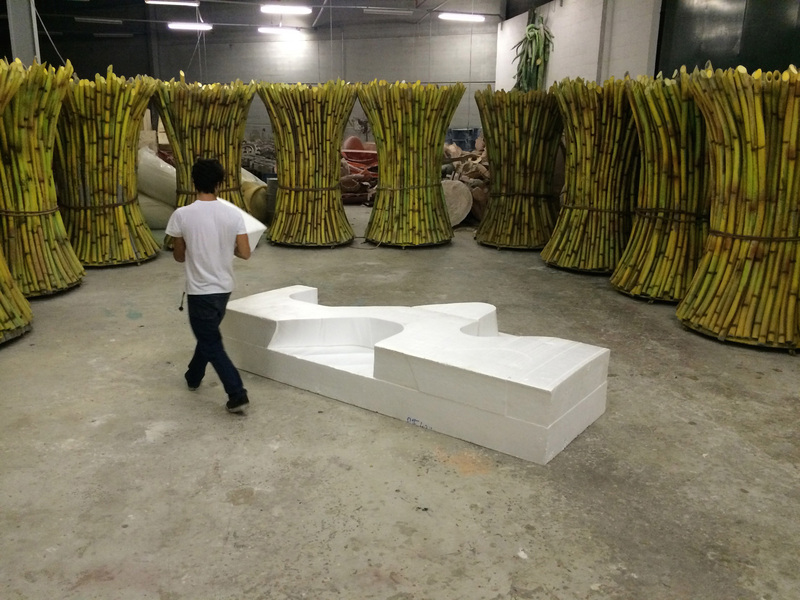 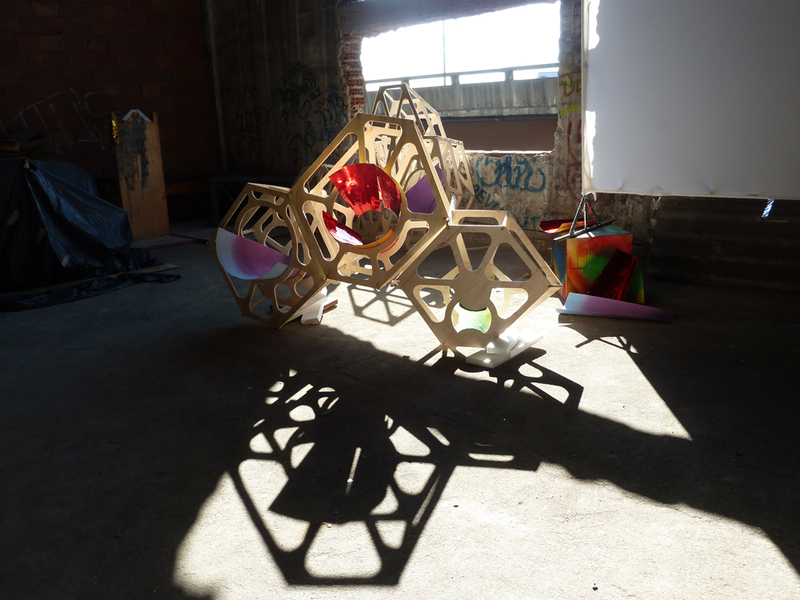 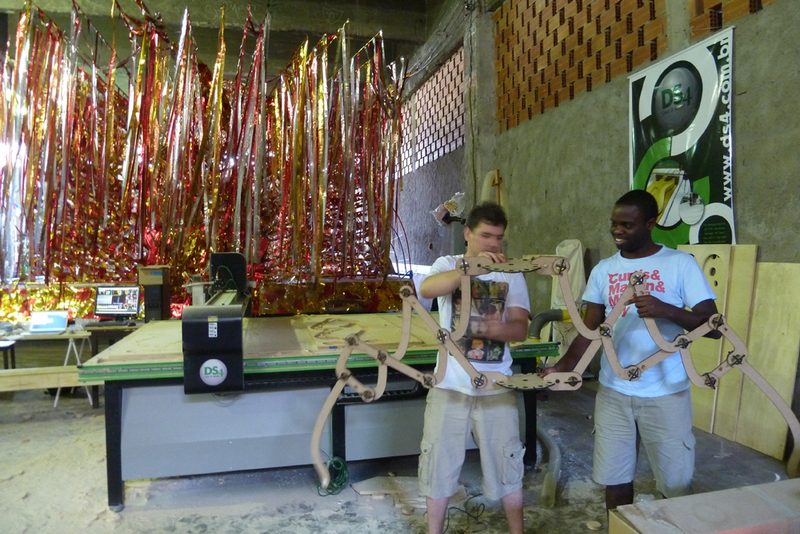 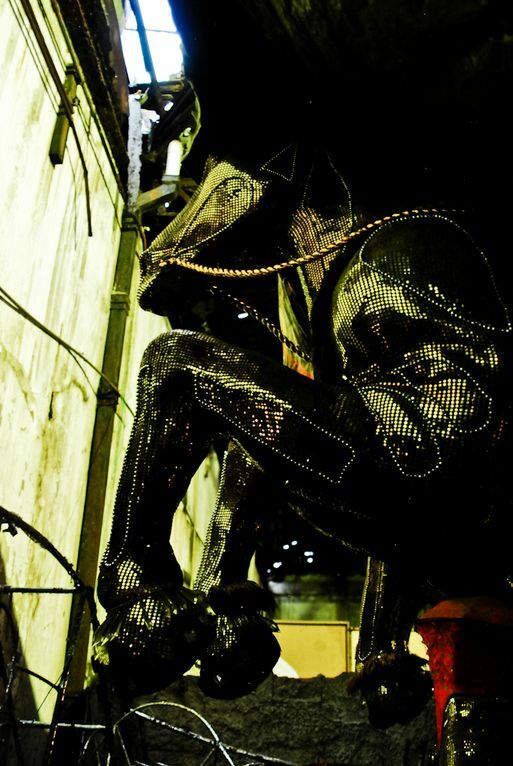 We will work in the immense and creative Pimpolhos warehouse, collaborating with local artisans of several Samba Schools in the post-industrial, partly-derelict Porto do Rio area, (the birthplace of the Carnival and Samba), introducing digital fabrication techniques. 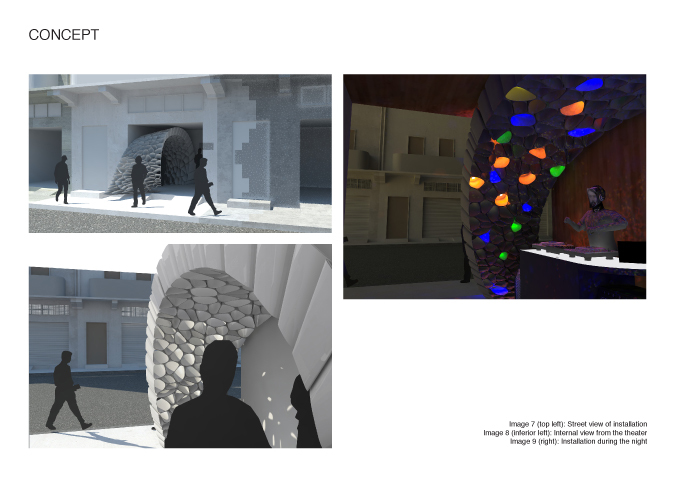 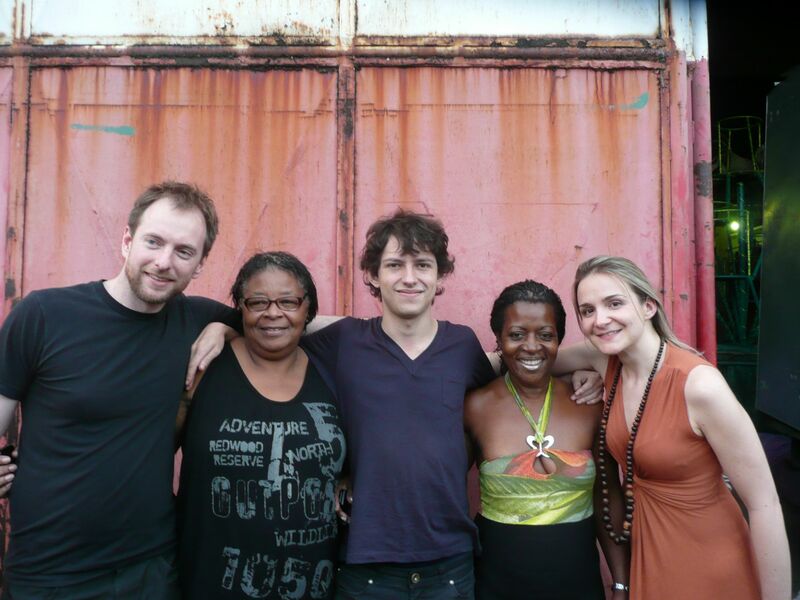 The goal is to create interventions for micro-venues and cultural events that express the identity of the Samba culture within the `Porto Maravilha` planning. 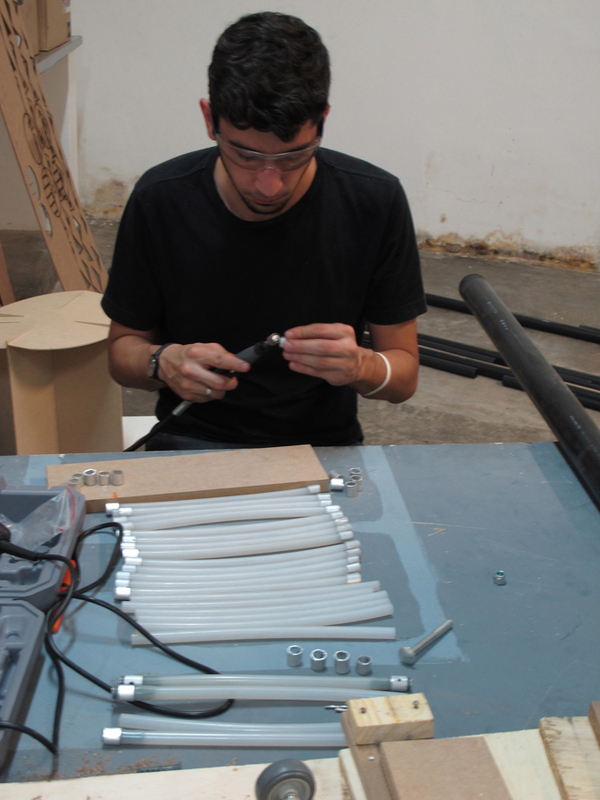 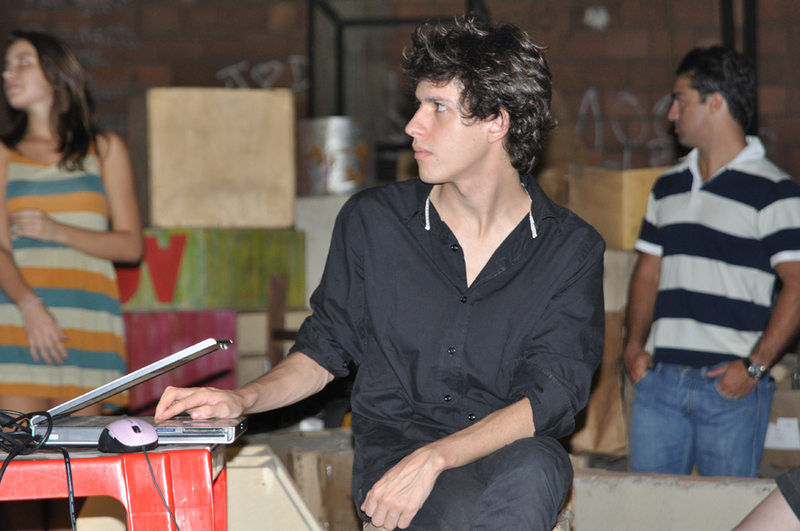 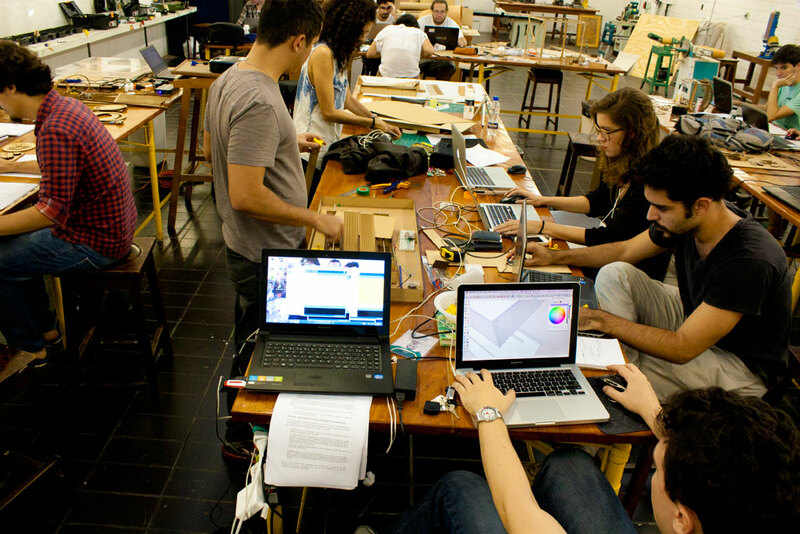 29/11/2011 to 02/12/2011 Extending the São Paulo High-Low Visiting School, this four-workshop programme will focus on the 1:1 fabrication design of an interactive pavilion for the 2012 International Festival of Electronic Language (F.I.L.E.). 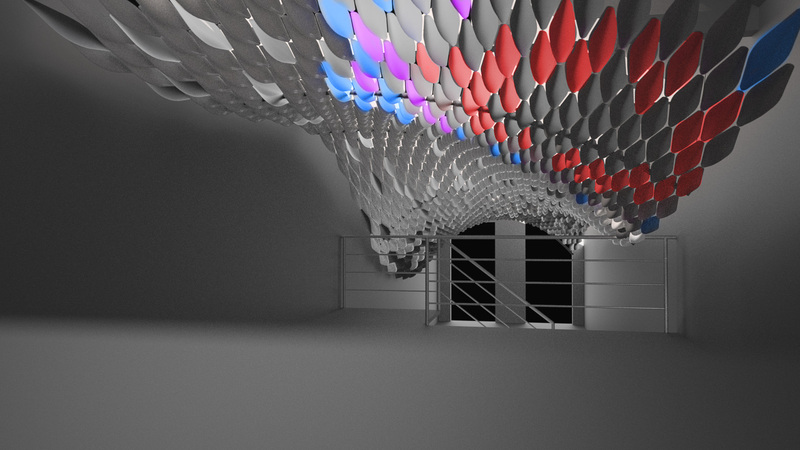 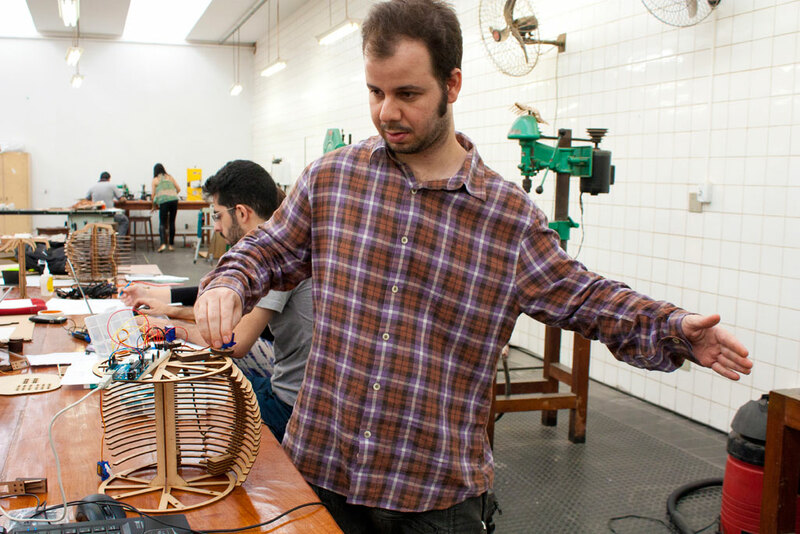 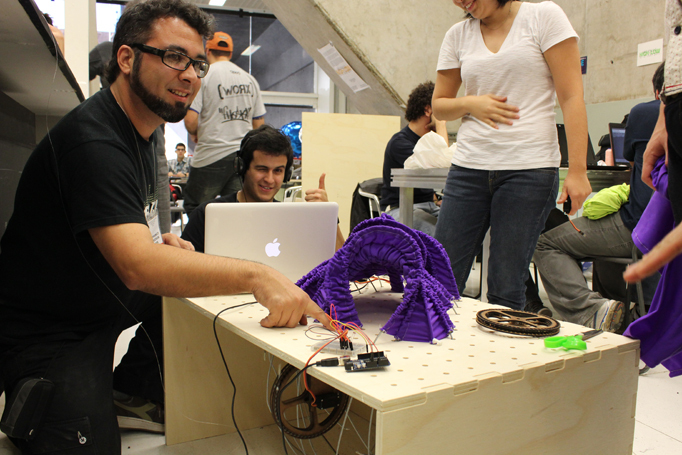 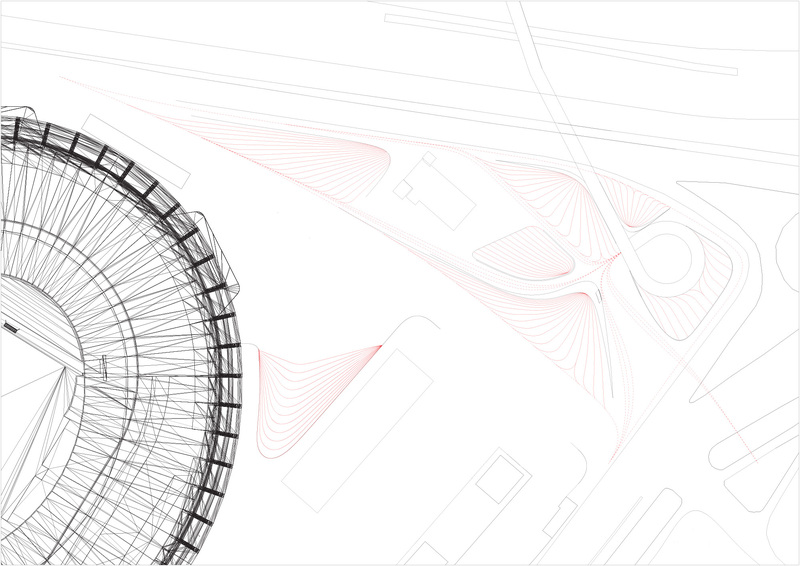 To be located along Avenida Paulista, the aim is to create an interactive and supple design, using recursive scripting, associative modelling, processing and Arduino with digital fabrication. 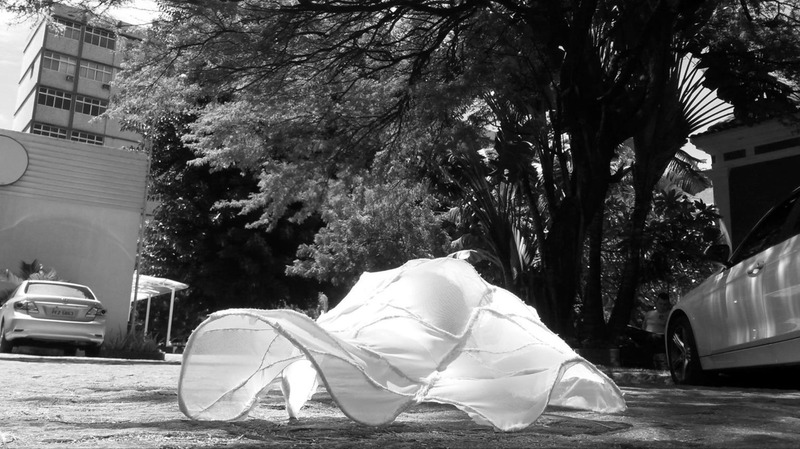 Based on the Strings Pavilion design of the 2011 High-Low workshop, the pavilion will react to light sensors and human activity, so as to transform and create a range of different lighting and spatial effects, triggering further movement of the pavilion and producing an interactive feedback loop of behaviour and response. 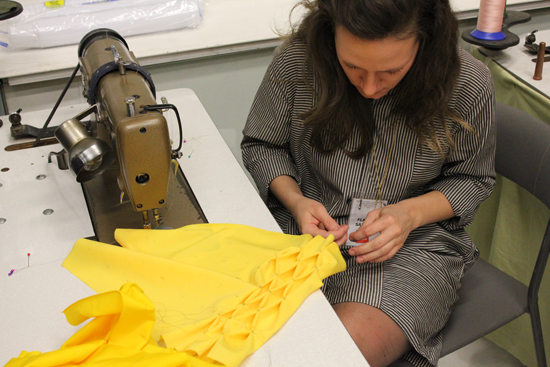 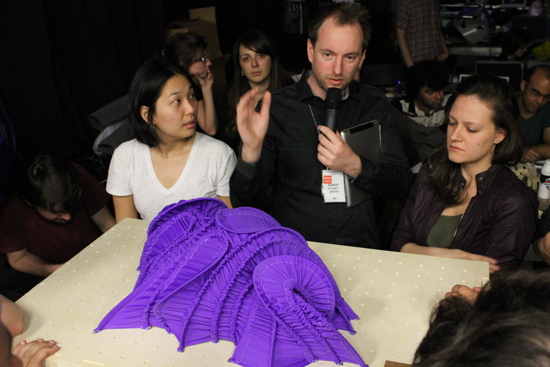 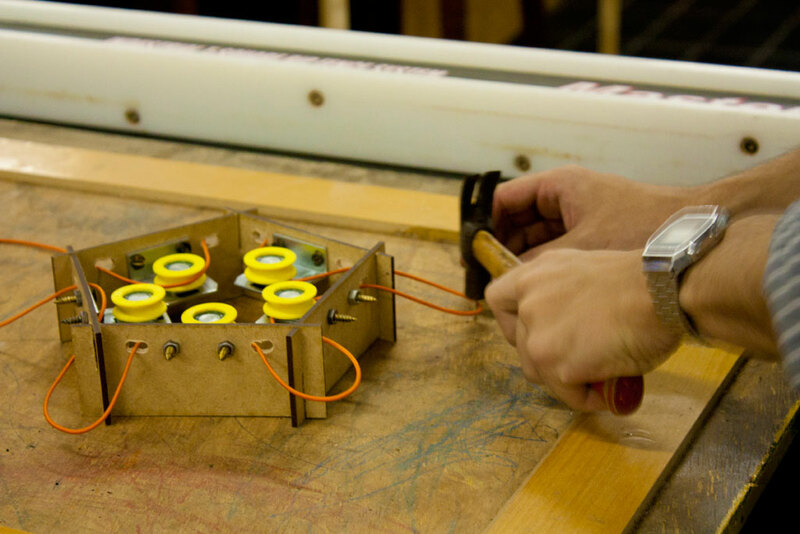 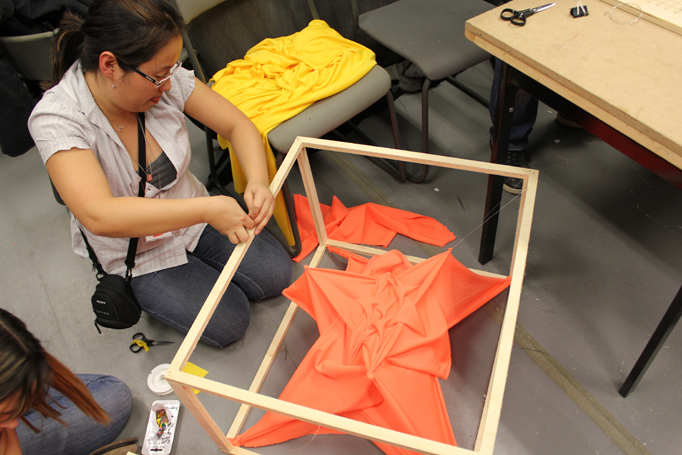 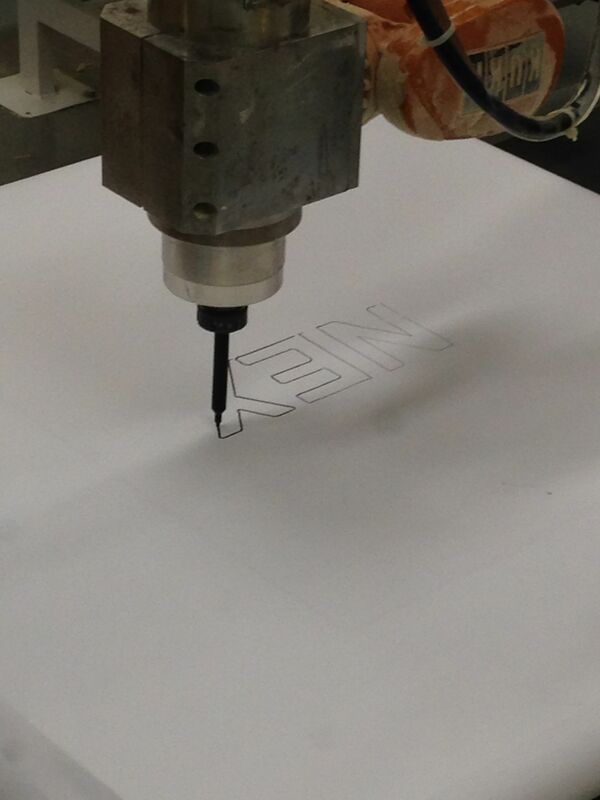 Each workshop will focus on a different phase of design fabrication. 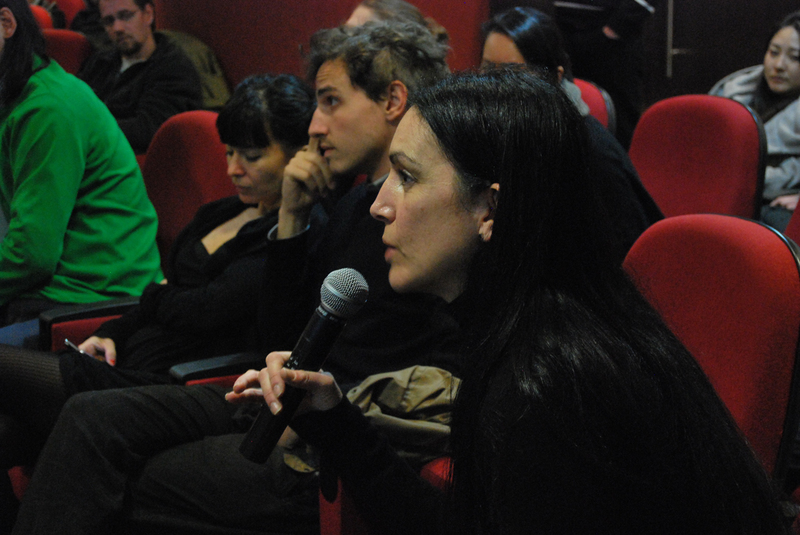 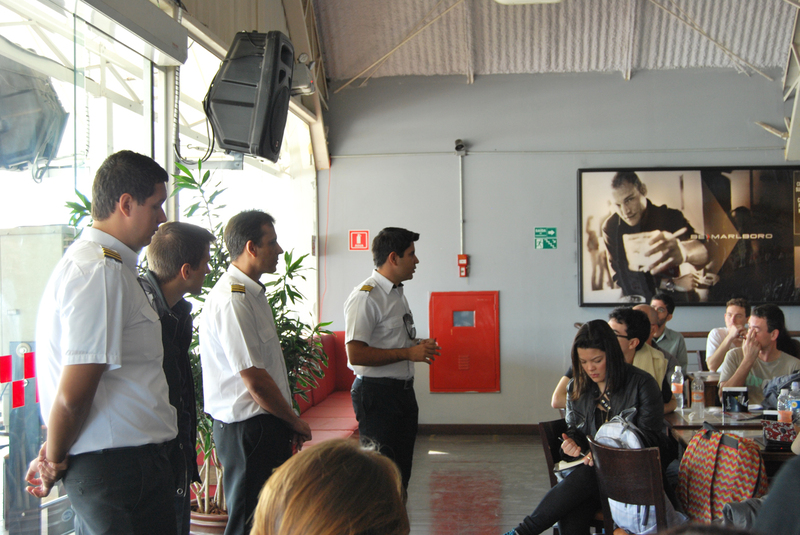 Participants can take part in one or more workshops, fee discounts will be given for multiple workshops. 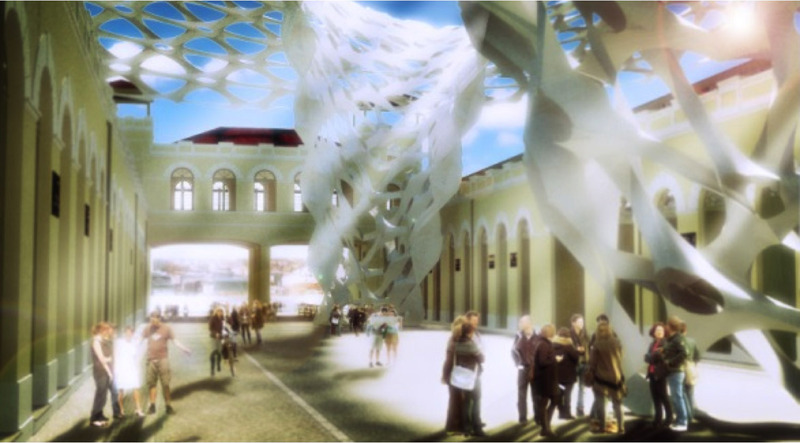 Design instruction will be led by Rob Stuart Smith of Kokuggia and Tristan Simmonds of Simmonds Studio, with Lawrence Friesen of Generative Geometry, Anne Save de Beaurecueil and Franklin Lee of SUBdV, other AA tutors, and the original Strings Pavilion design team, as well as local structural engineers and set-designers. 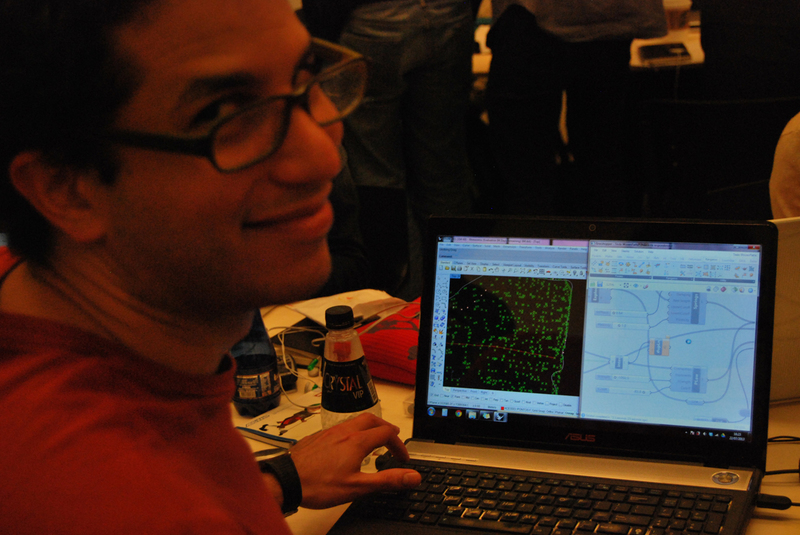 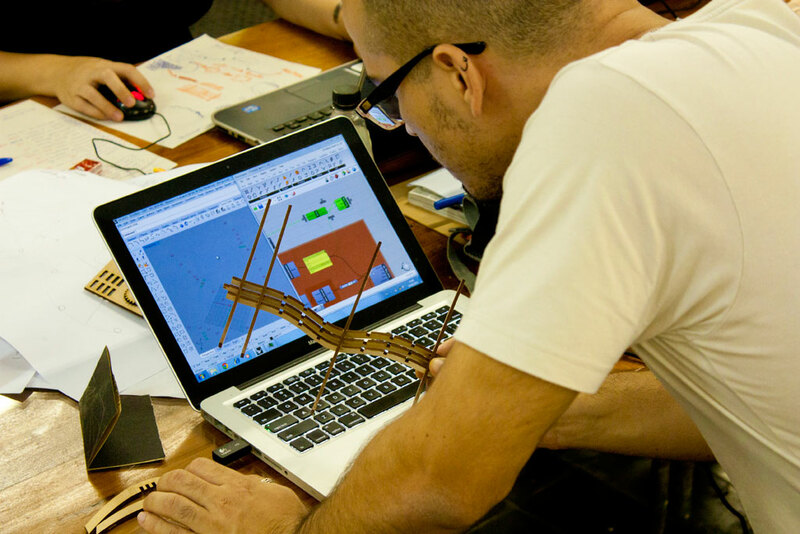 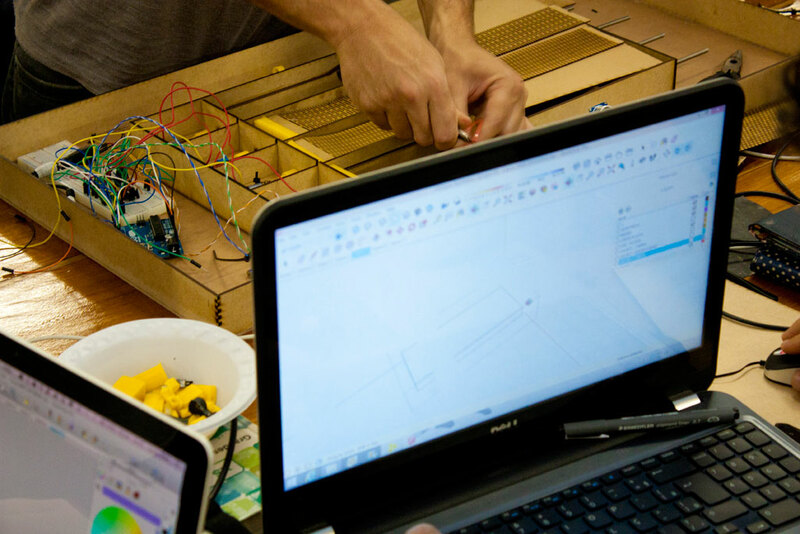 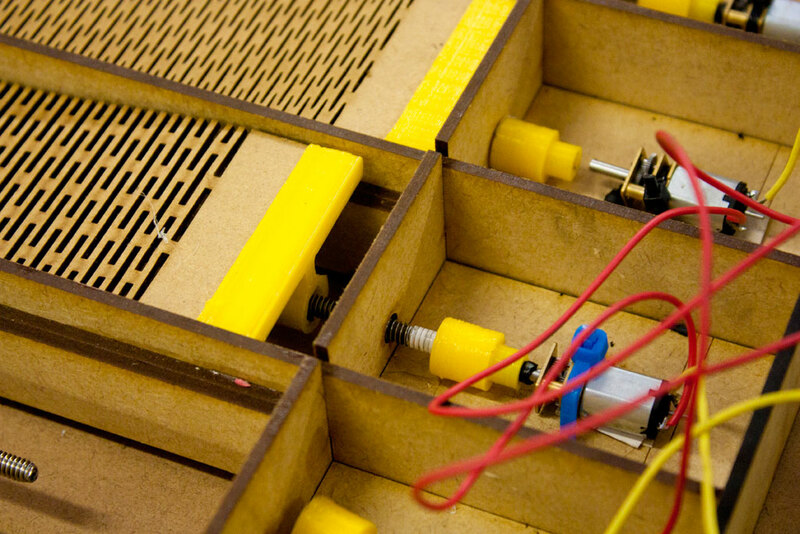 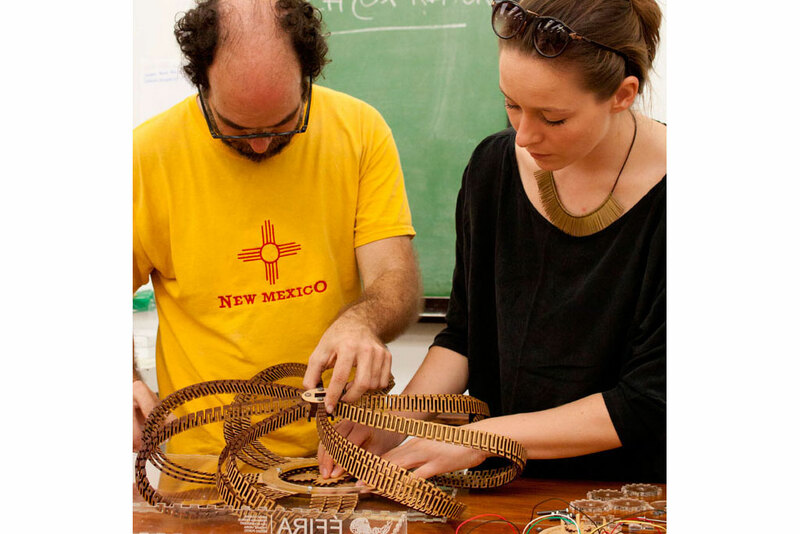 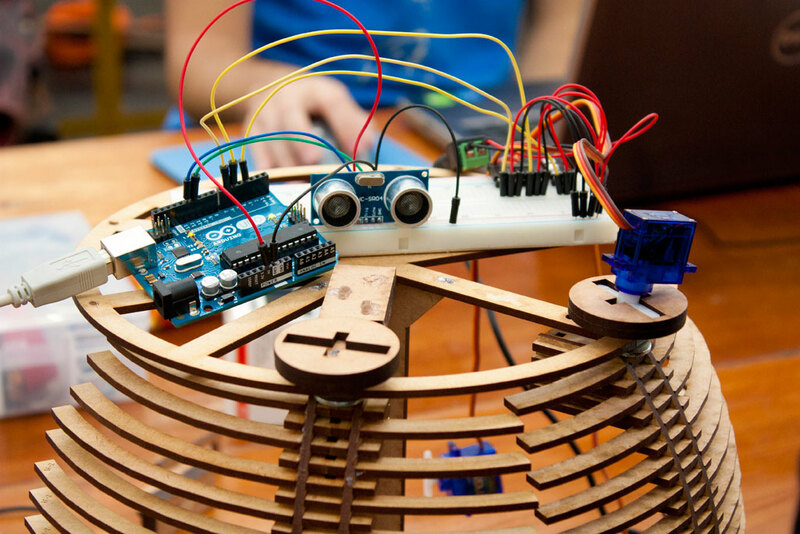 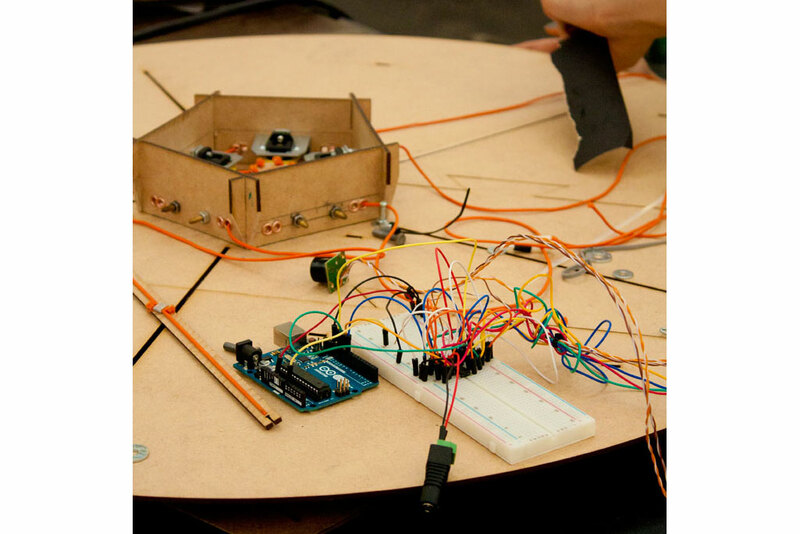 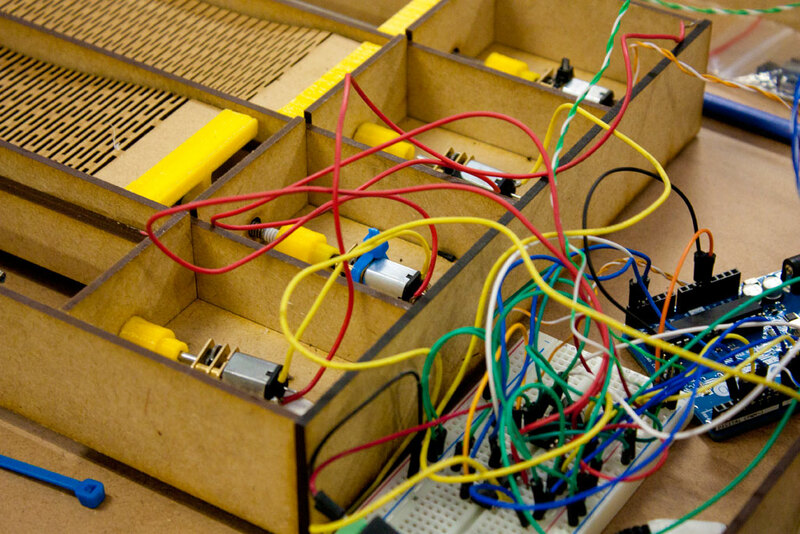 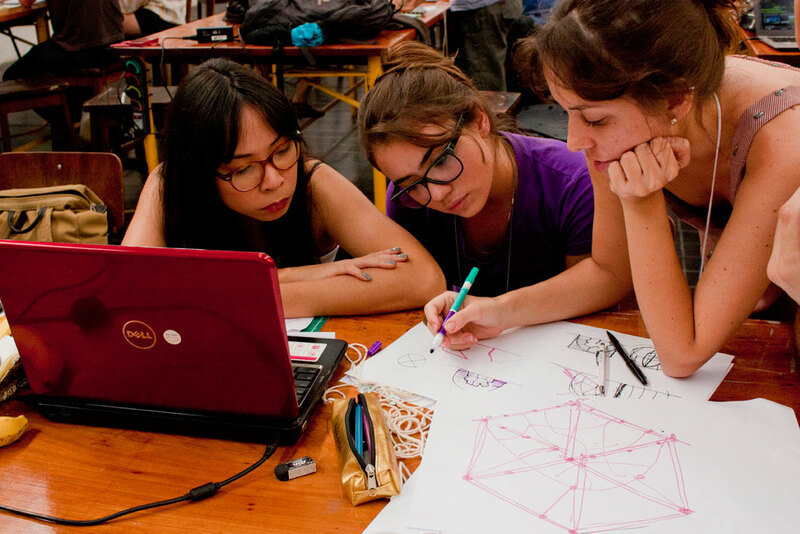 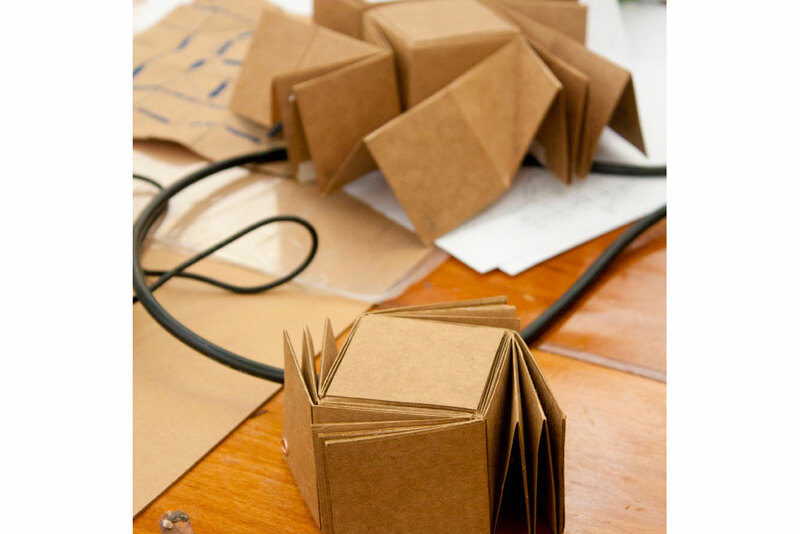 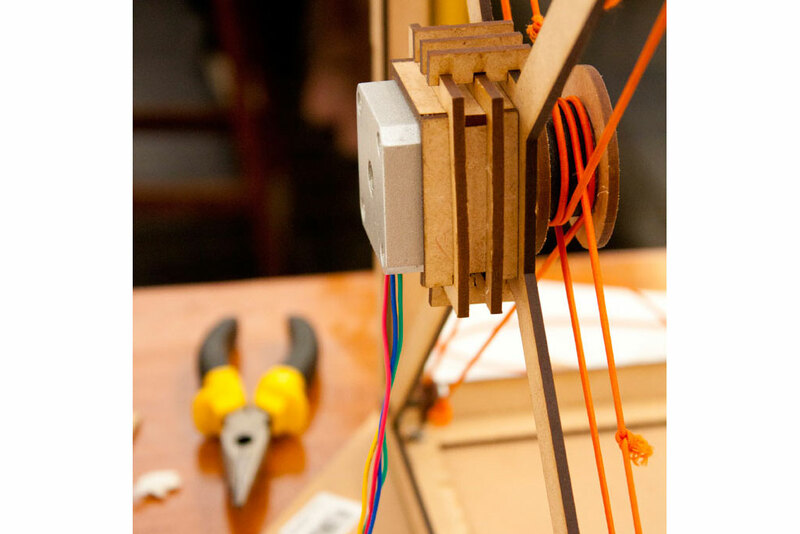 Each workshop will offer introductory instruction in computational design (grasshopper, processing and arduino) and digital fabrication, while advanced instruction in computation and digital fabrication will be given for participants of multiple workshops. 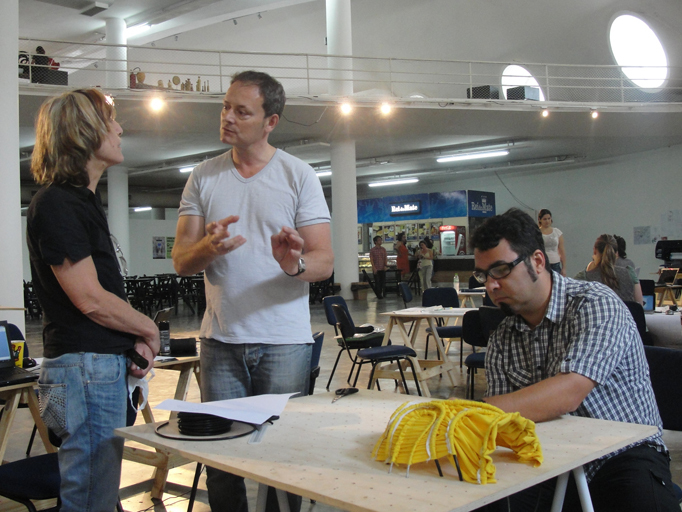 2011 BARRACÕES DE SAMBA – PORTO DO RIO AA Rio de Janeiro Design Workshop 5- 14 April 2011 Complementing the venues associated with Rio de Janeiro’s annual Carnival, 2014 World Cup and 2016 Olympic Games, this workshop will explore alternative, informal and grass-roots sports and cultural programmes as a way of transforming precarious urban environments and communities and help guarantee a community legacy for these global events. 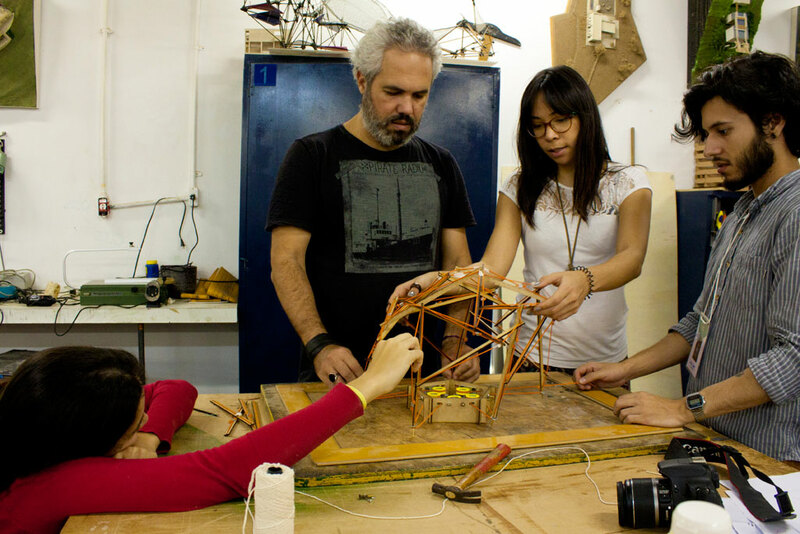 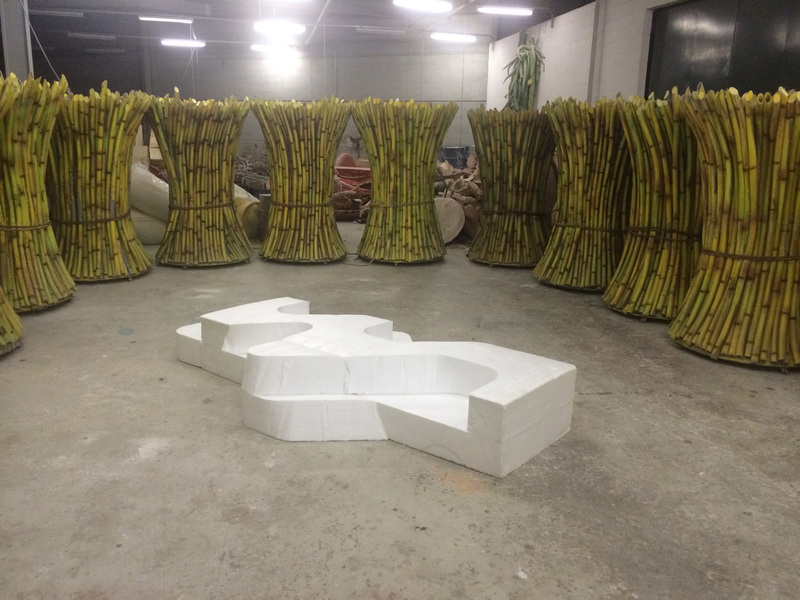 The 10-day workshop will promote a design philosophy that mediates between global and local sensibilities, between formal and informal economies, and between high-tech and low-tech fabrication processes. 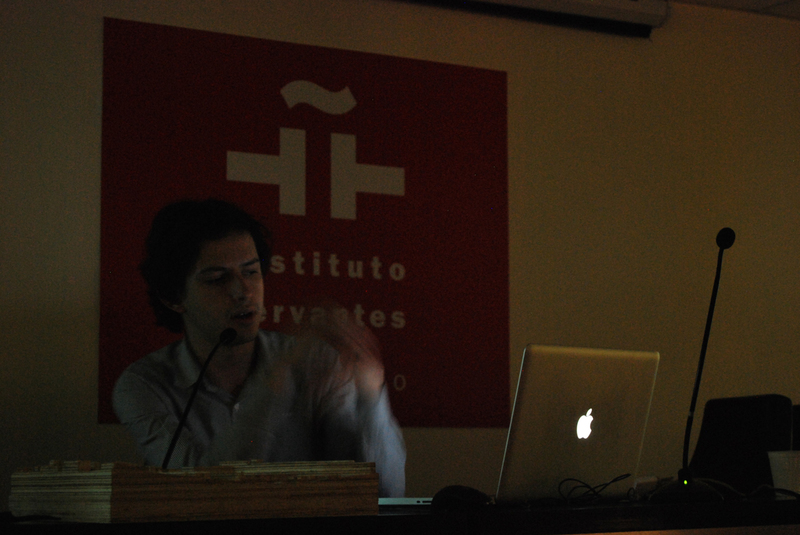 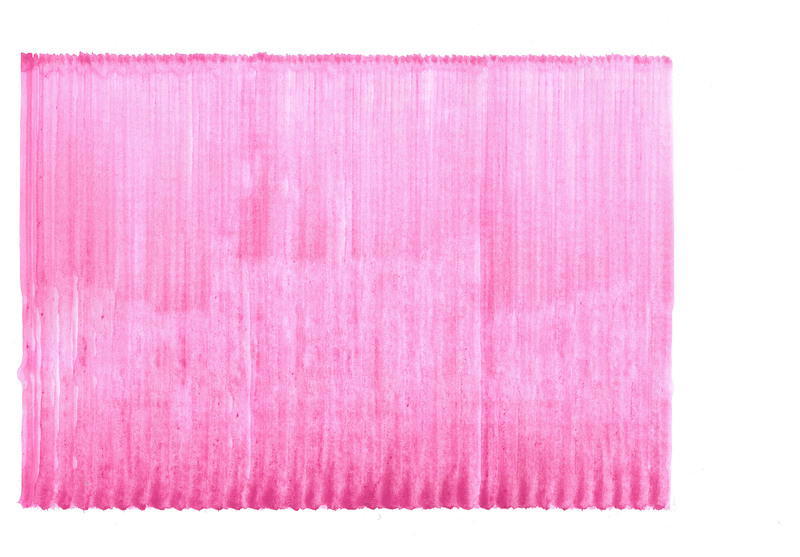 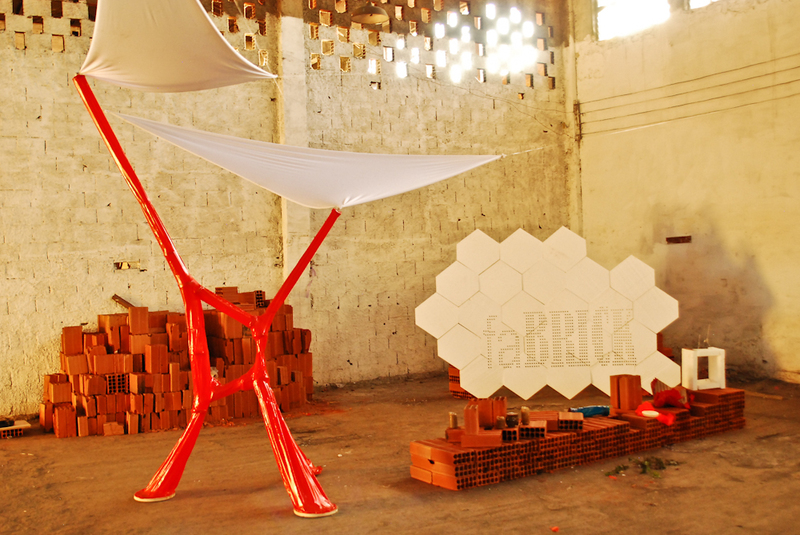 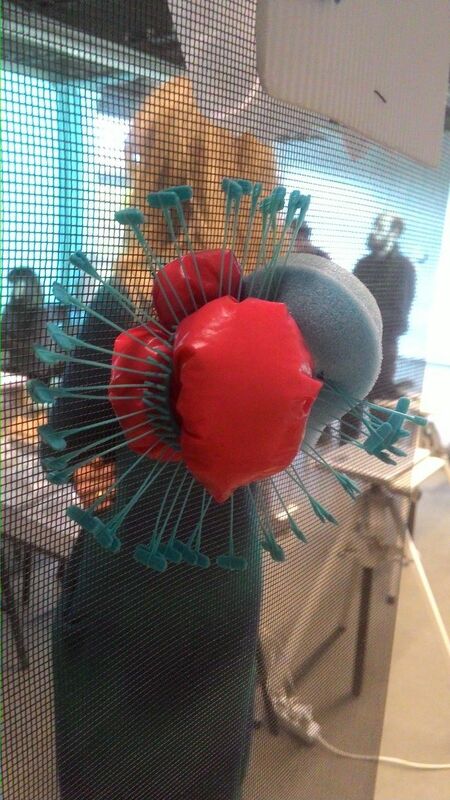 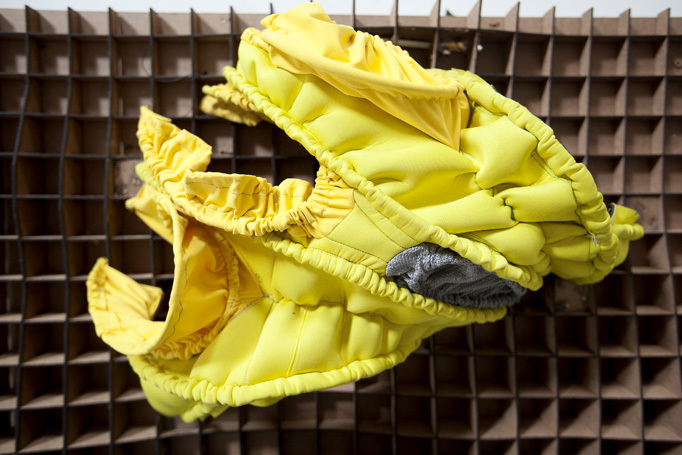 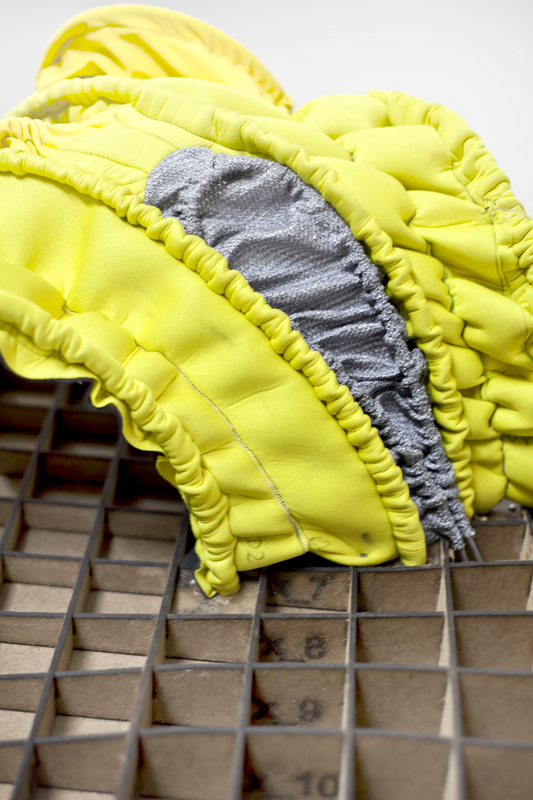 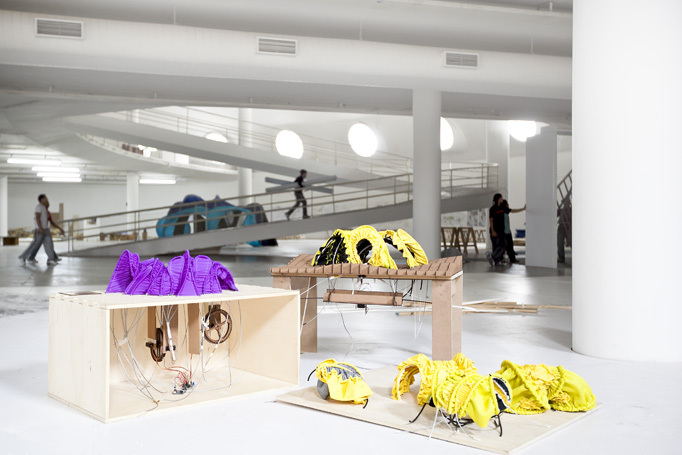 In contrast to imported and pre-fabricated end-products, it will employ a hybrid methodology, using raw goods (matéria prima) and other found-objects (inspired by the work of artist Ernesto Neto and the Campana Brothers), yet evolving these projects with novel computational-design and fabrication techniques that emphasise the introduction of component-based logics. 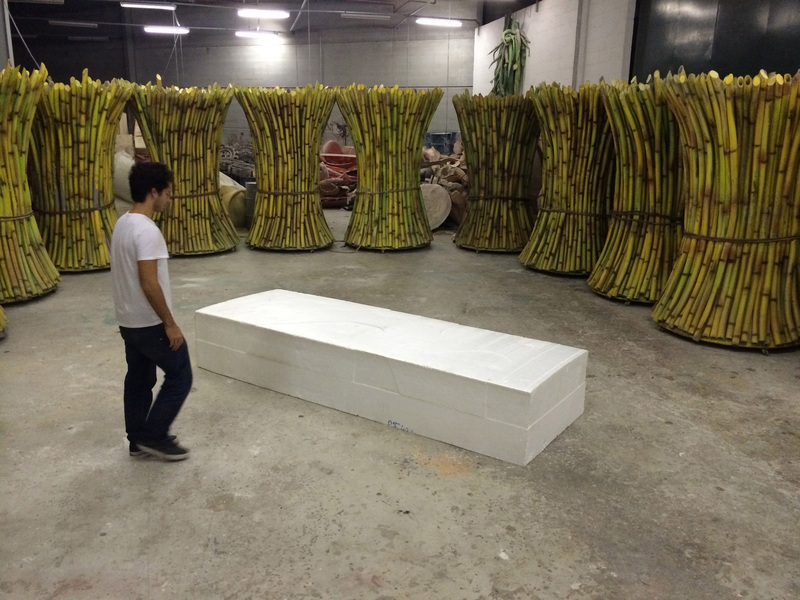 The workshop itself will take place almost 40 days after the Carnival, to explore the re-use of the actual Carnival floats, costumes and other related paraphernalia, collaborating with several Escolas de Samba located in the post-industrial empty warehouses of the Porto area, the birthplace of the Carnival and Samba. 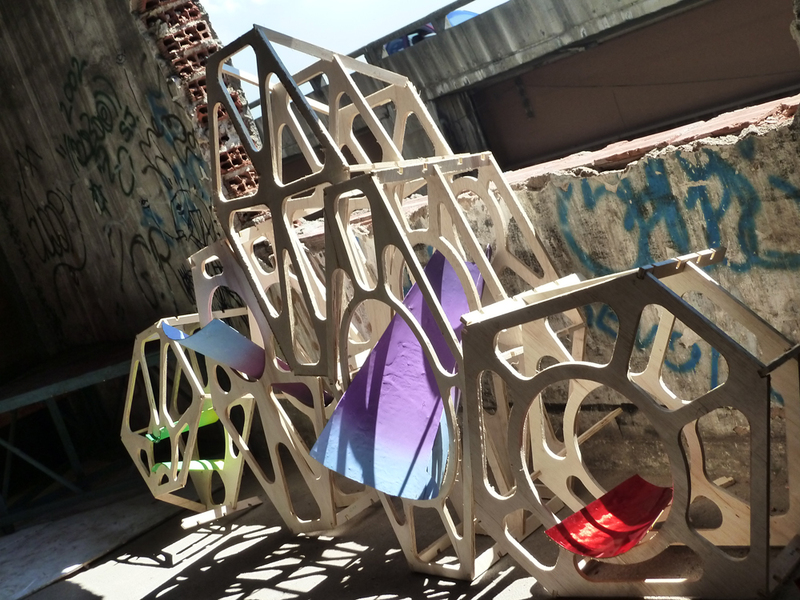 The recyled Carnival material will be transformed using digital fabrication processes and new digitally fabricated joint components, to create interventions for micro-venues and urban furniture in the Porto region, to support open cultural and sports events that engage the local populations and both counter and complement the large-scale constructions of Olympic sports venues. 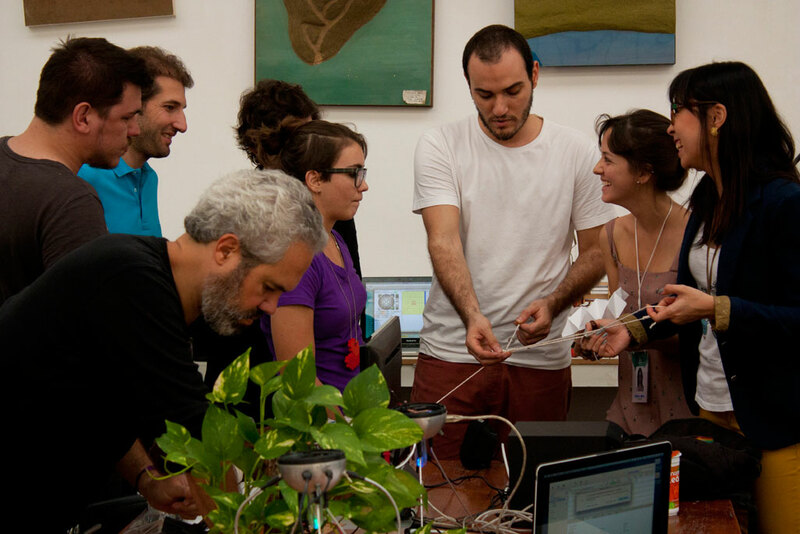 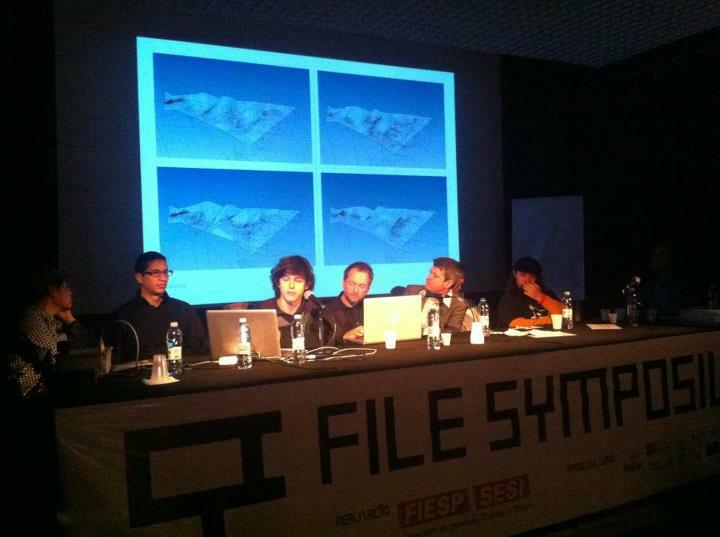 FILE- ELECTRONIC LANGUAGE INTERNATIONAL FESTIVAL- CENTRO CULTURAL FIESP 12–21 JULY 2011 The aim of this programme is to rehabilitate environments, populations and materials through the use of innovative computational ecological design and digital fabrication processes. 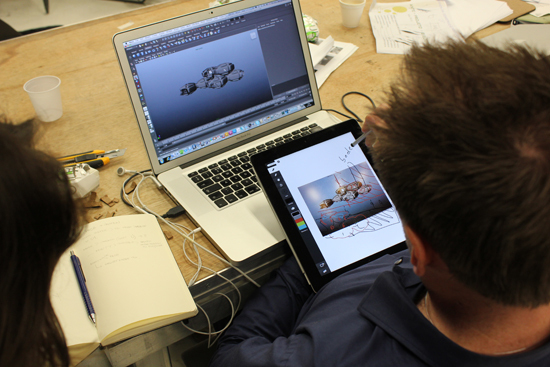 With these tactics we will define a new generation of digital design that employs both high-tech and low-tech strategies. 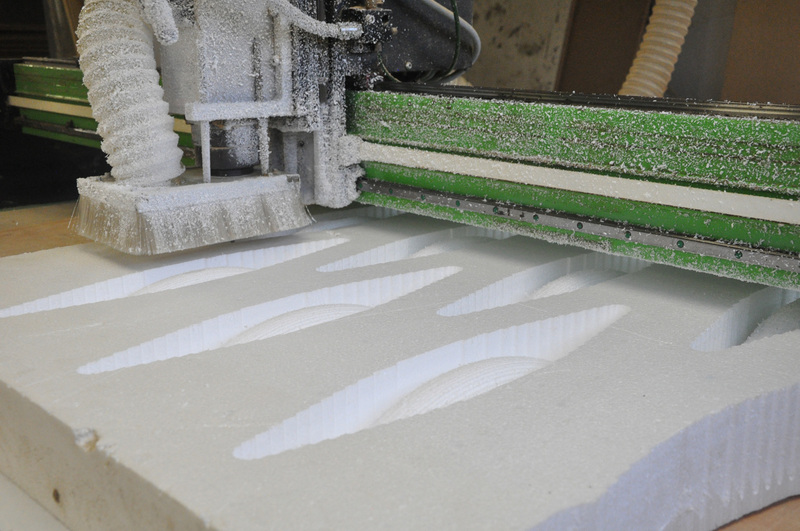 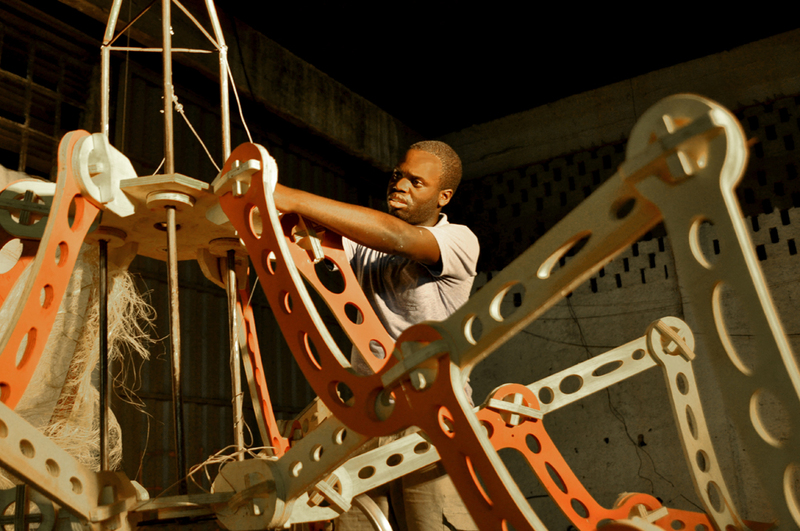 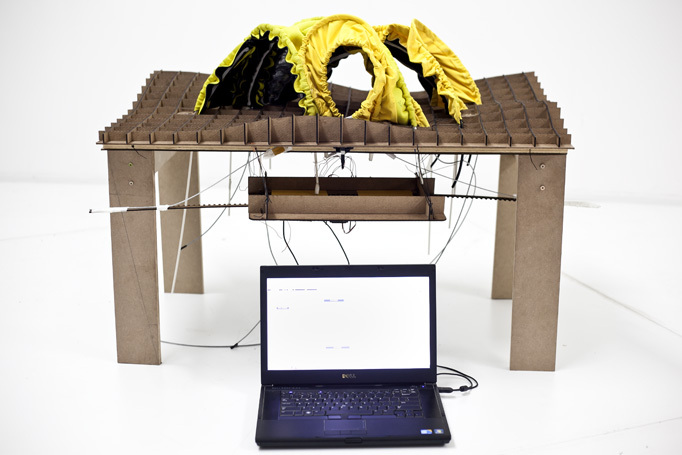 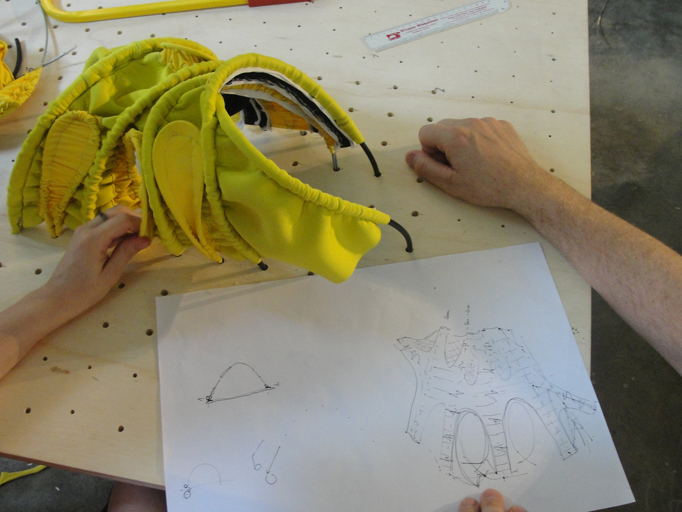 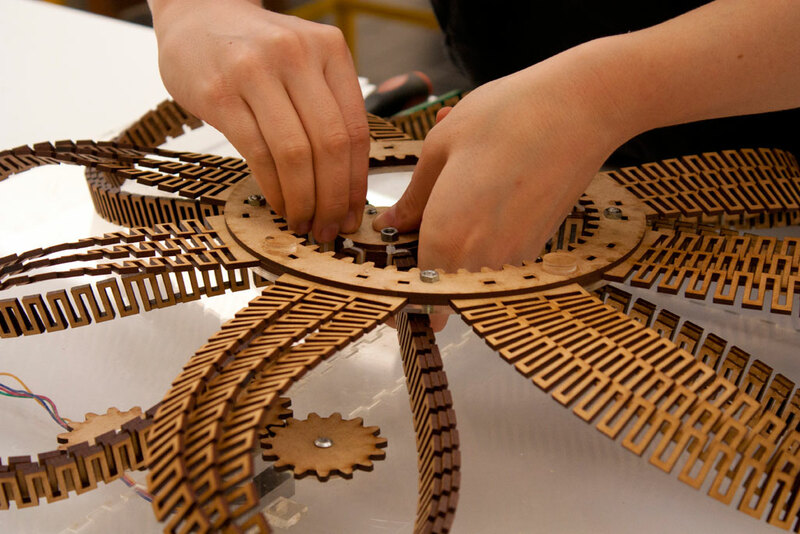 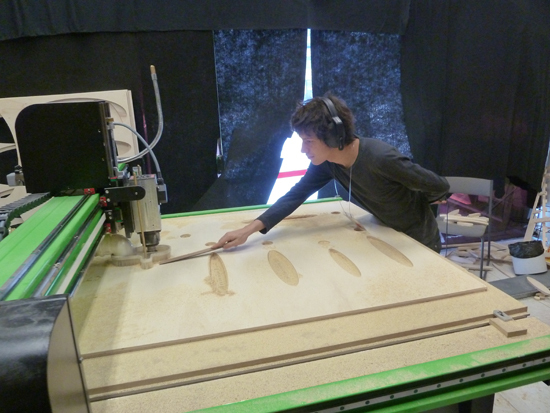 Parametric design generation and digital fabrication techniques will be used to computationally redesign low-tech building strategies, mixing high-tech exper­tise with local labour knowledge. 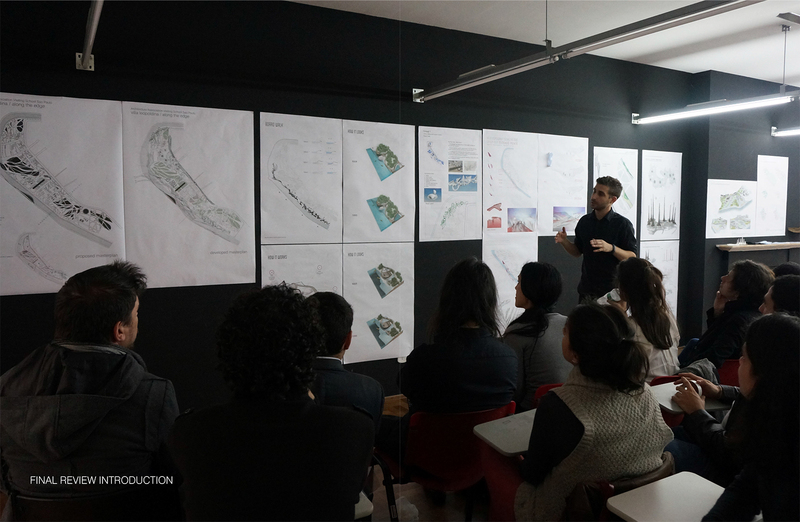 One objective of the workshop is to transform sustainable design strategies so as to bring to ecological design a new aesthetic and social agenda. 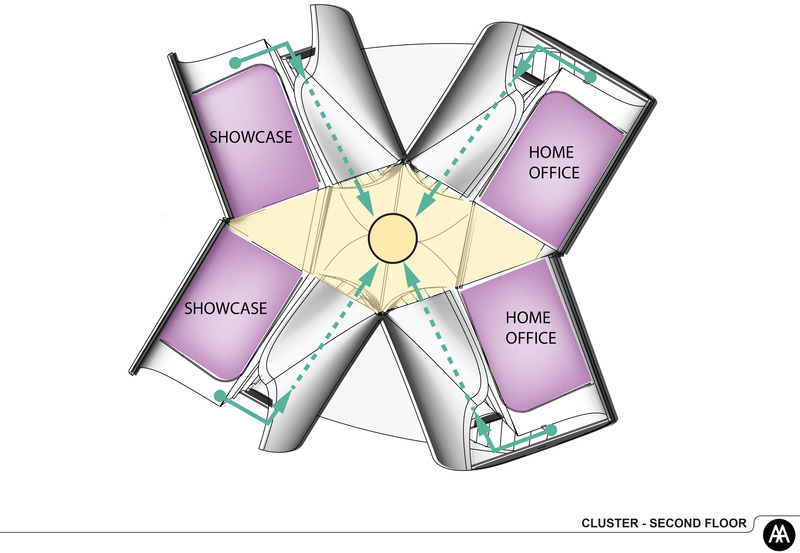 This high-tech/low-tech strategy will include environmental registration and mediation, using high-tech agent-controlled computational design and environmental and structural simulation, to design both high-tech and low-tech environmental mediation systems. 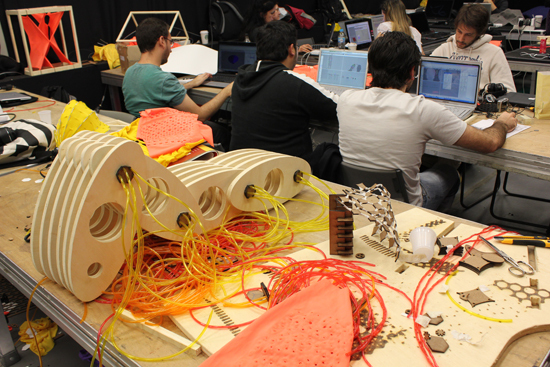 The workshop will script the calibration of devices to respond to multiple forces – structural and cultural as well as environmental forces. 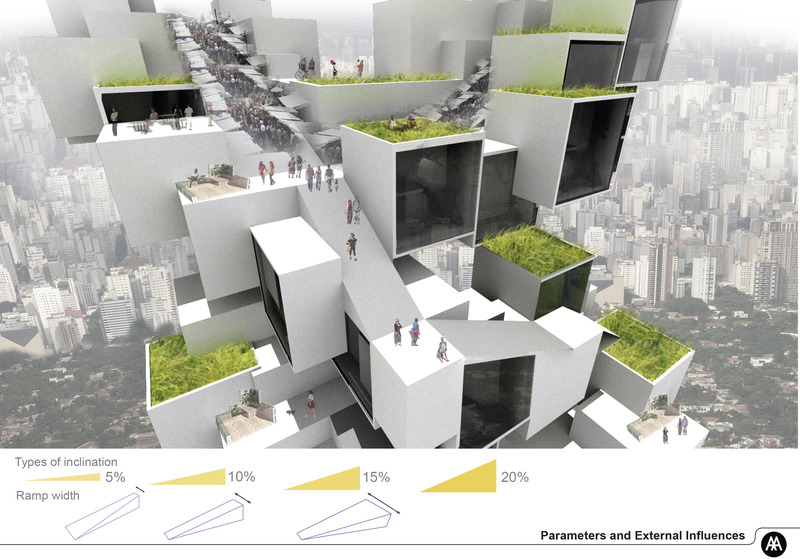 The goal is to create spatial organisations for various programmes, settings and building types, using different structured environmental devices and networking them within larger cultural and ecological systems of the urban setting.